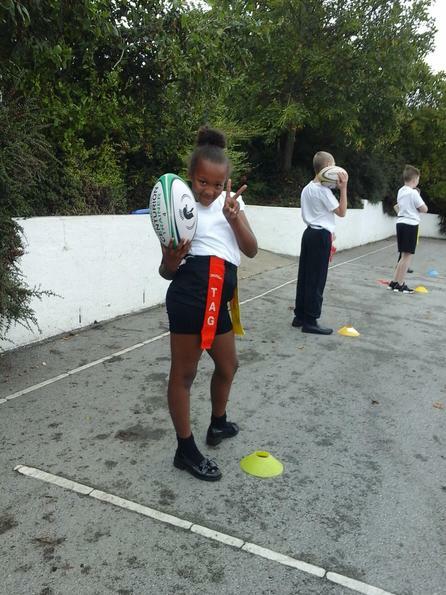 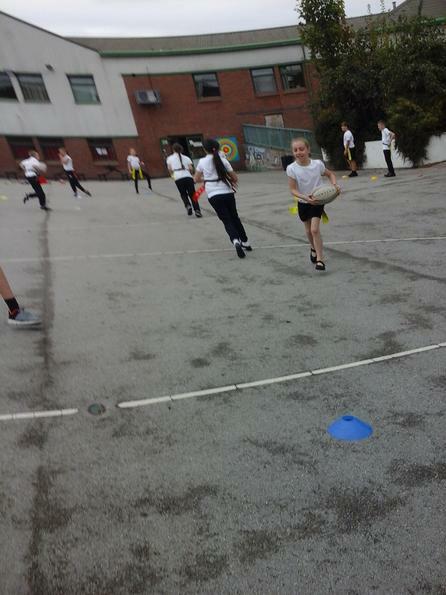 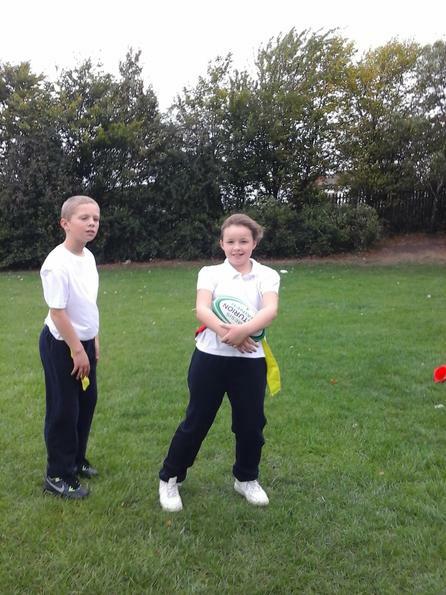 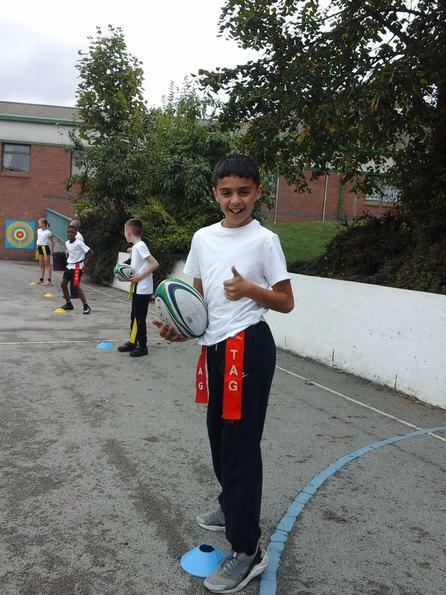 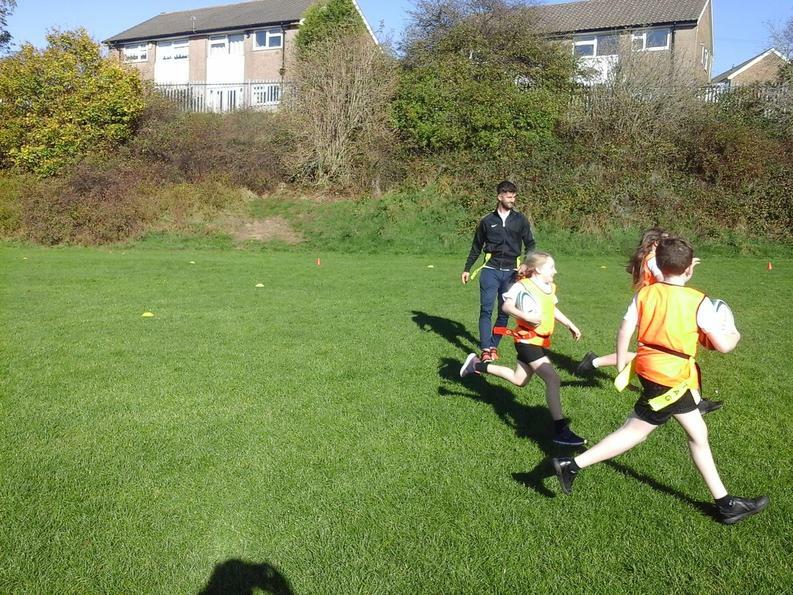 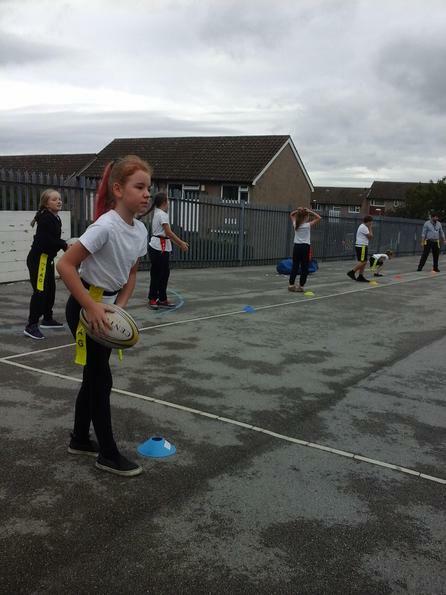 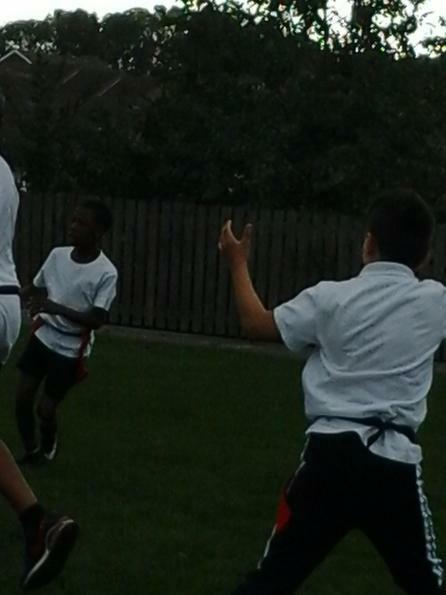 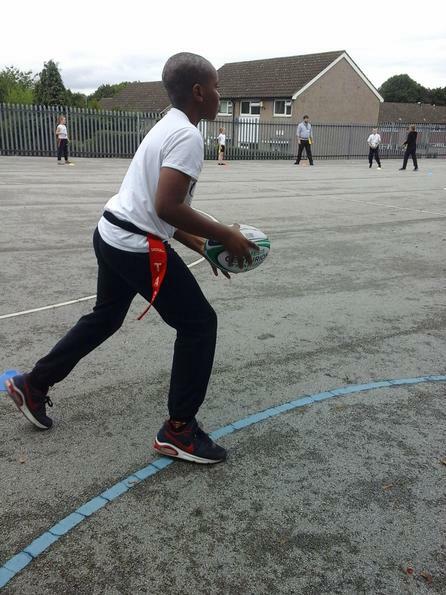 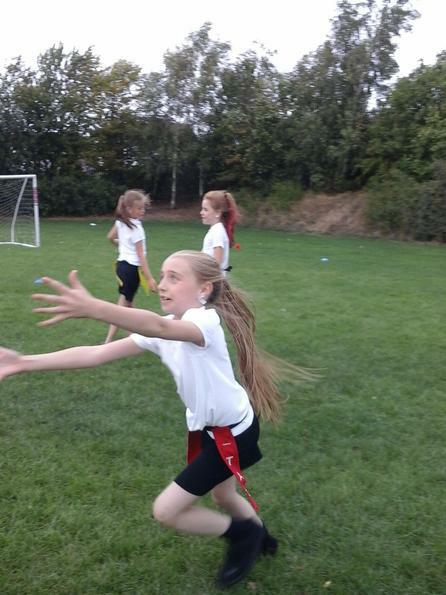 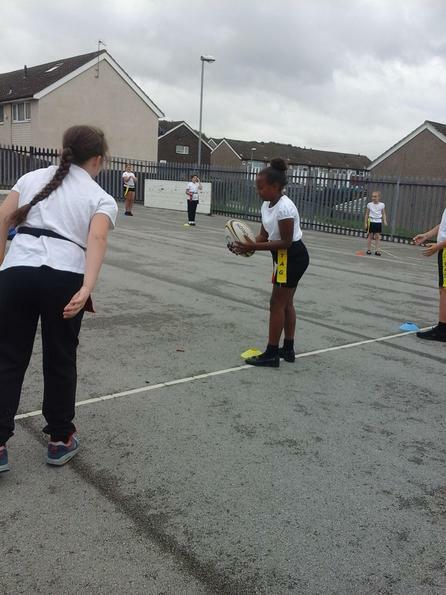 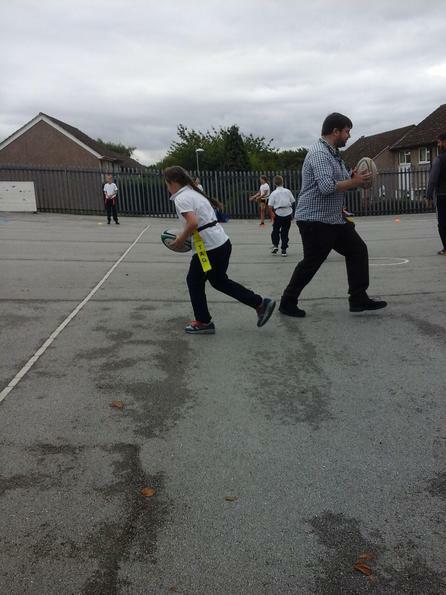 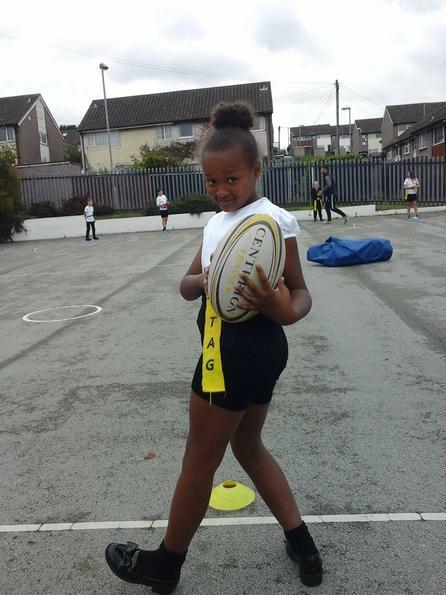 This term is PE, we are learning how to play Tag Rugby. 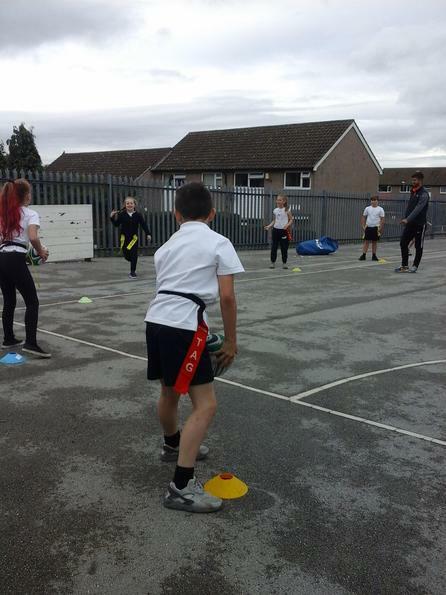 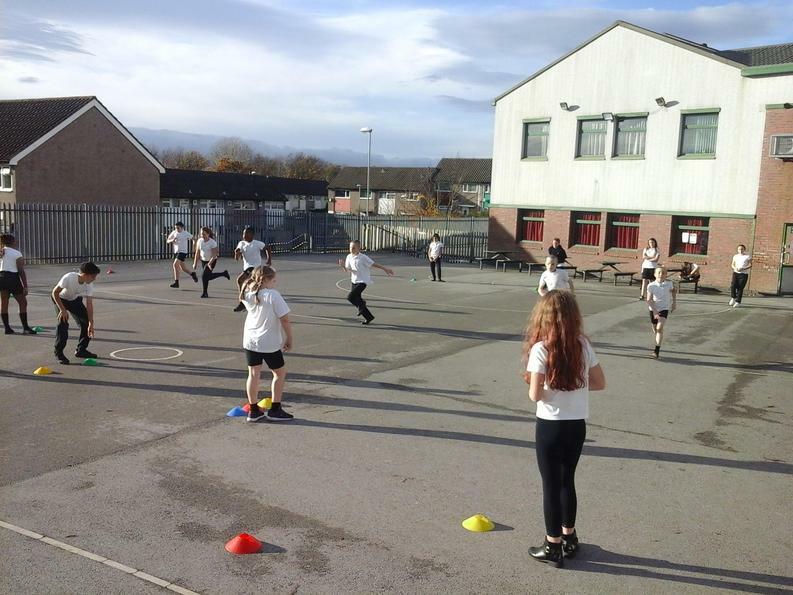 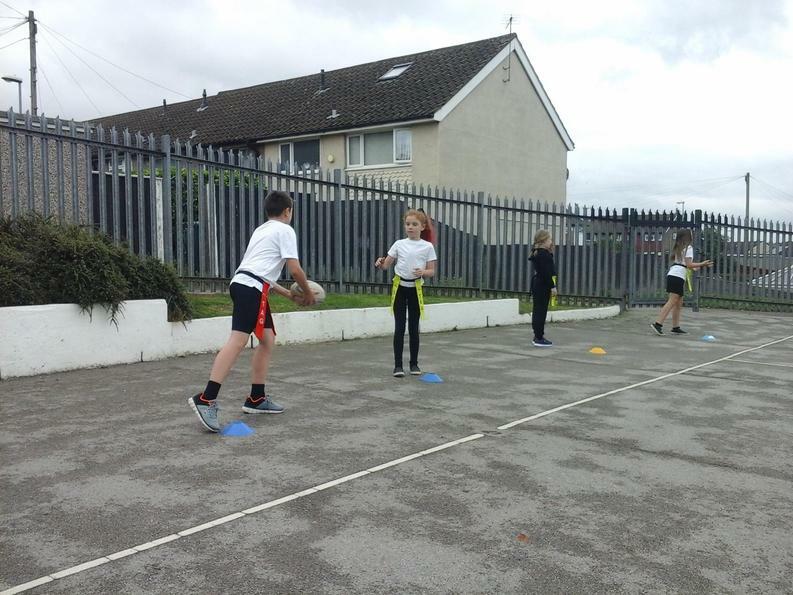 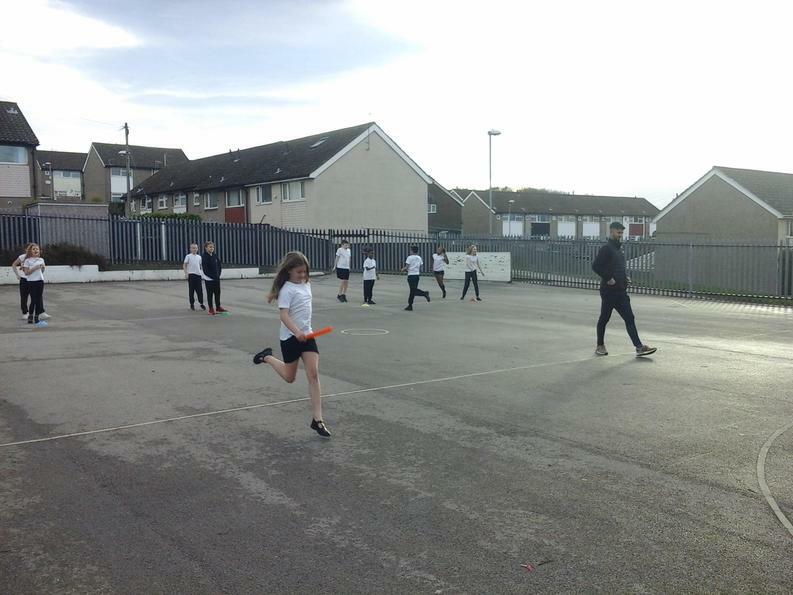 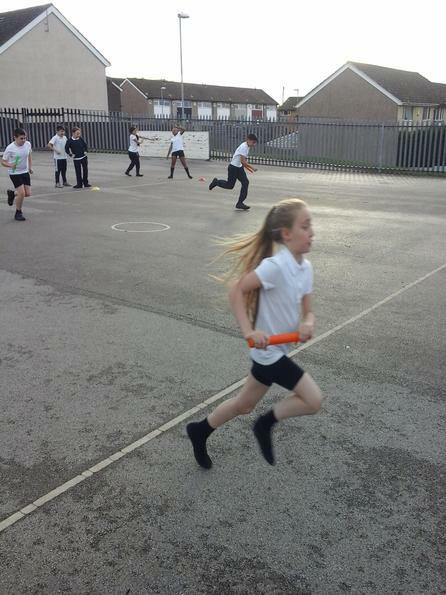 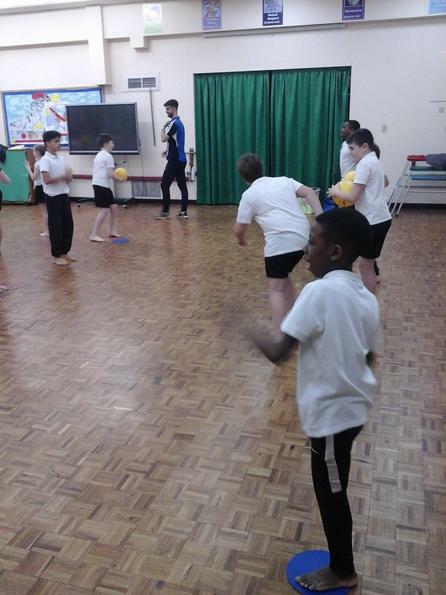 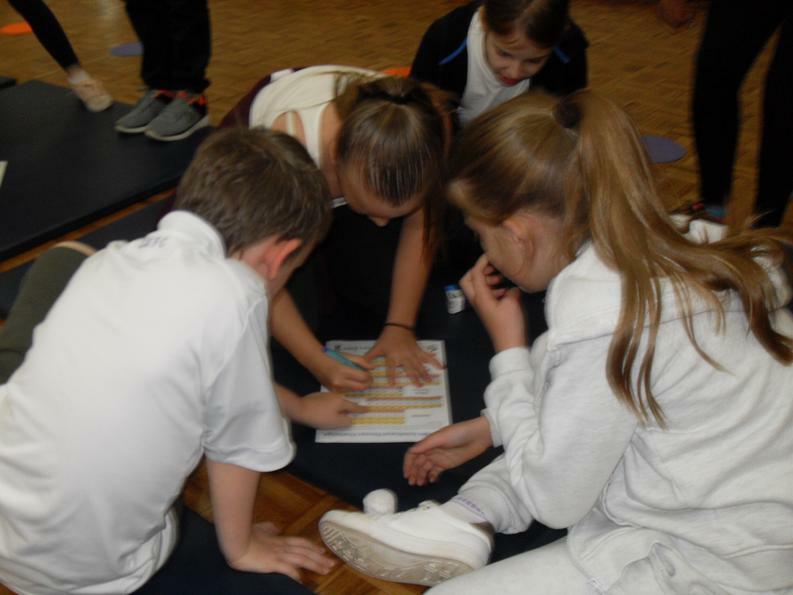 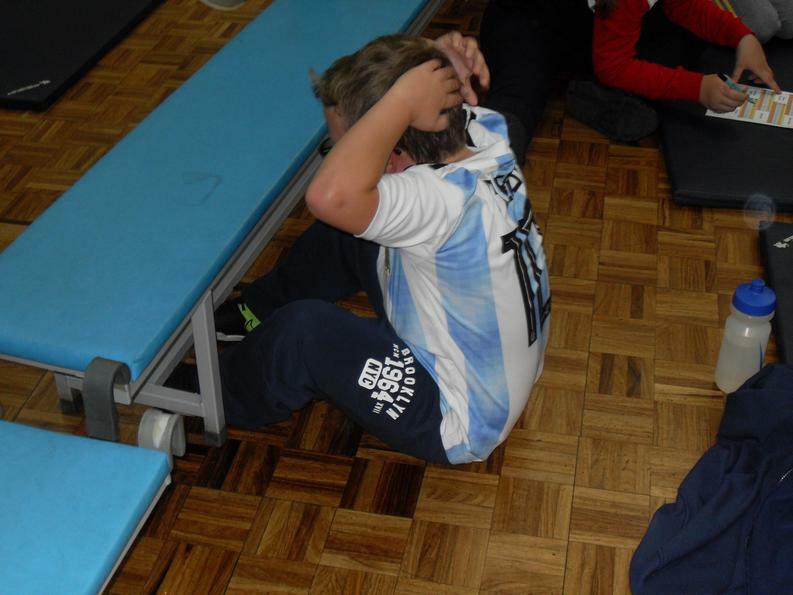 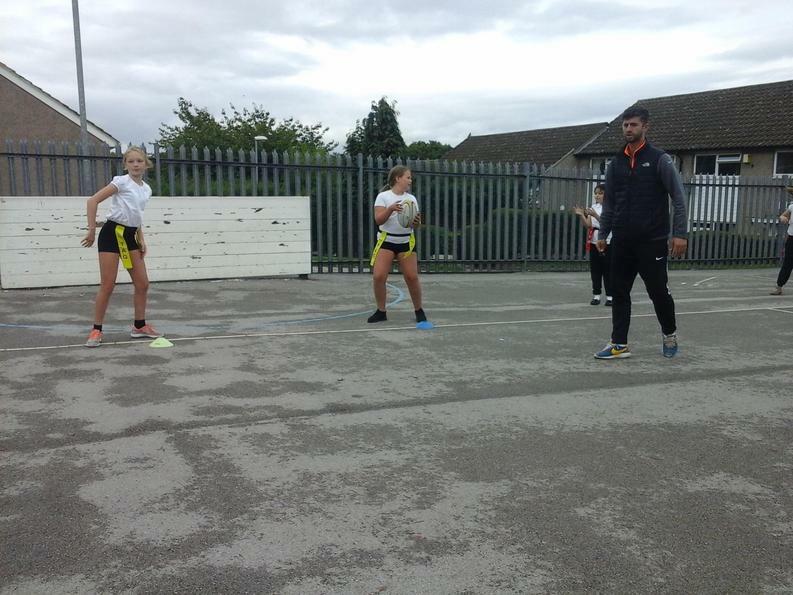 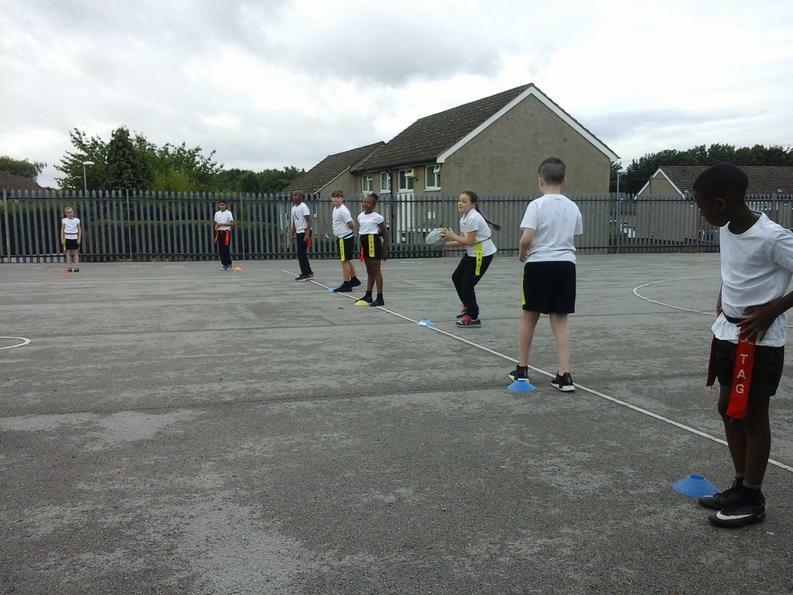 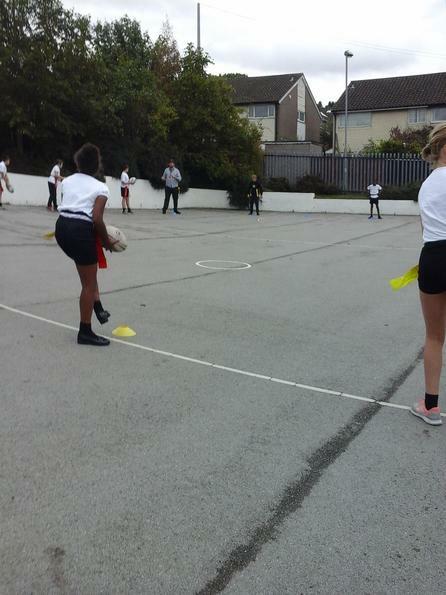 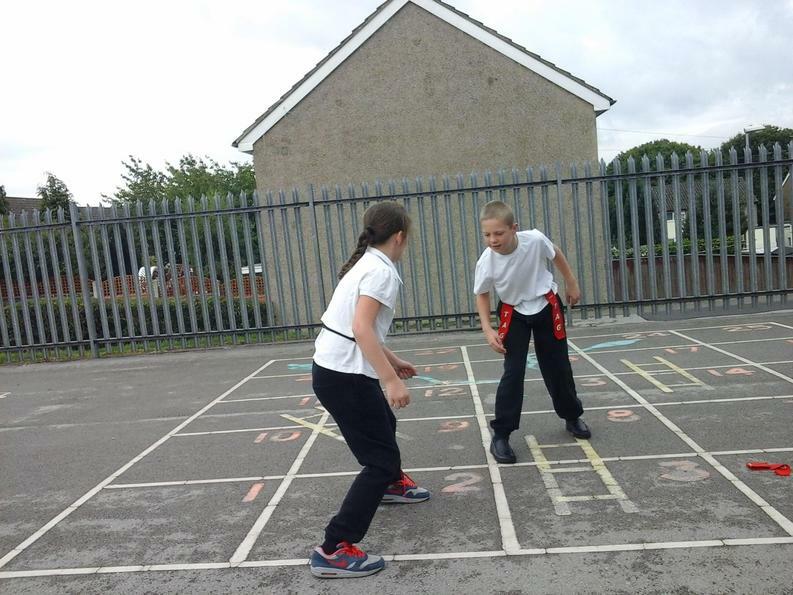 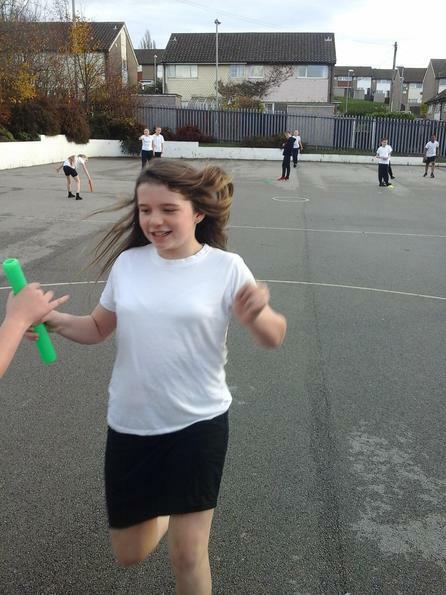 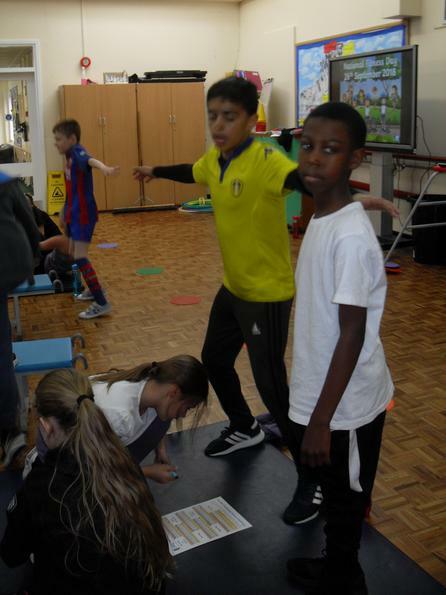 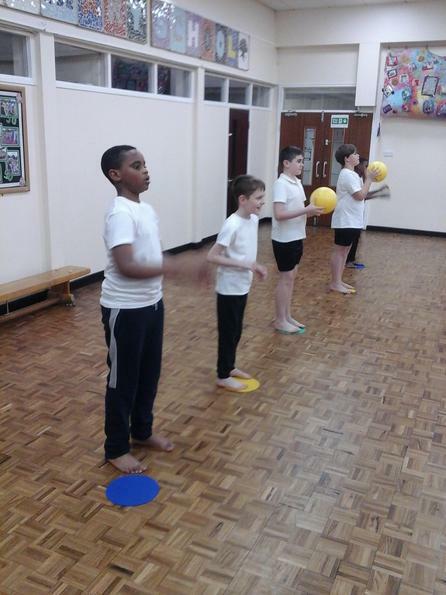 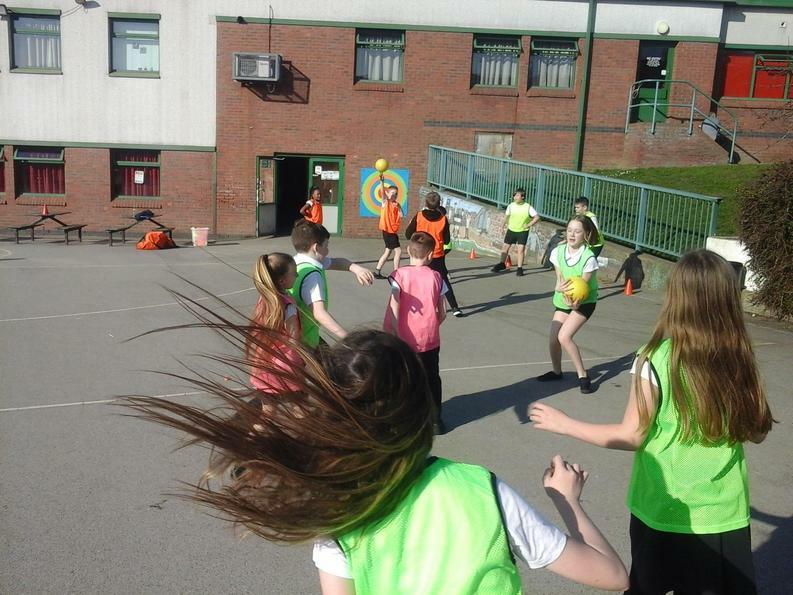 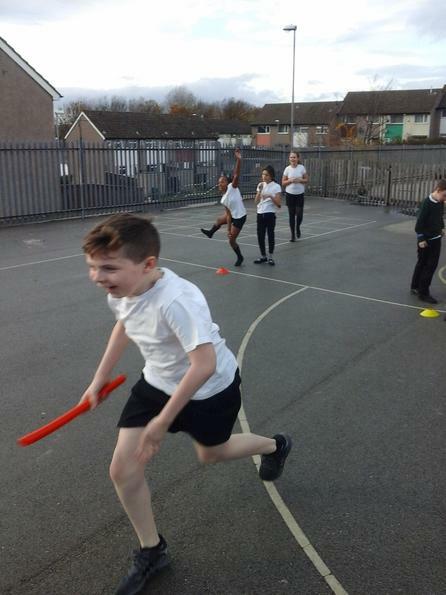 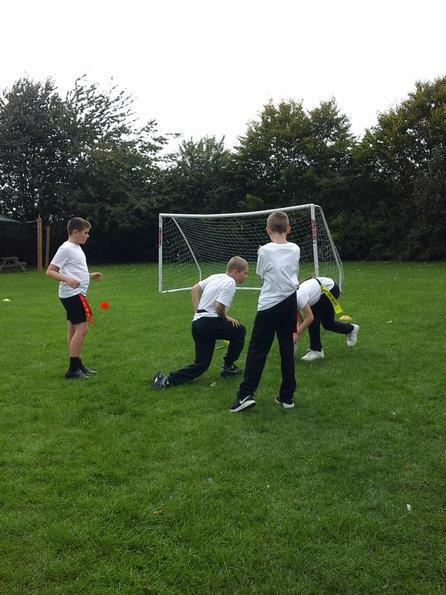 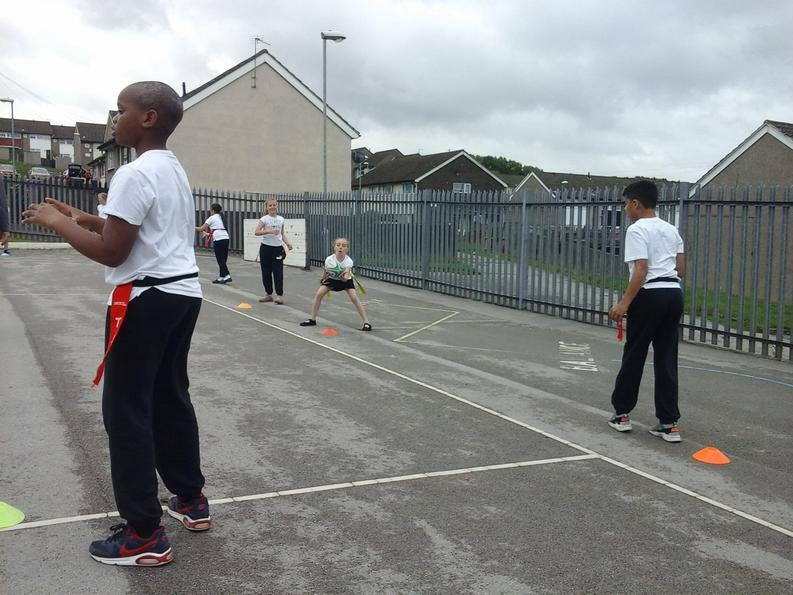 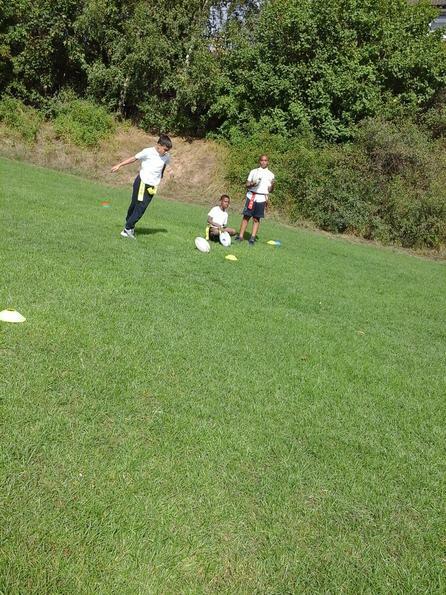 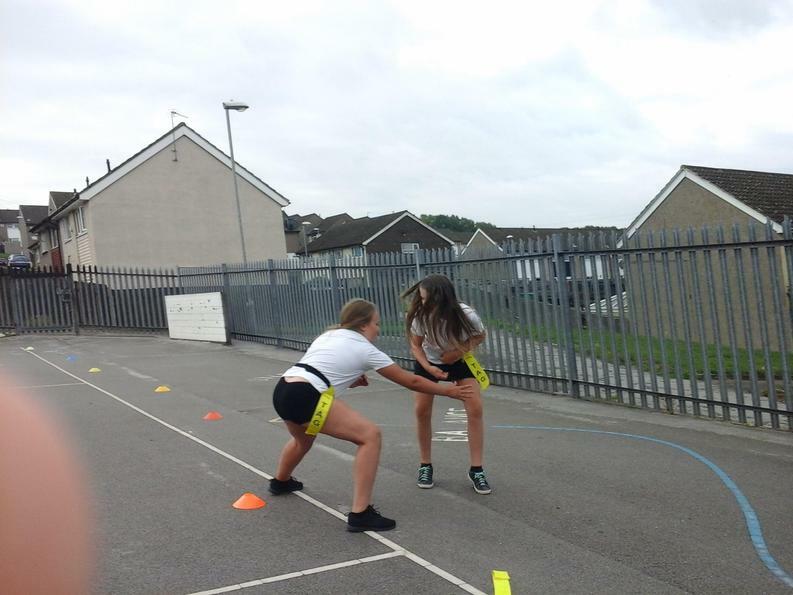 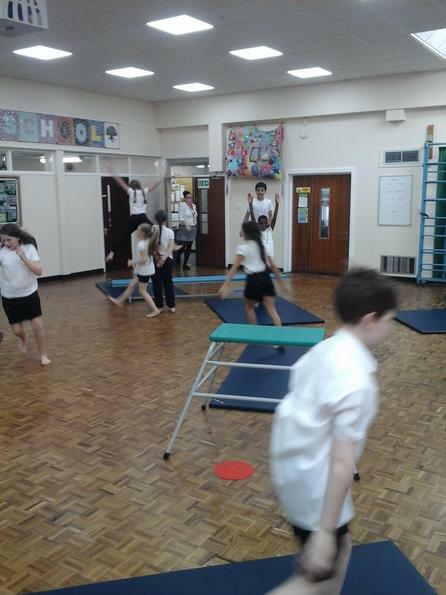 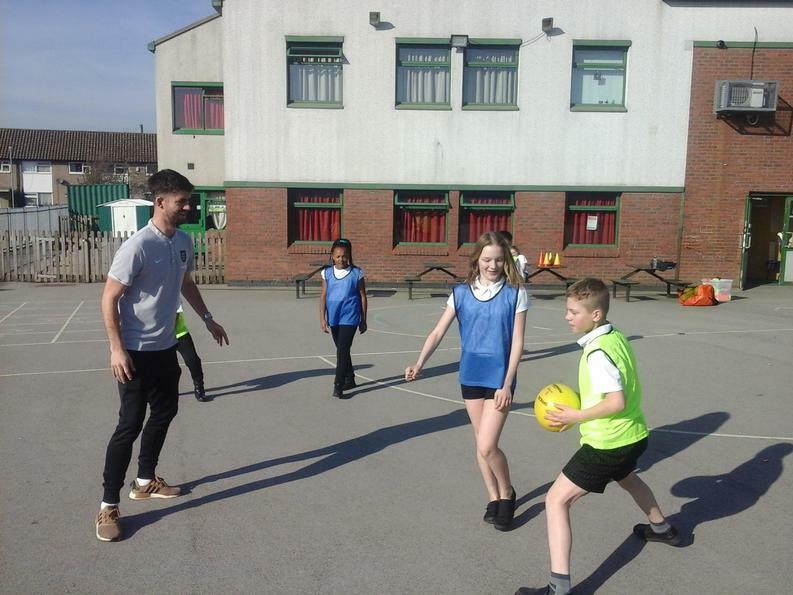 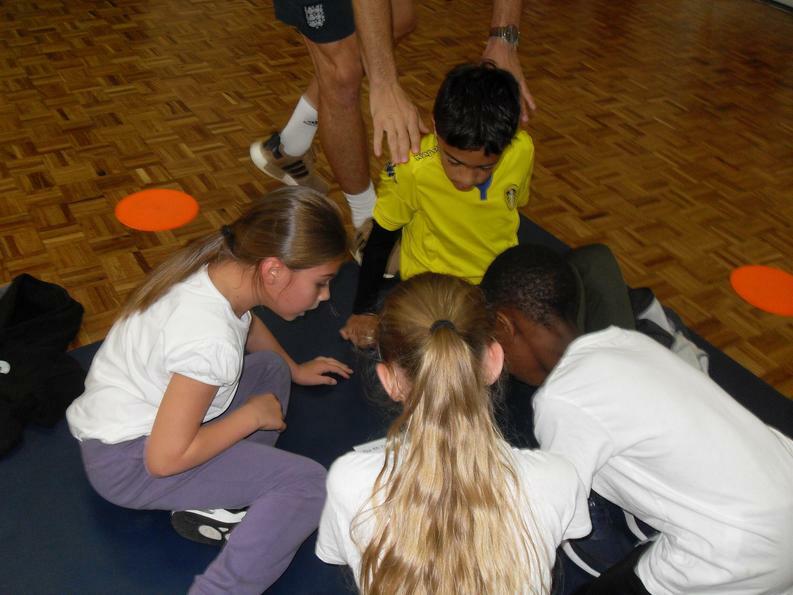 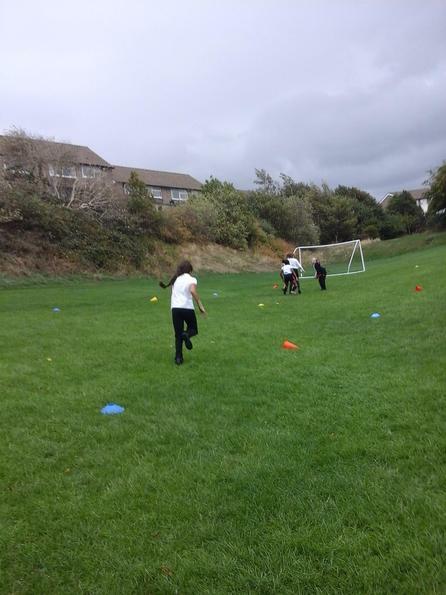 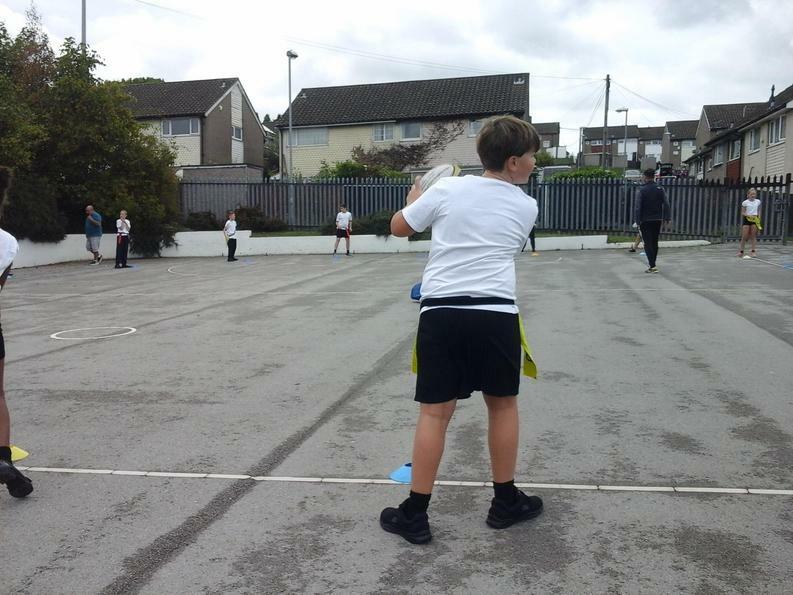 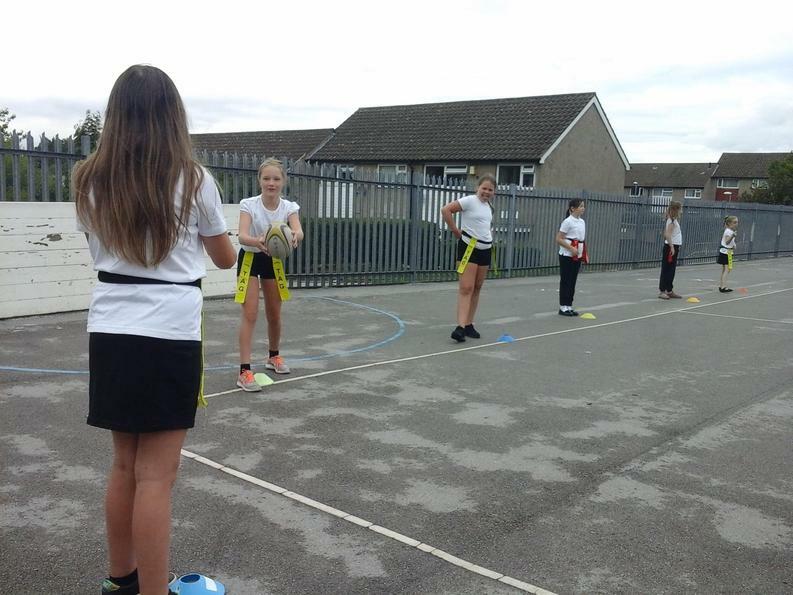 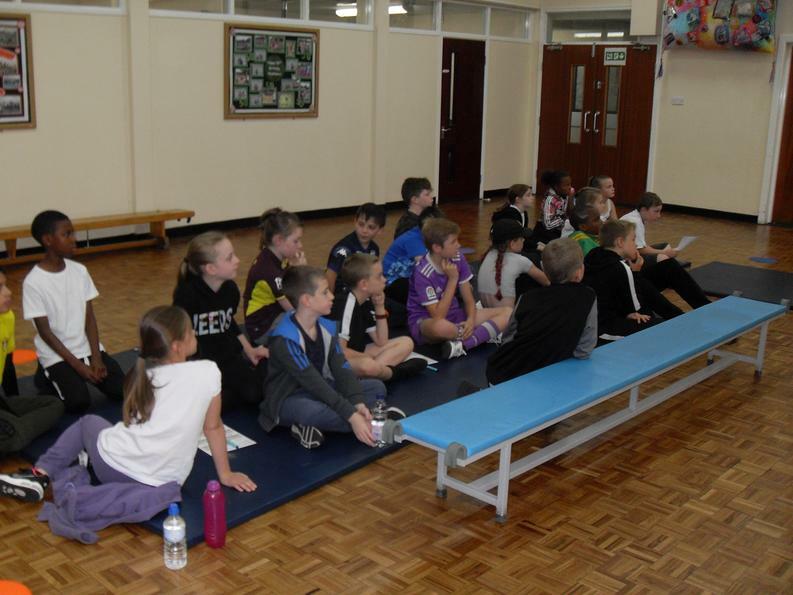 Our PE lesson this week involved a couple of games which helped us practice skills for playing the game. 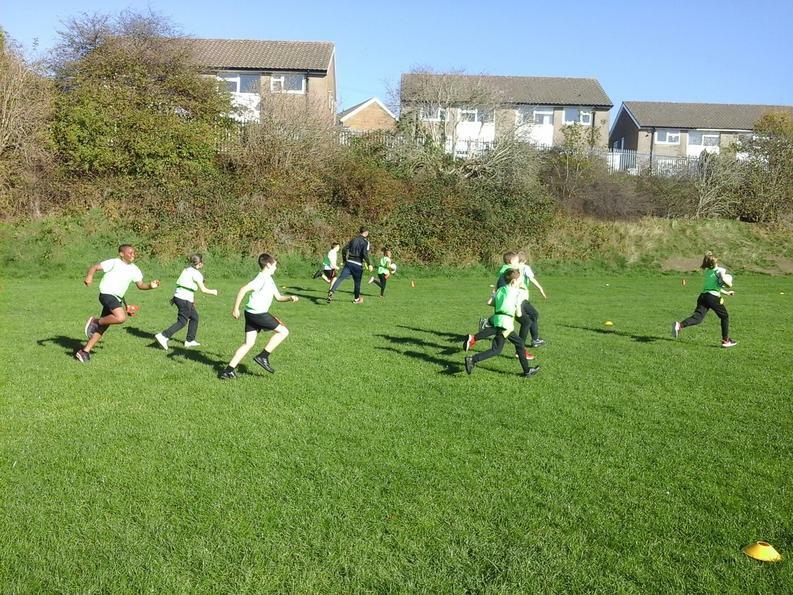 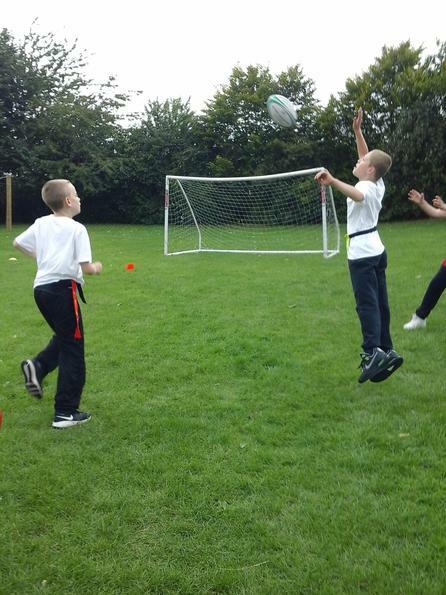 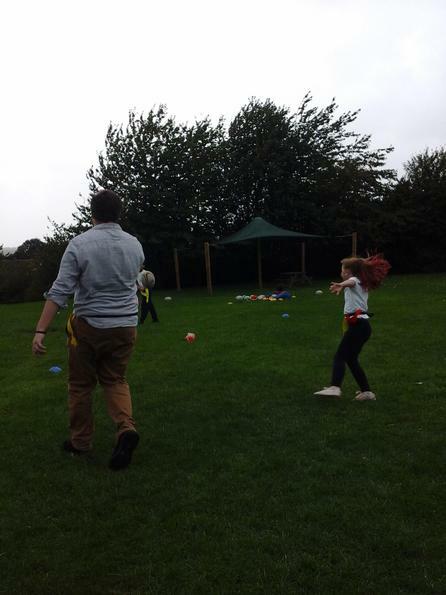 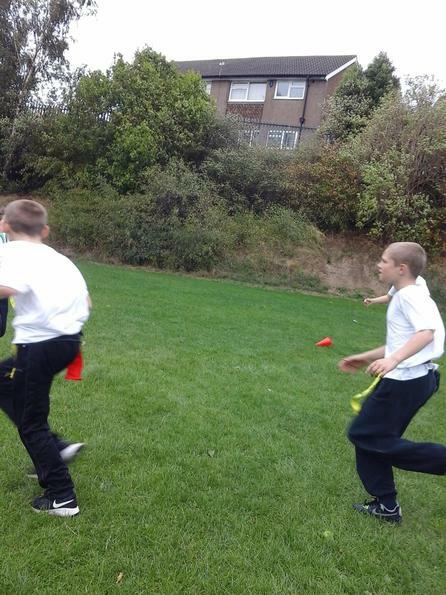 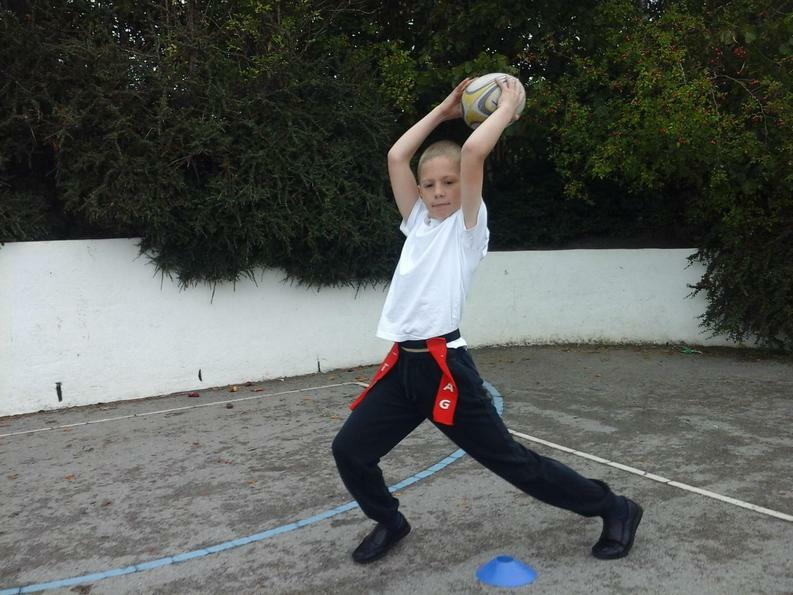 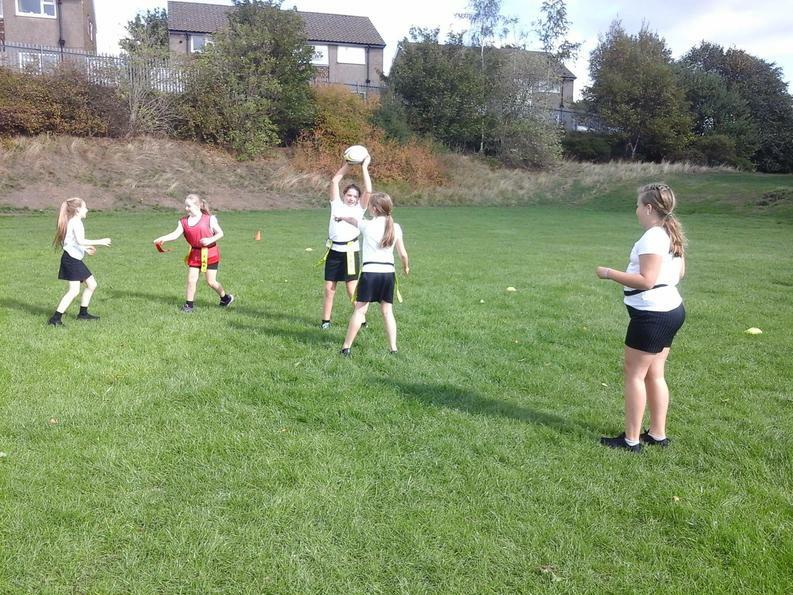 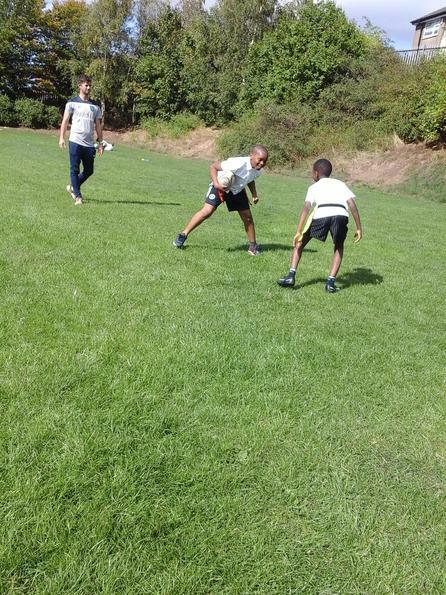 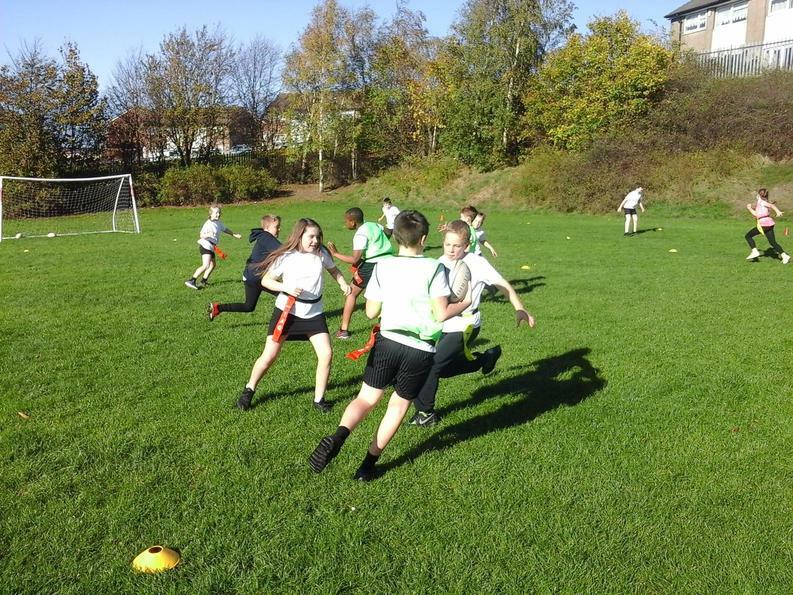 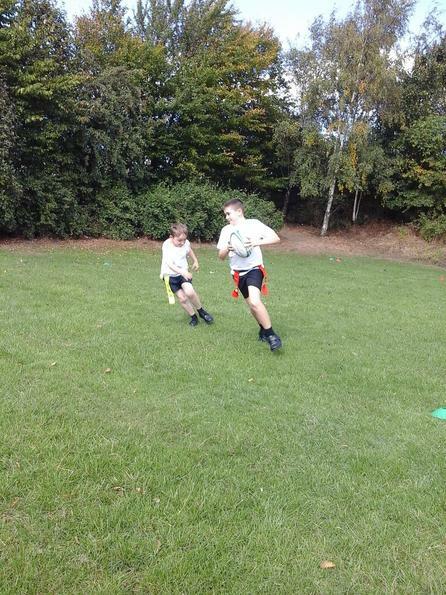 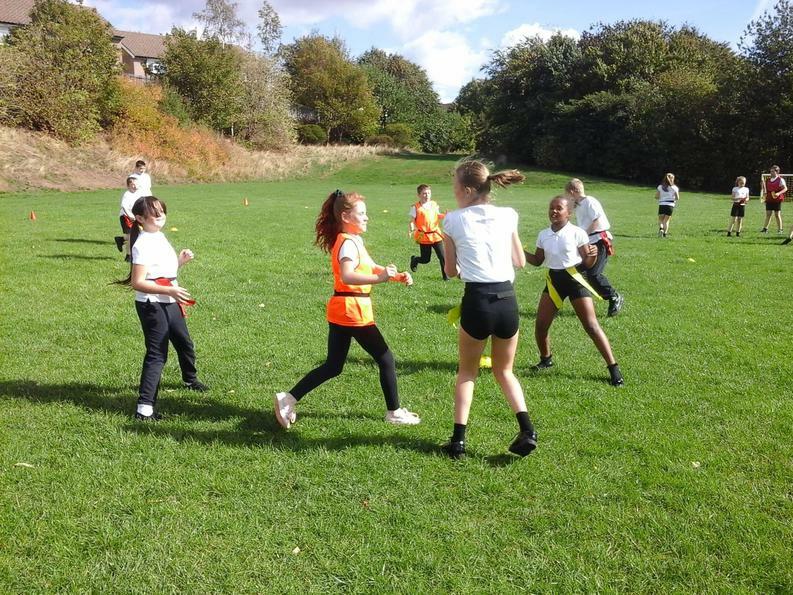 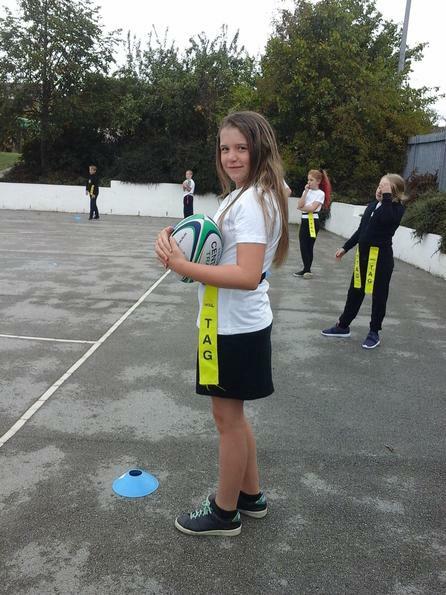 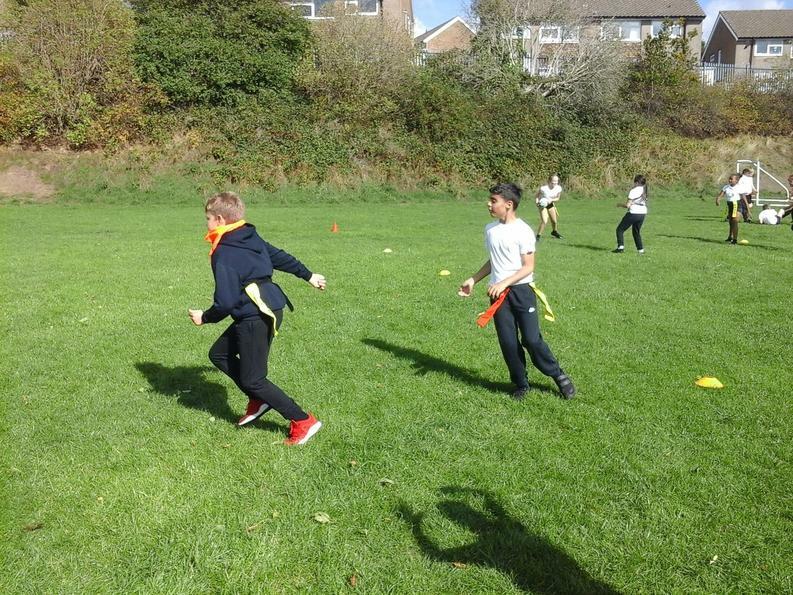 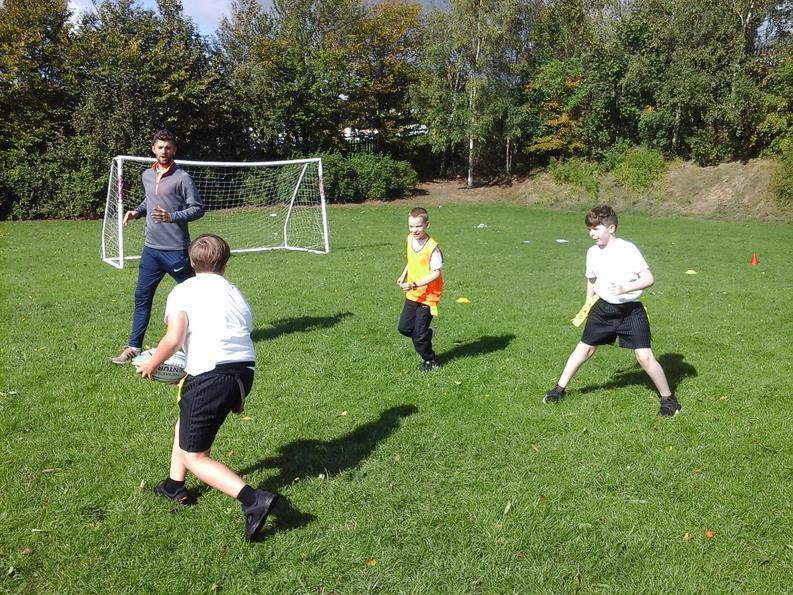 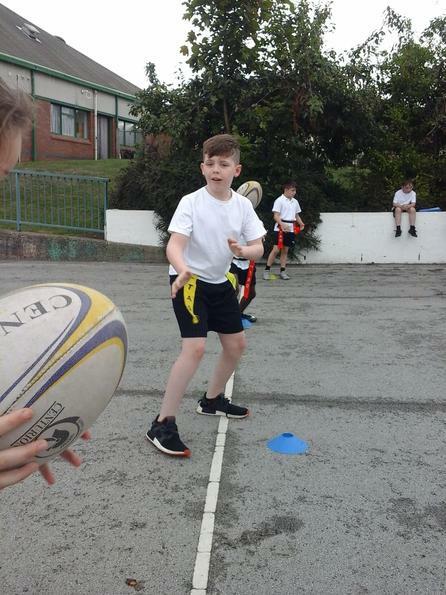 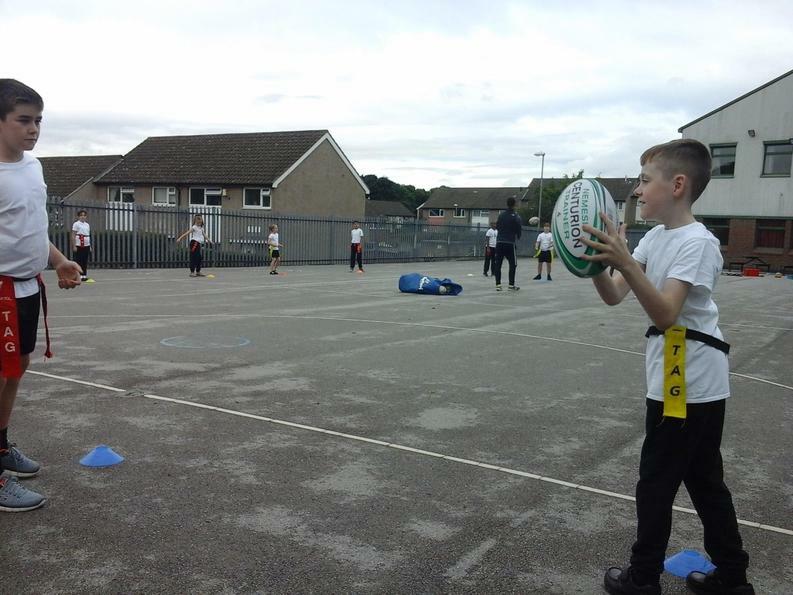 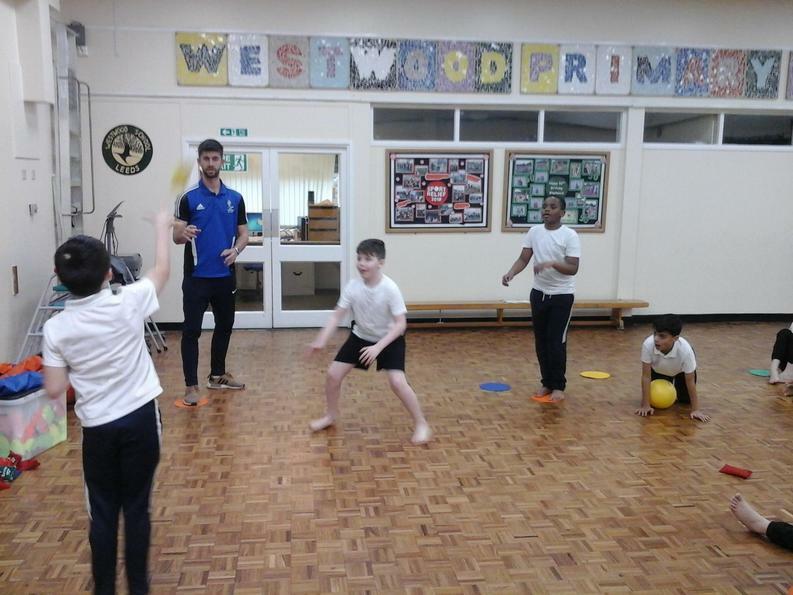 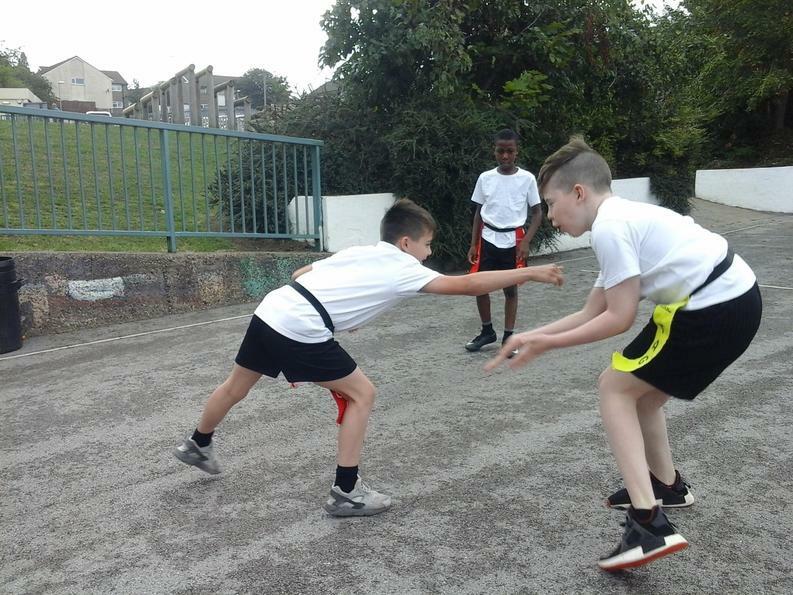 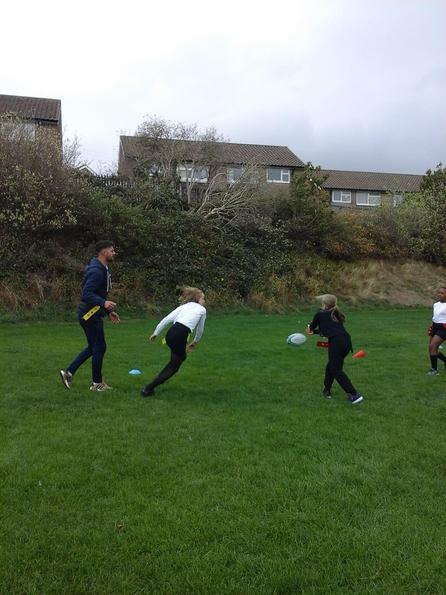 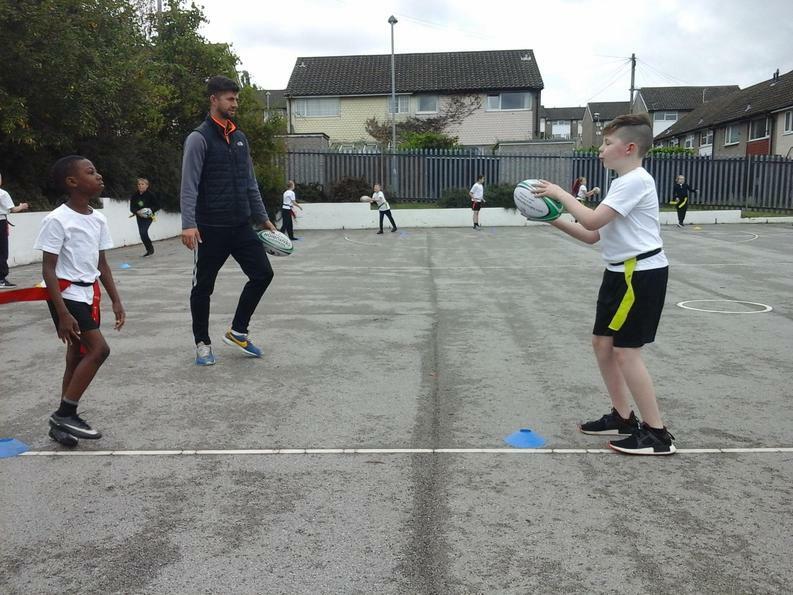 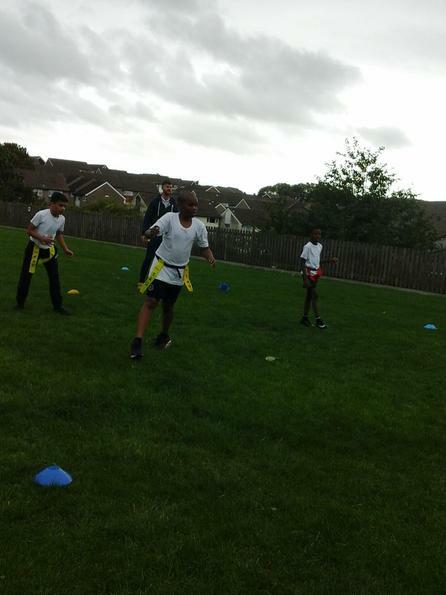 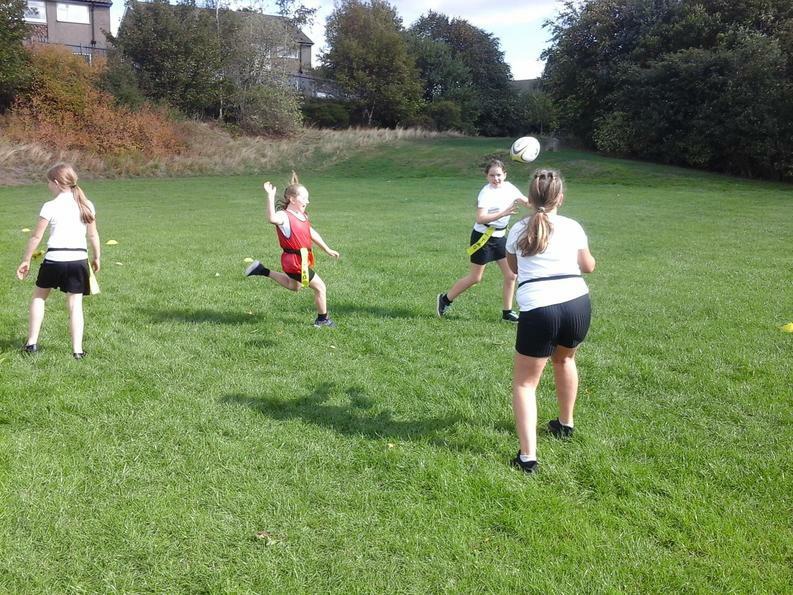 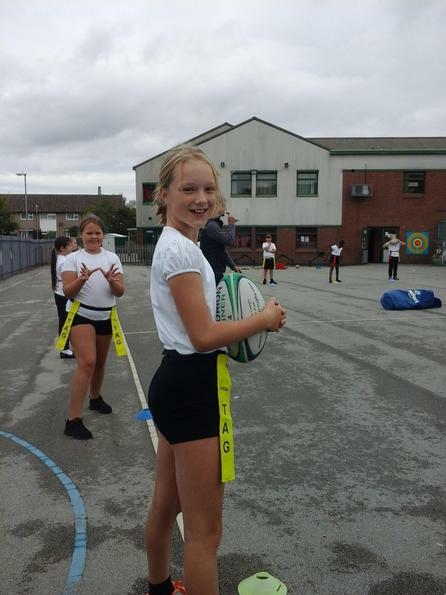 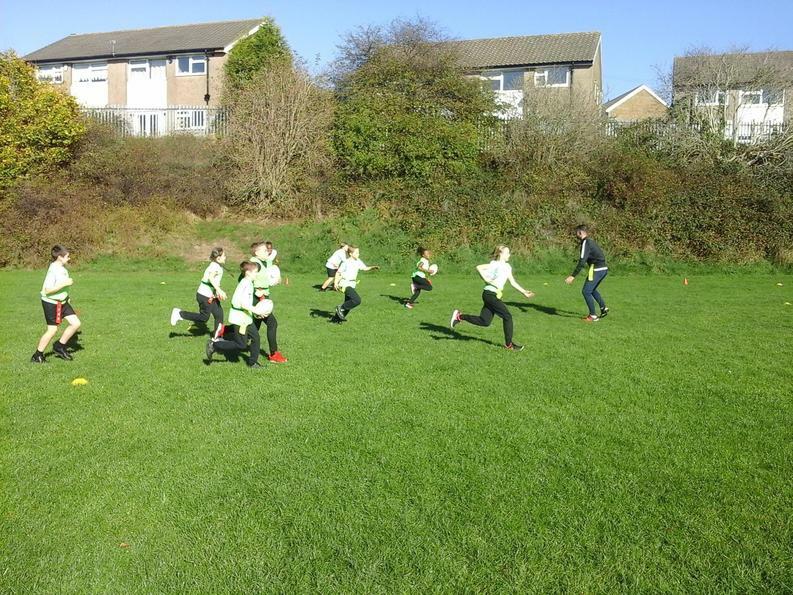 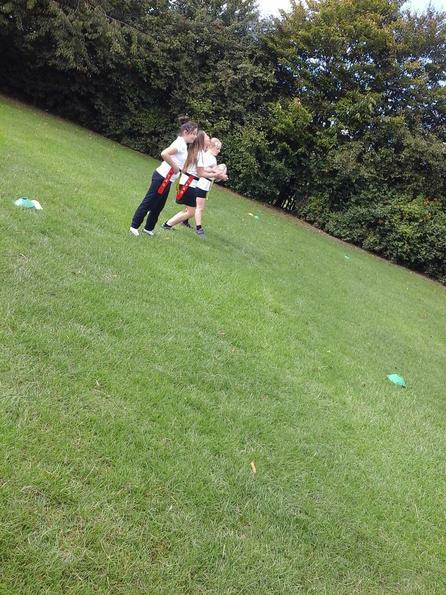 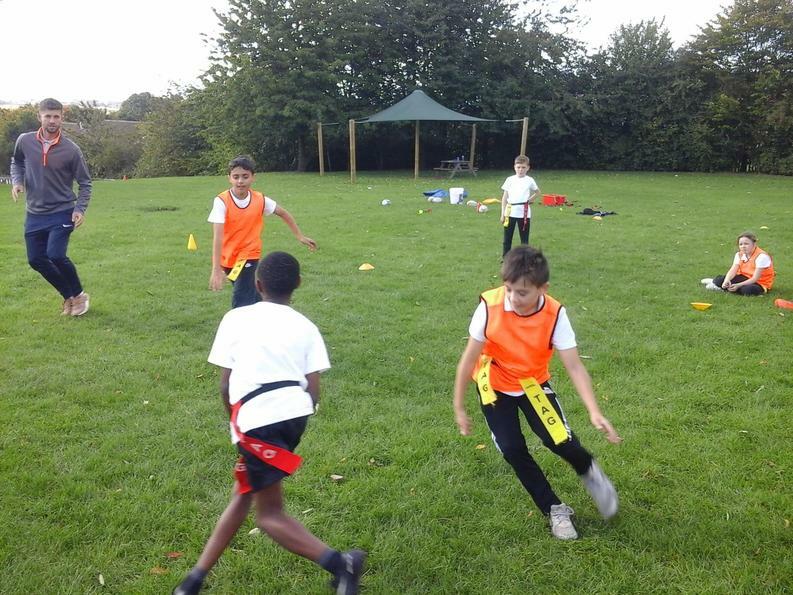 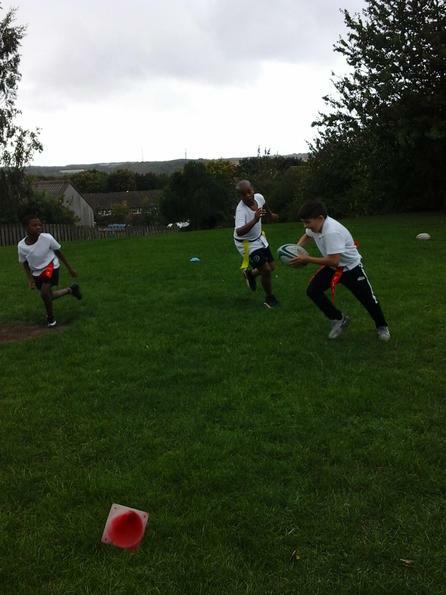 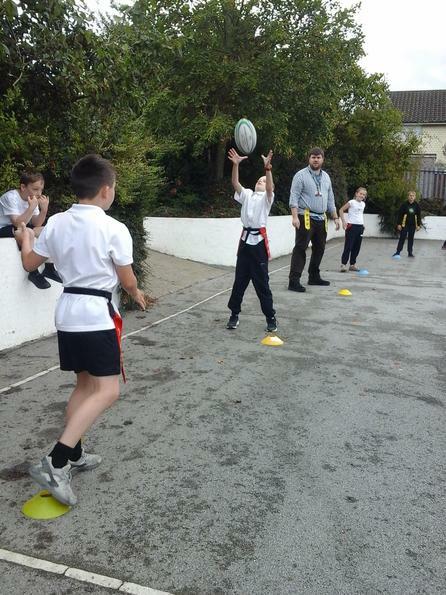 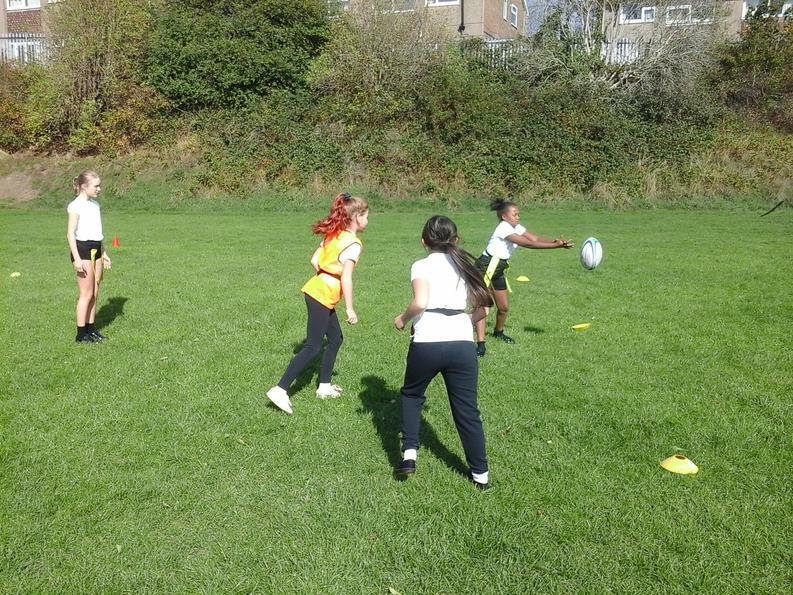 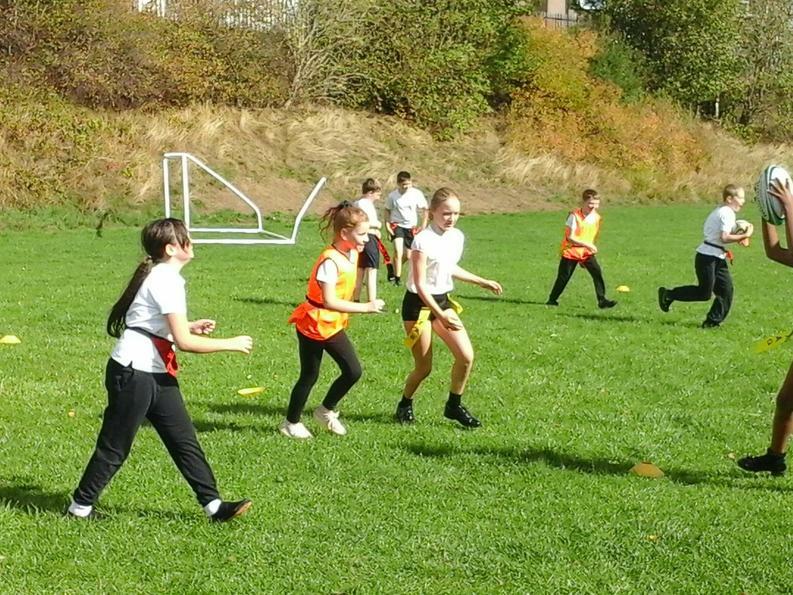 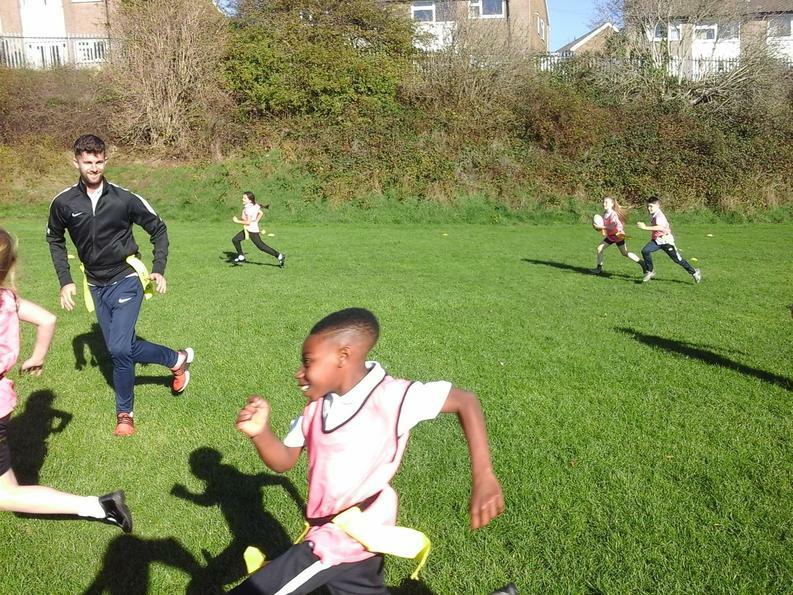 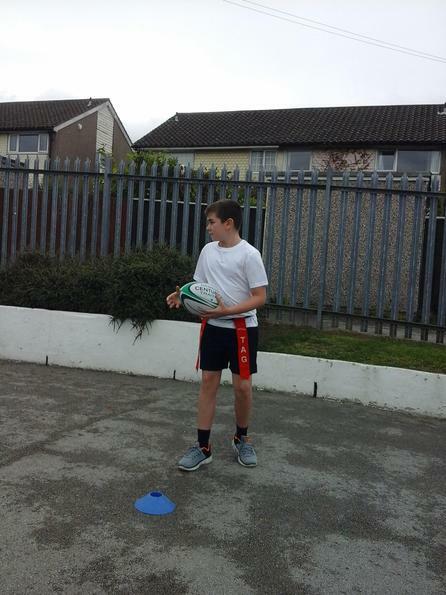 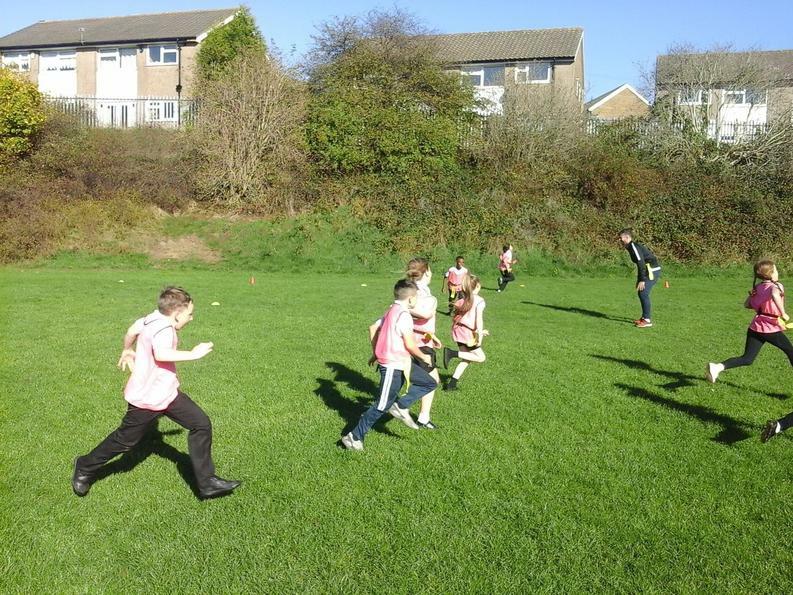 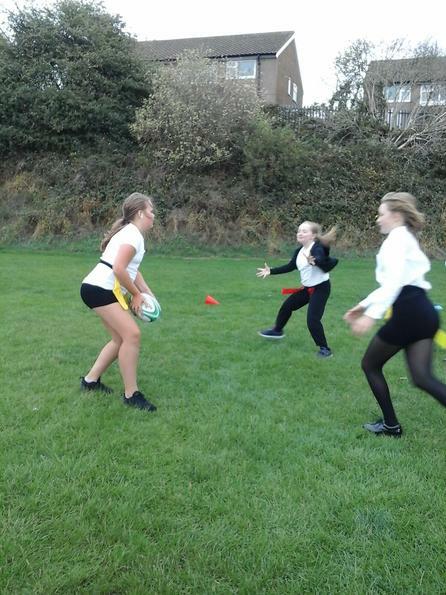 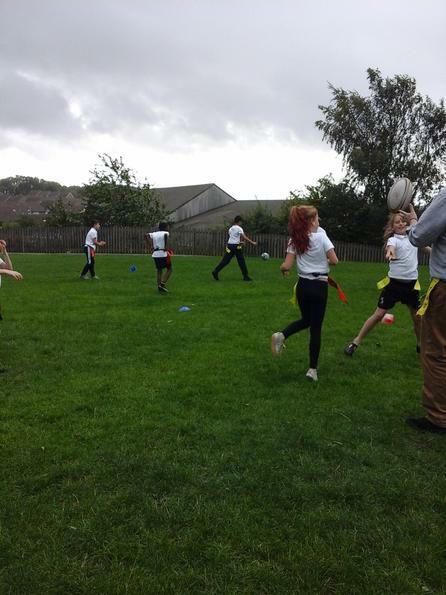 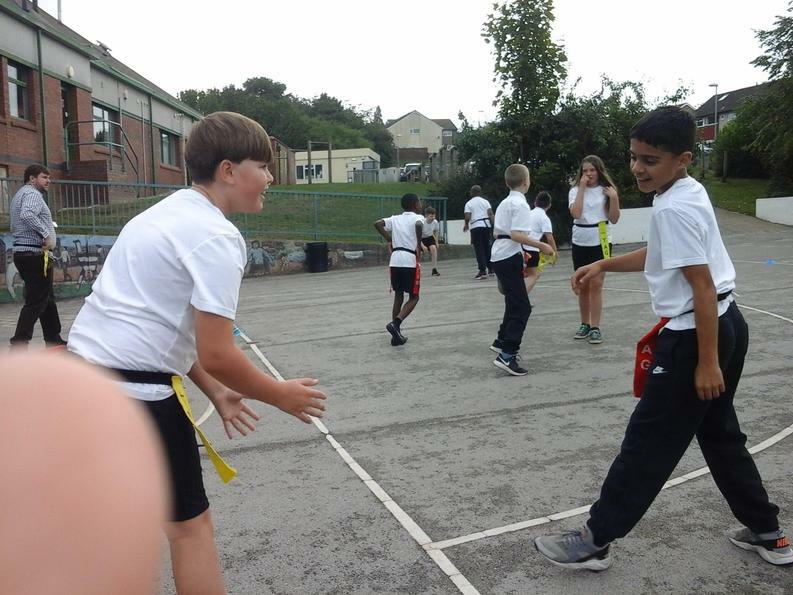 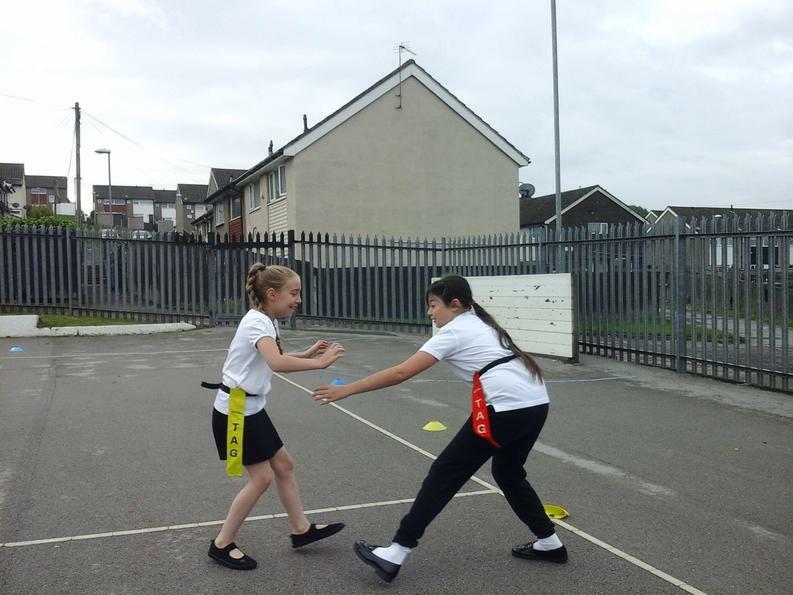 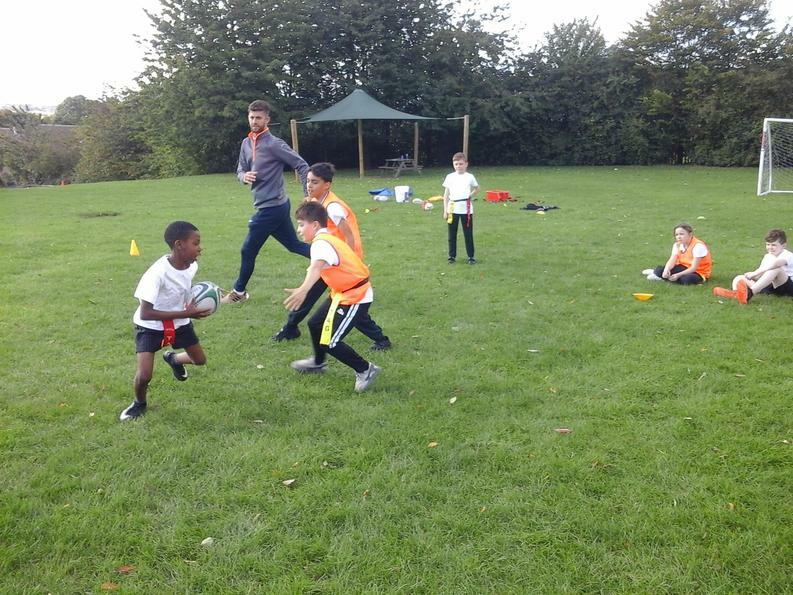 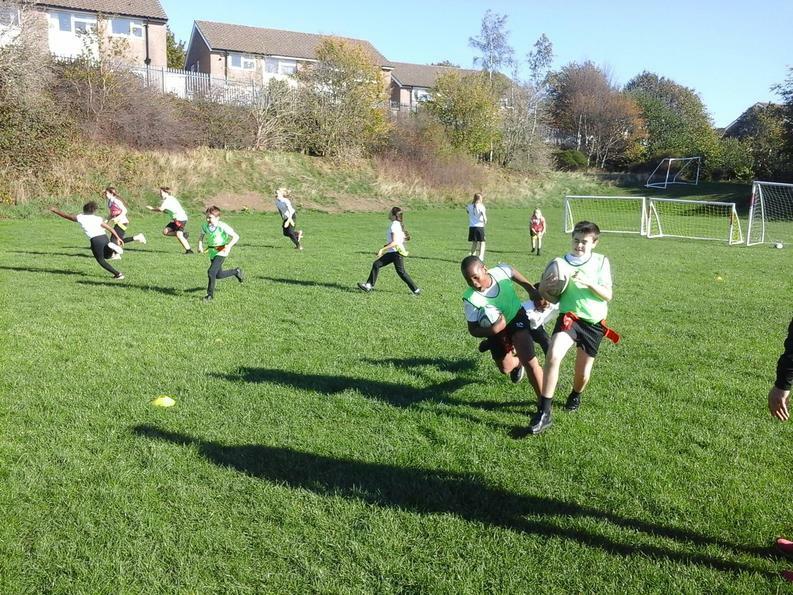 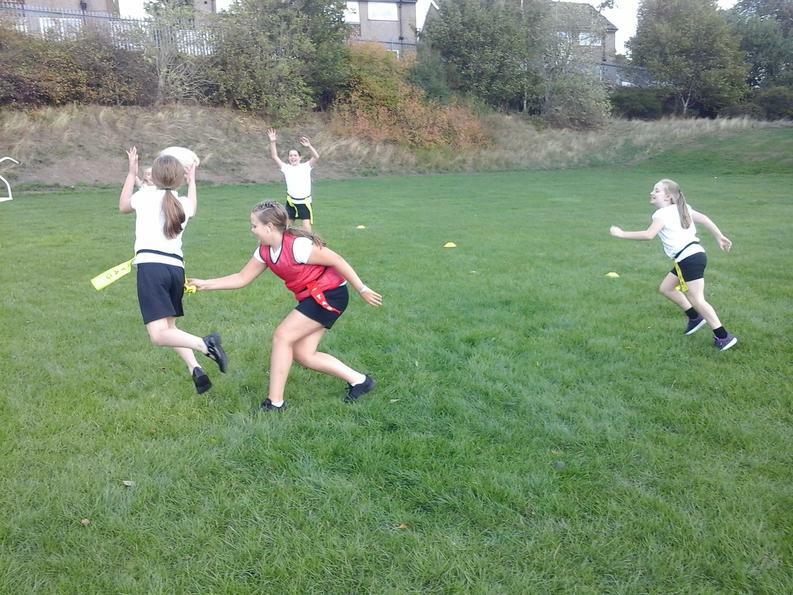 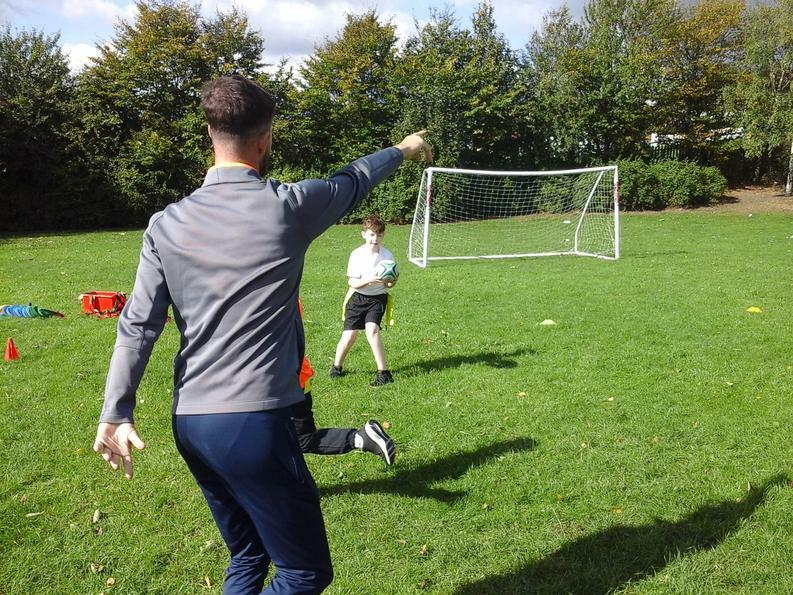 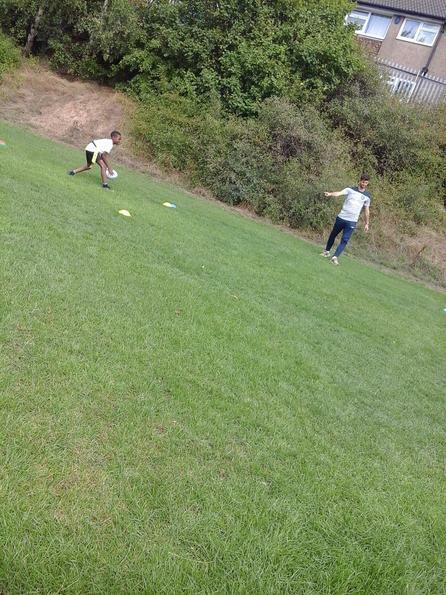 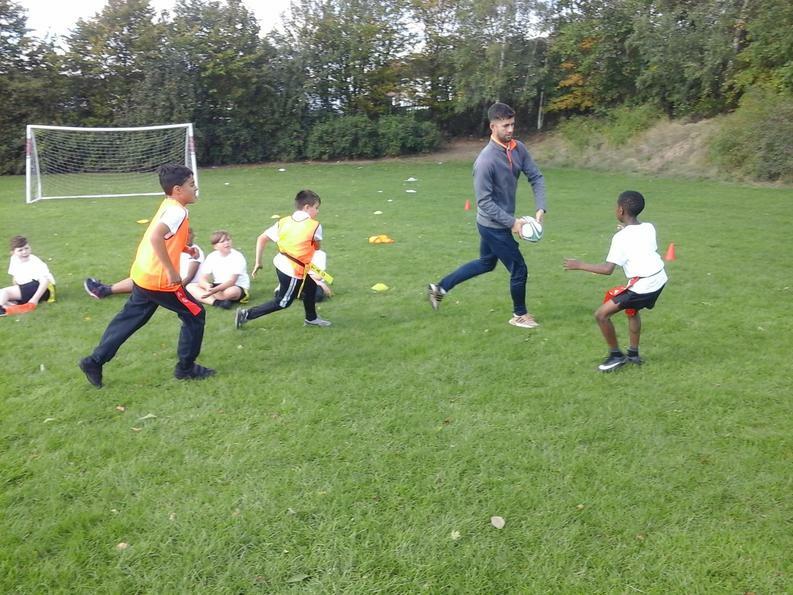 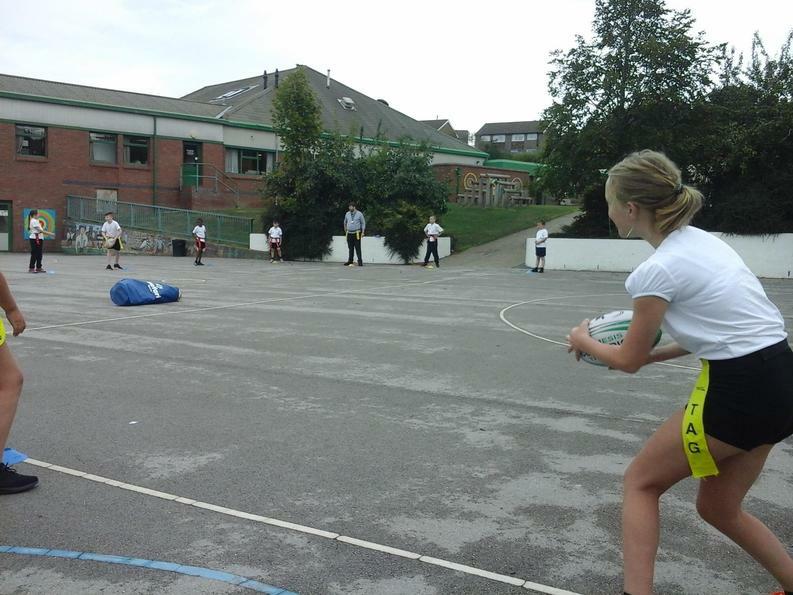 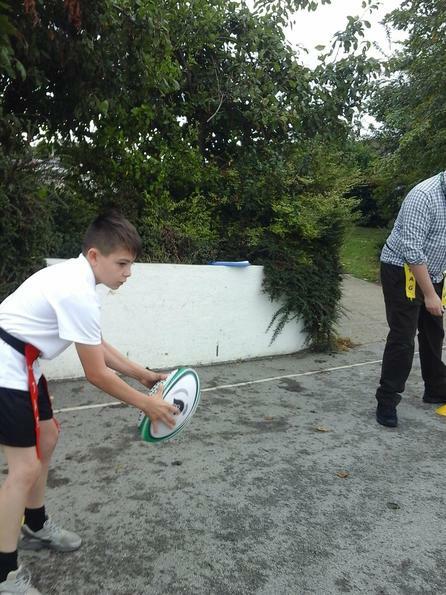 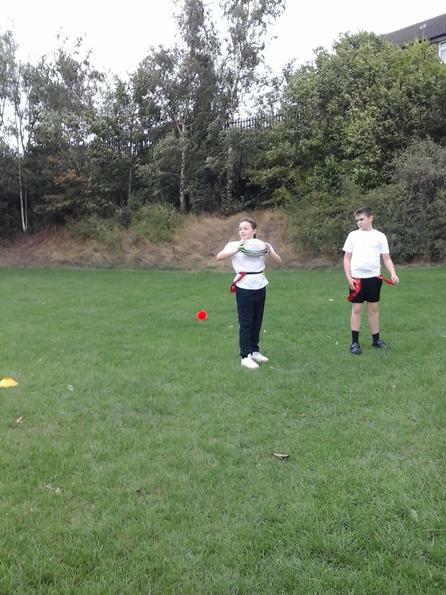 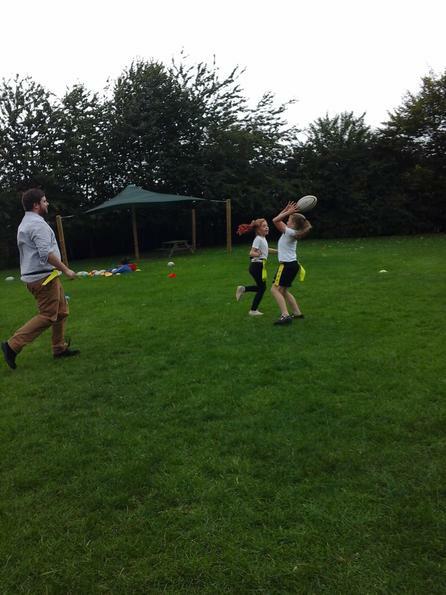 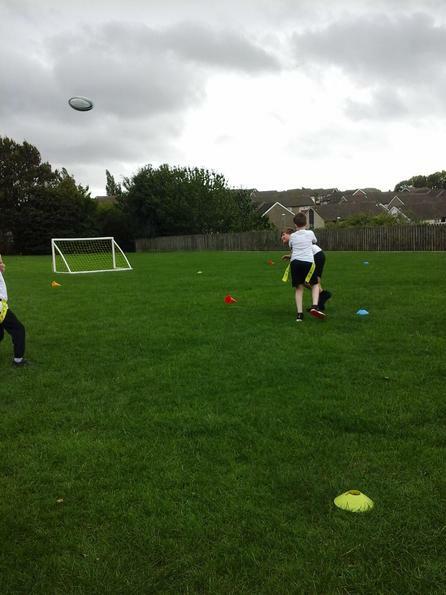 The first activity involved trying to grab the other players tag without losing your own, while the second activity involved practicing passing and catching a rugby ball. 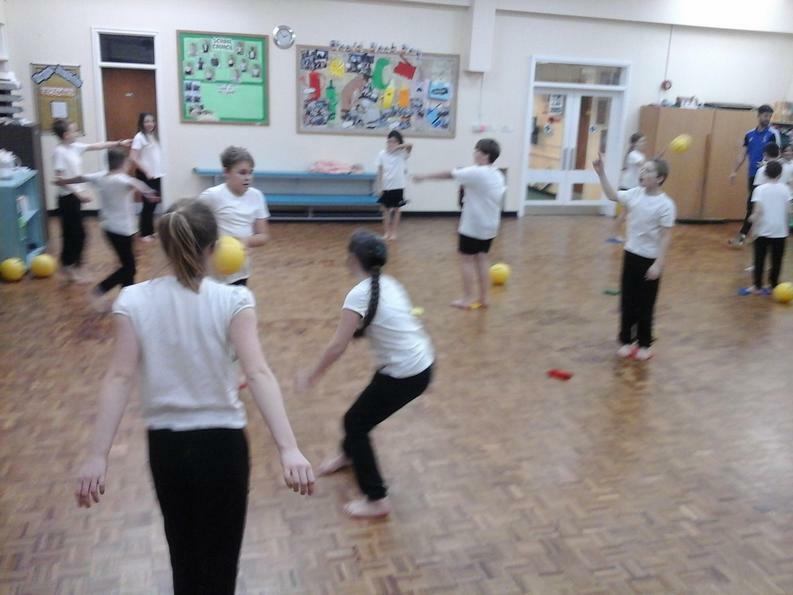 By the the end the lesson 10 balls were being passed around the circle! 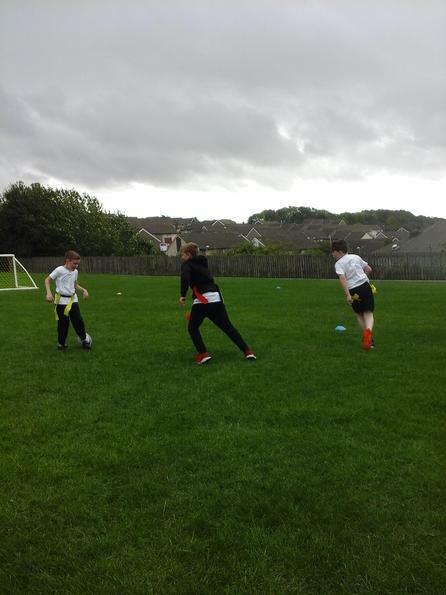 This week, able to get on the field, we practiced running with the ball, scoring and how to safely capture the opposing teams tags. 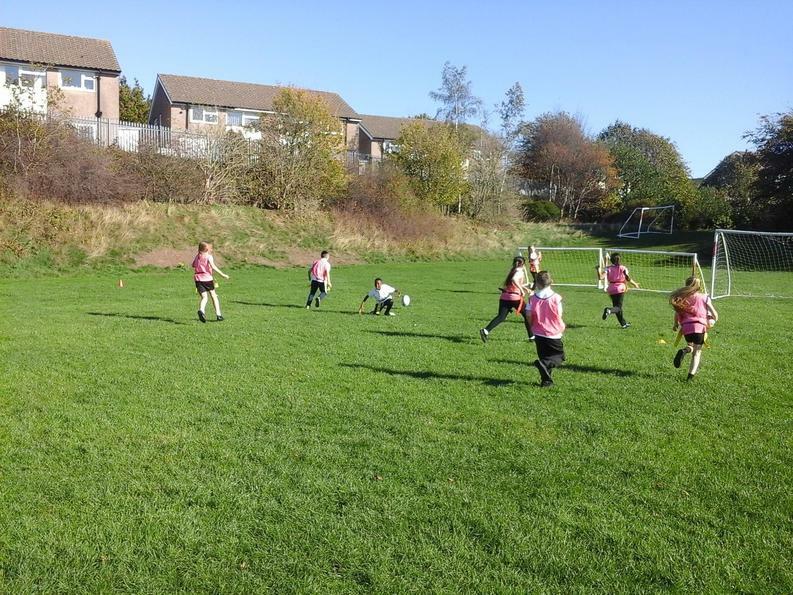 Once again on the field, we practiced passing the ball while evading the opposition in a game which resembled Piggy-in-the-Middle. 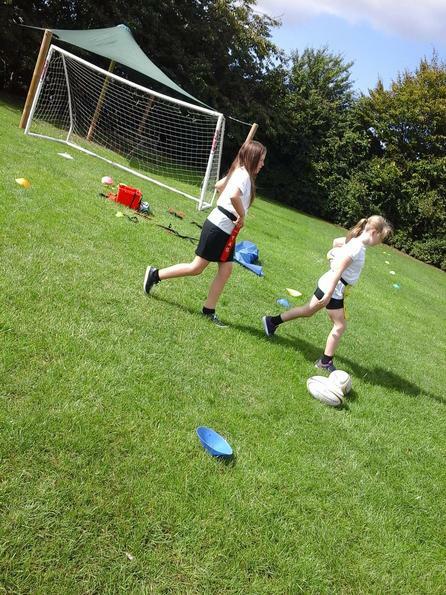 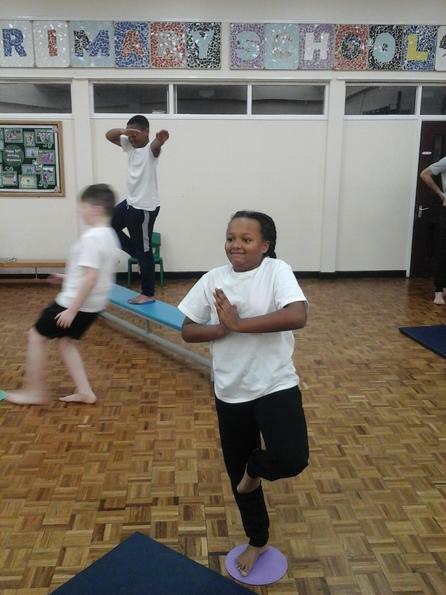 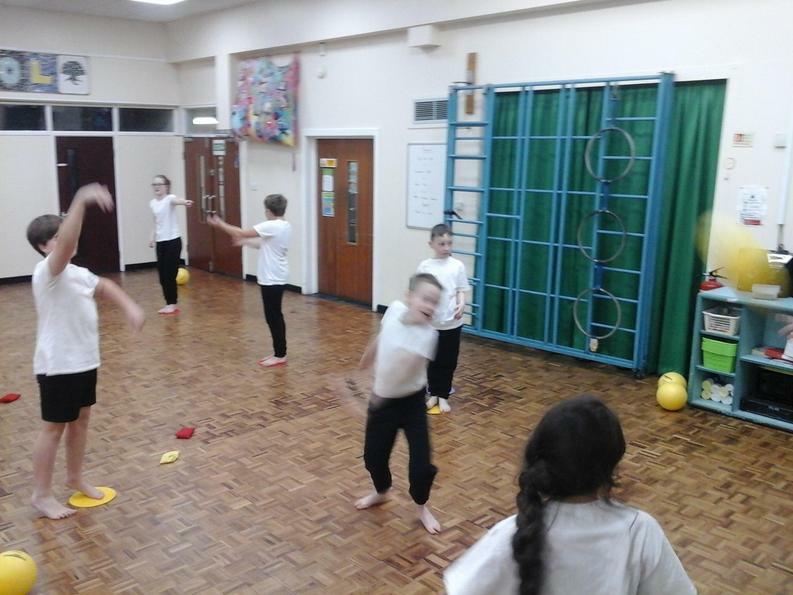 In another PE lesson, we practiced our evasion skills. 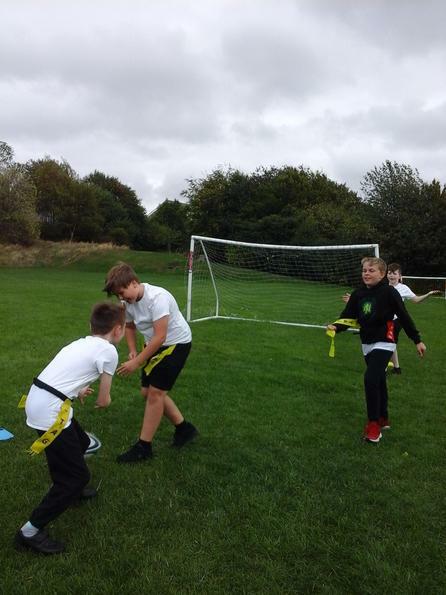 Our task was to get from one side of the pitch to the other without one of our tags being stolen by the person or people in the middle. 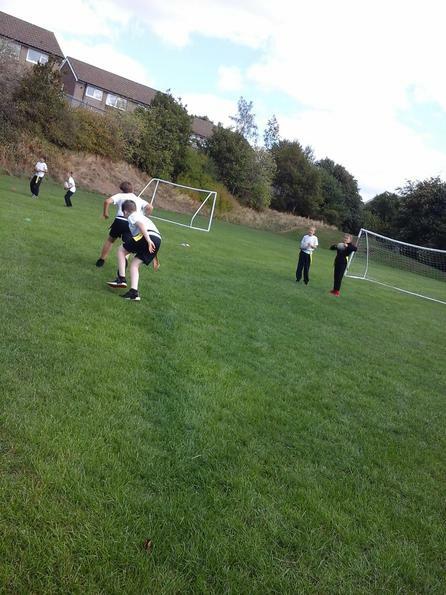 If our tag was taken, we joined them in the middle. 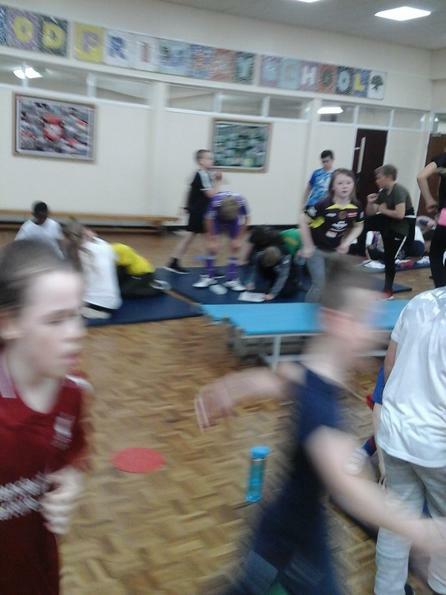 The game got harder and harder as there were more and more people to try and avoid. 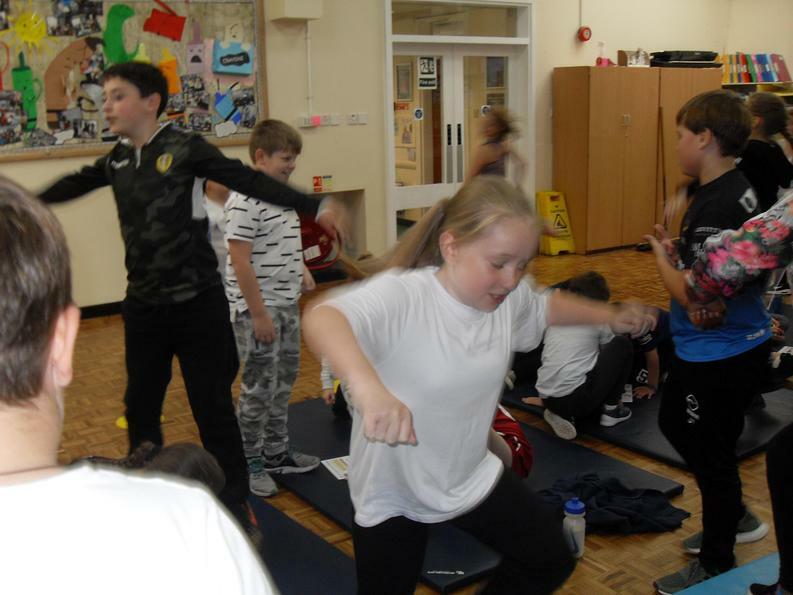 National Fitness Day began with a whole school assembly, during which Mr Frankland had us up on our feet for a bit of Wake Up, Shake Up! 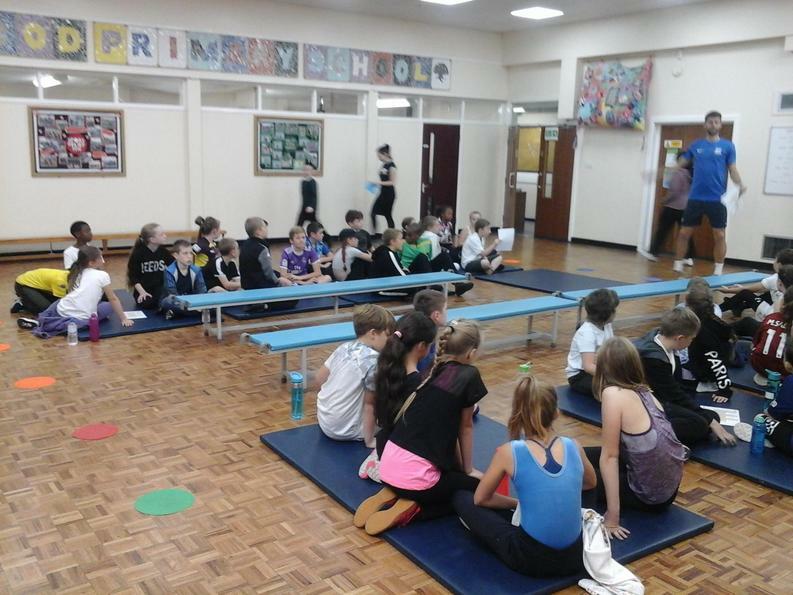 Later came our time-slot for even more exercise in the hall. 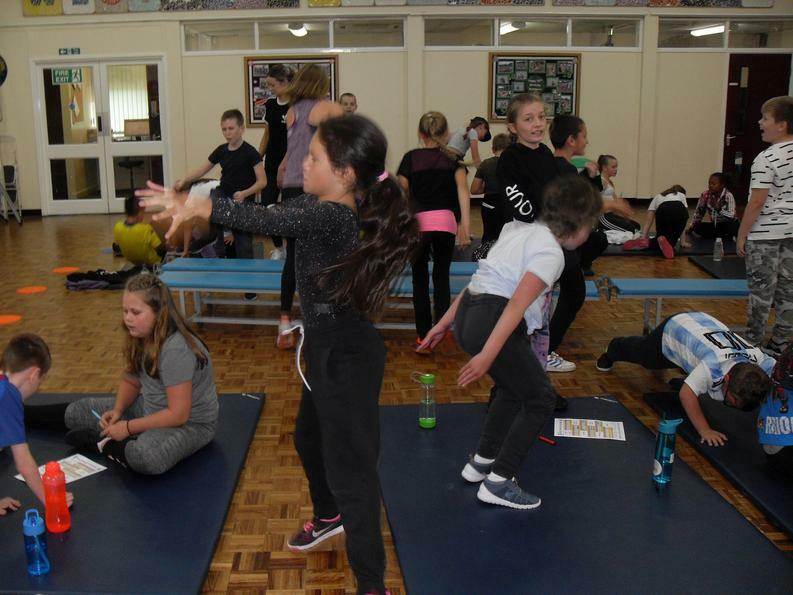 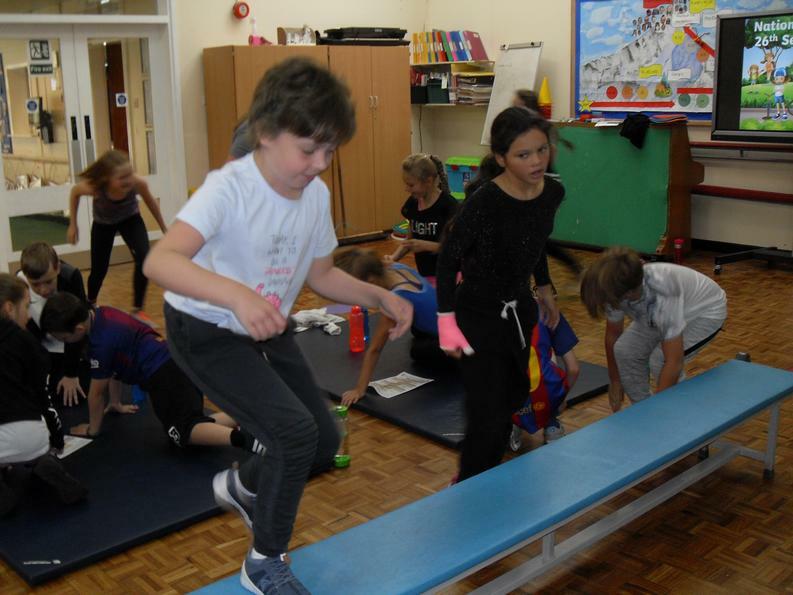 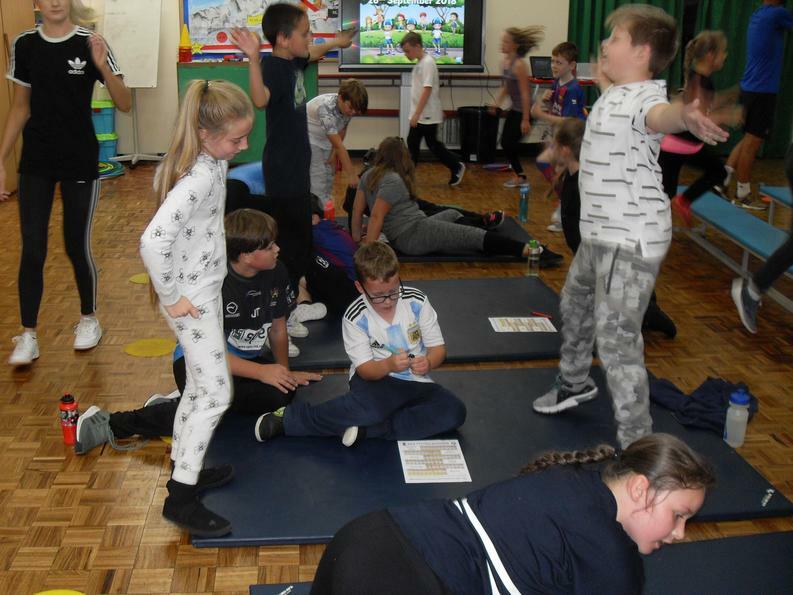 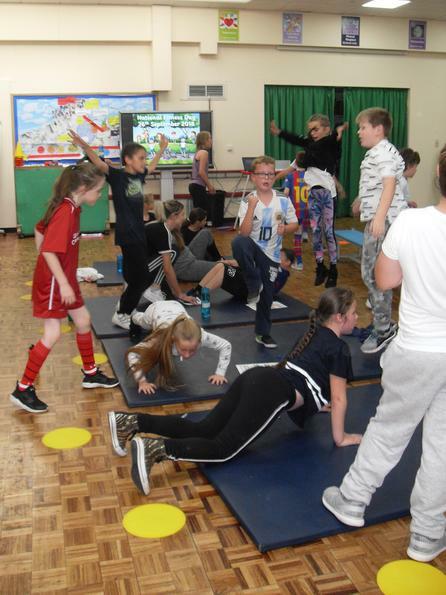 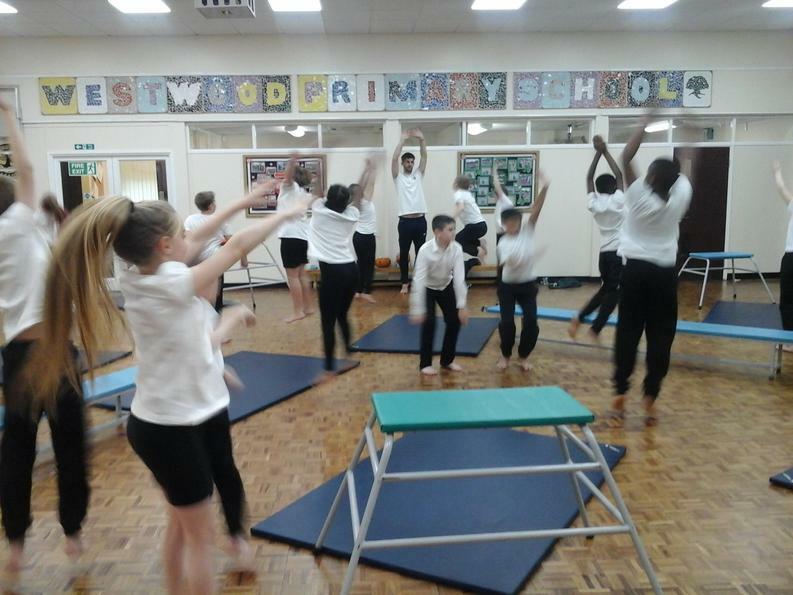 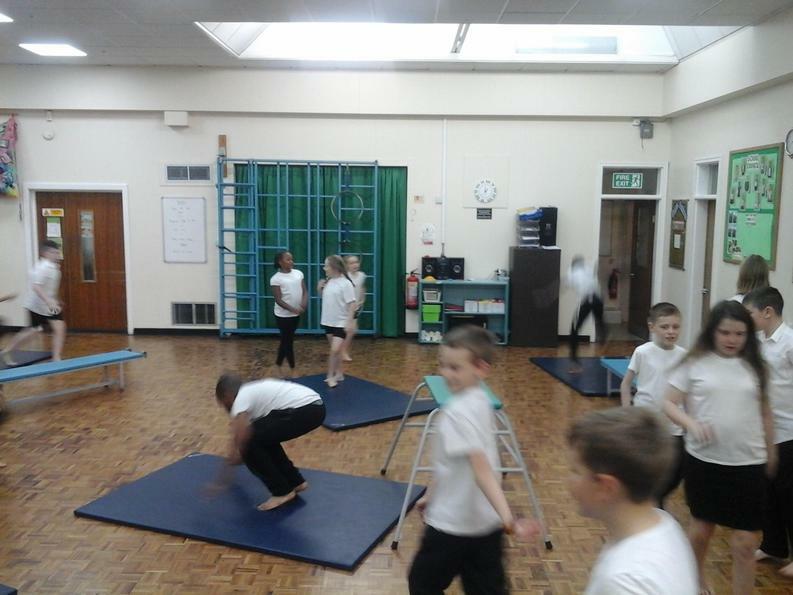 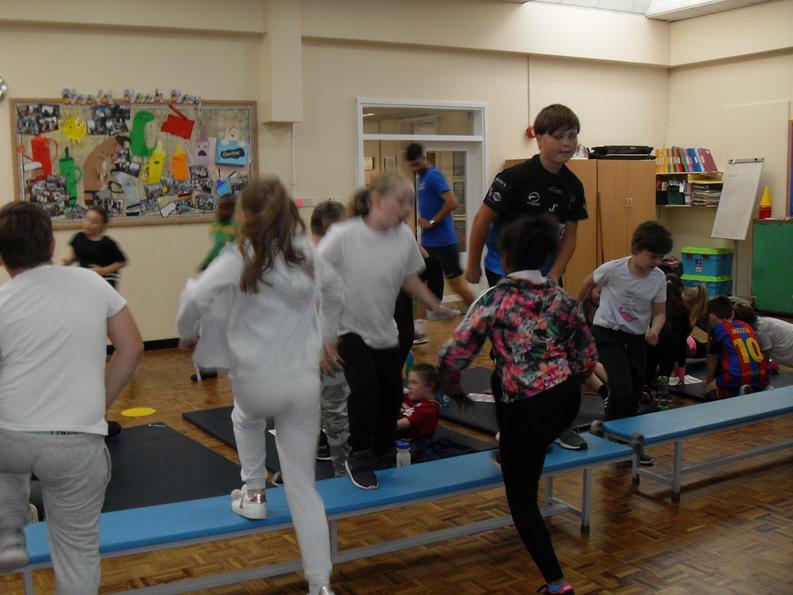 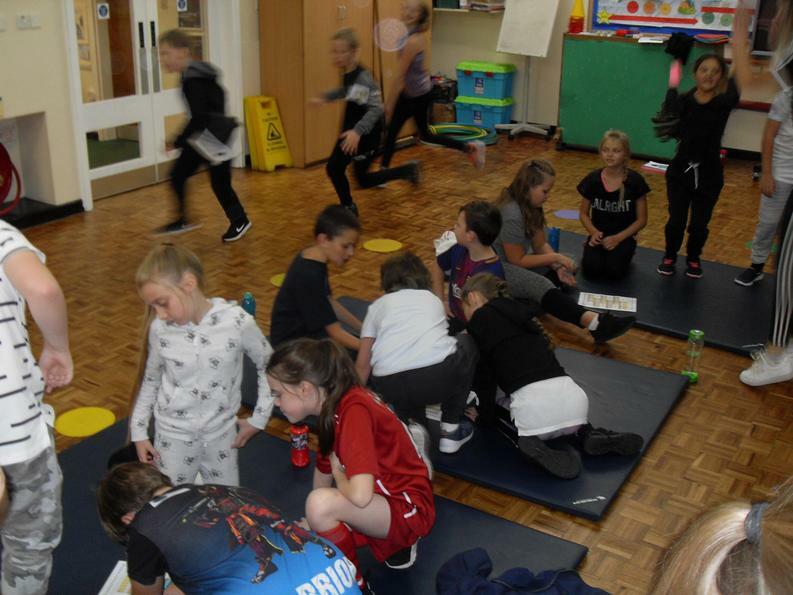 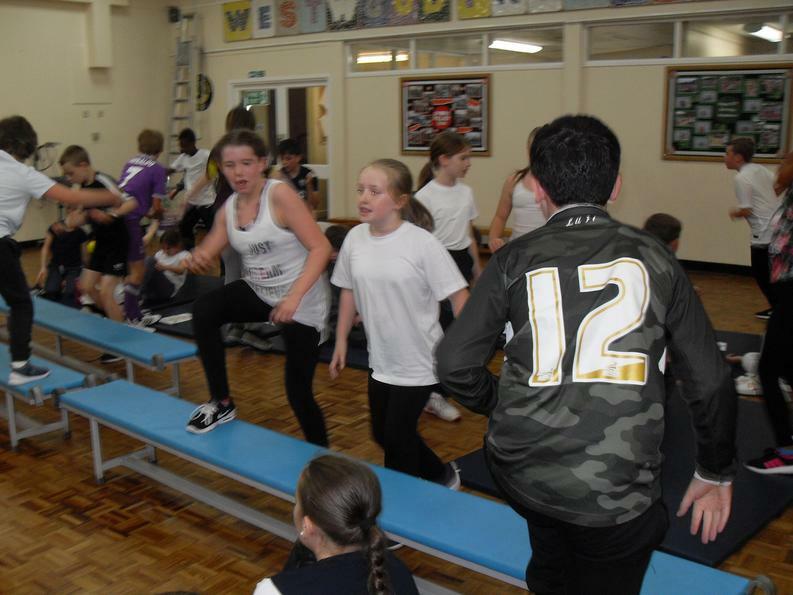 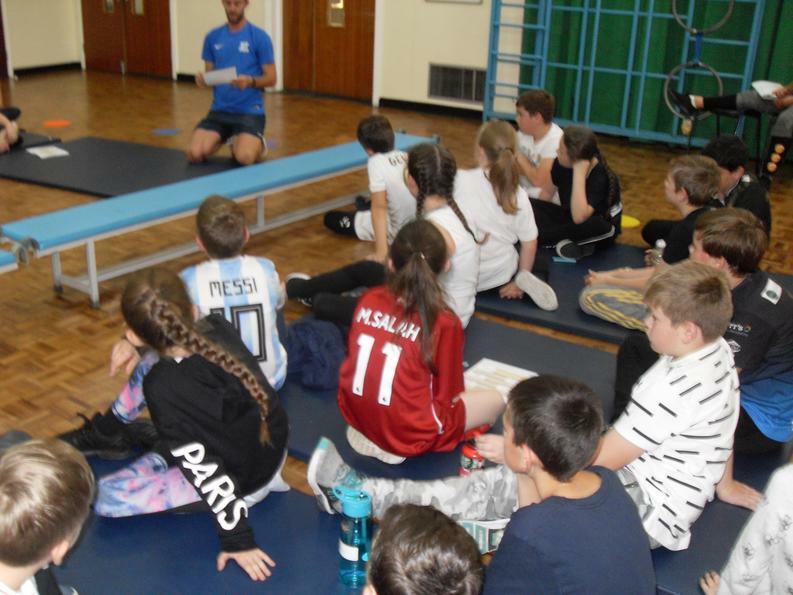 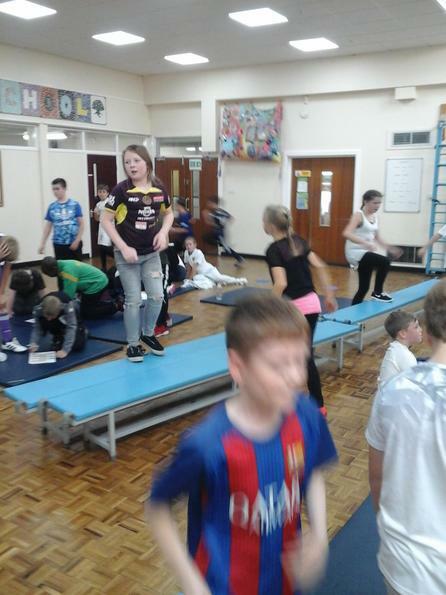 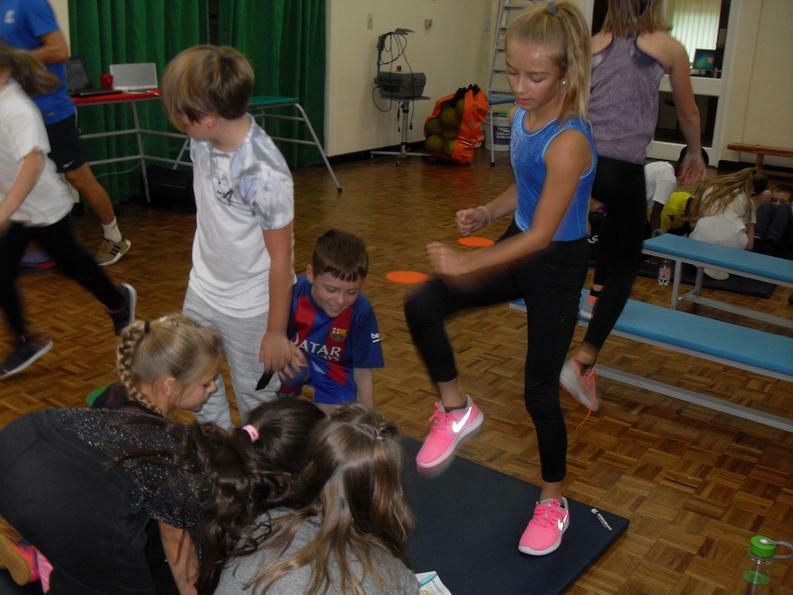 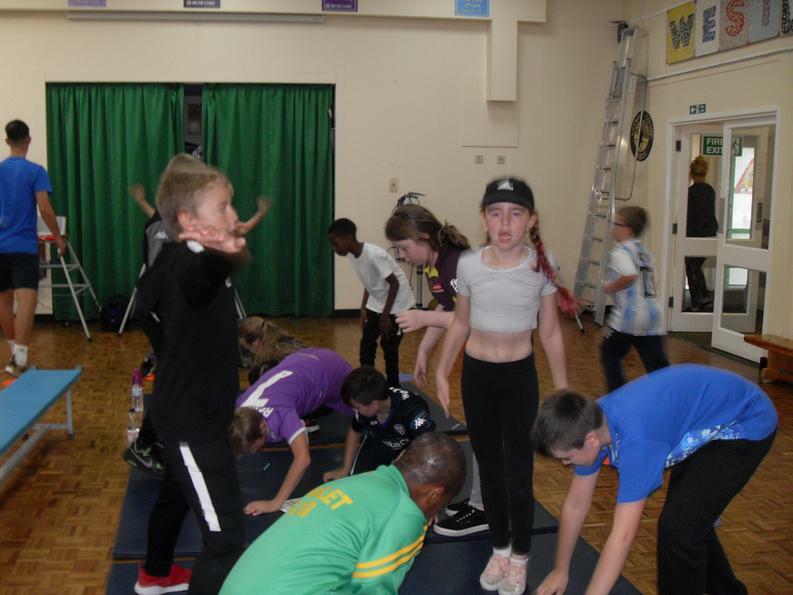 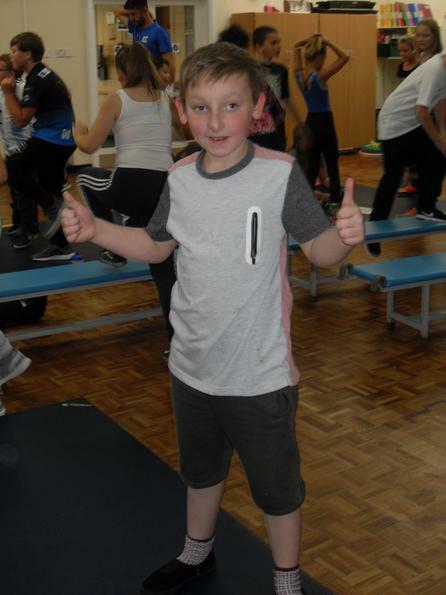 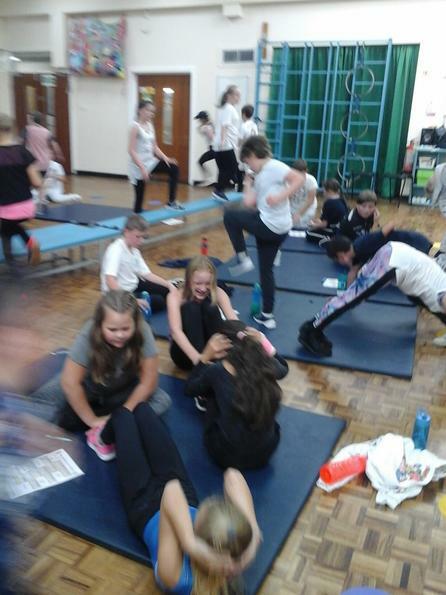 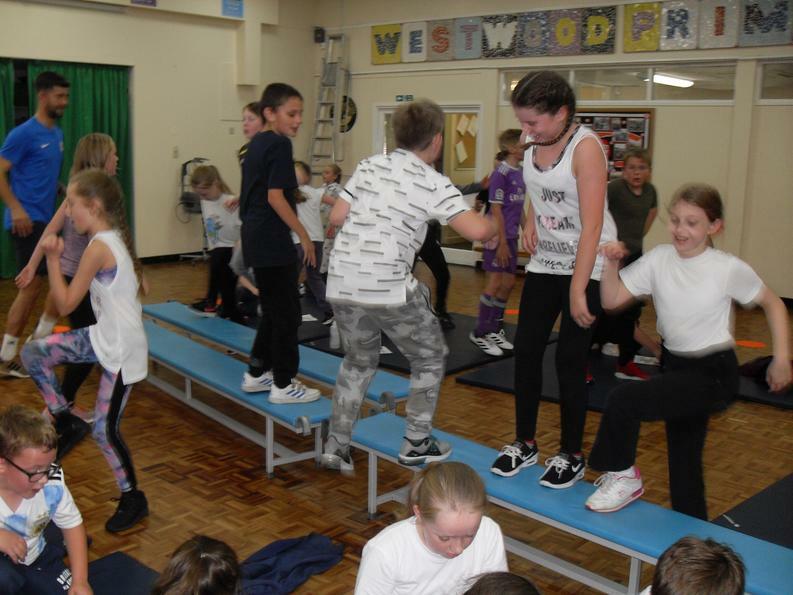 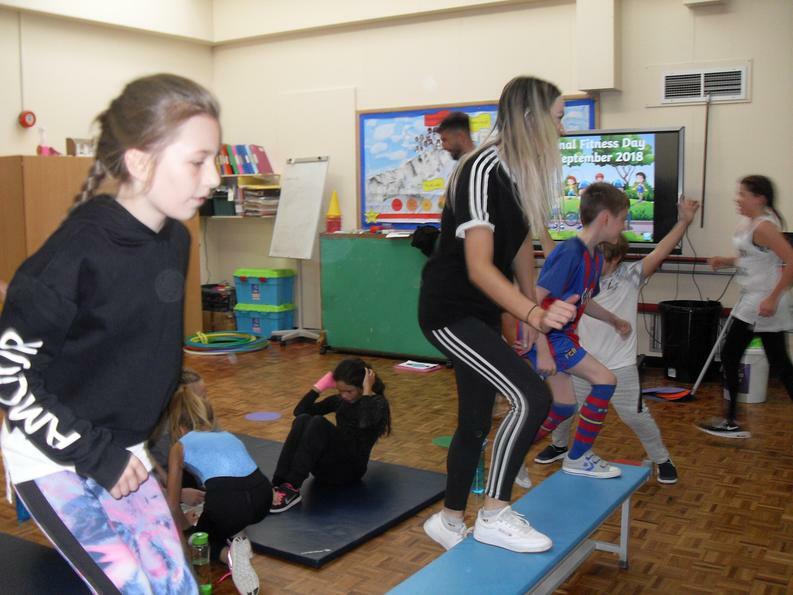 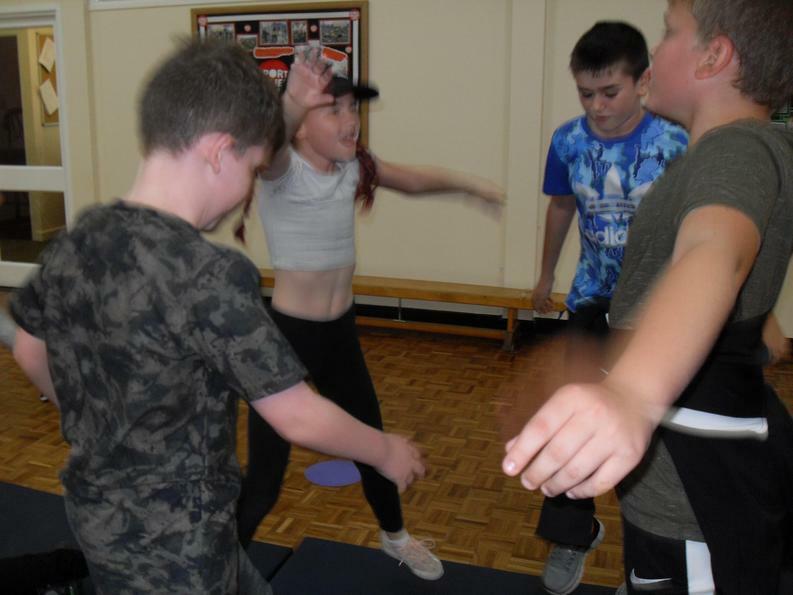 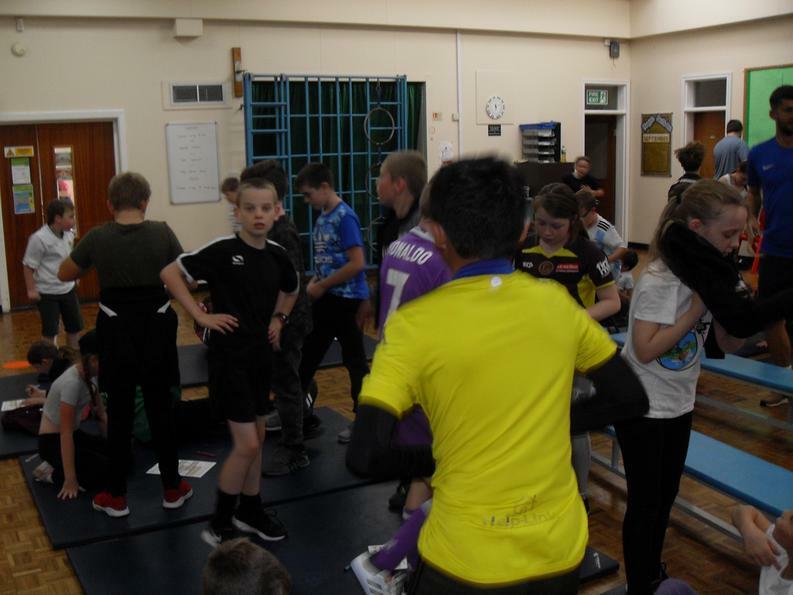 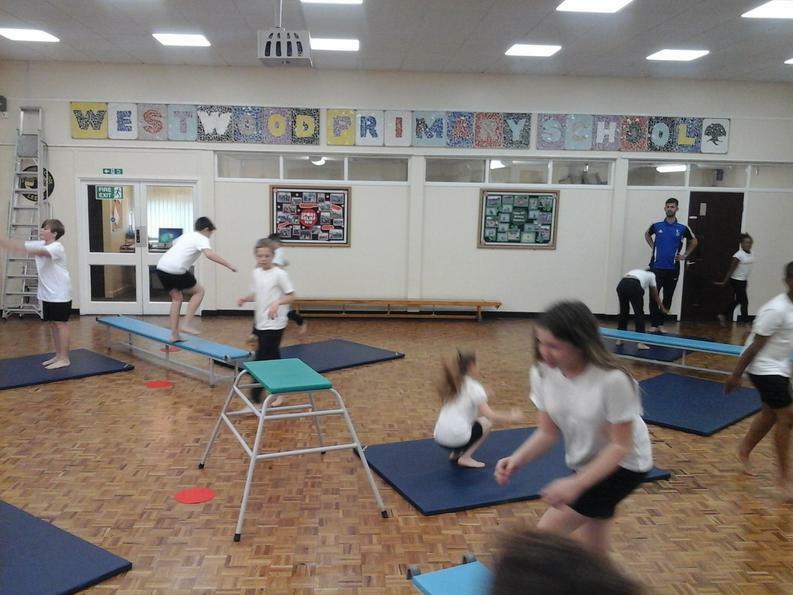 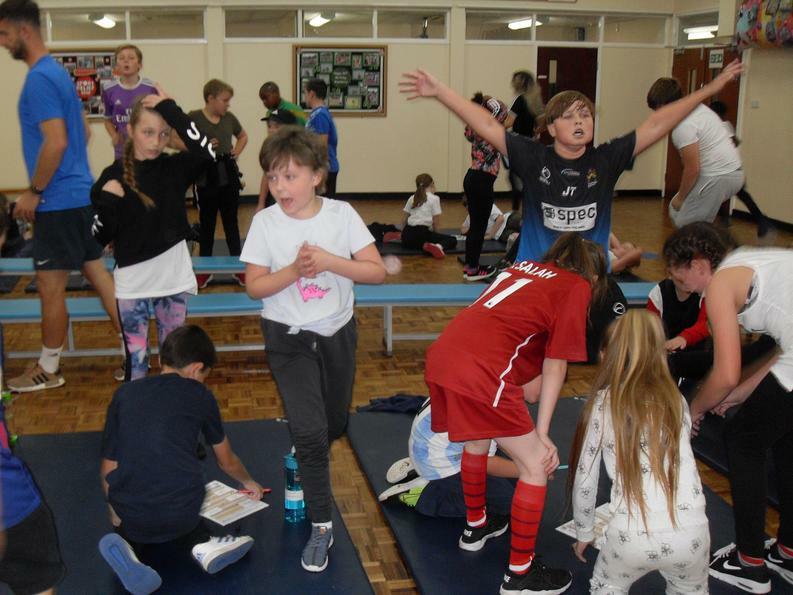 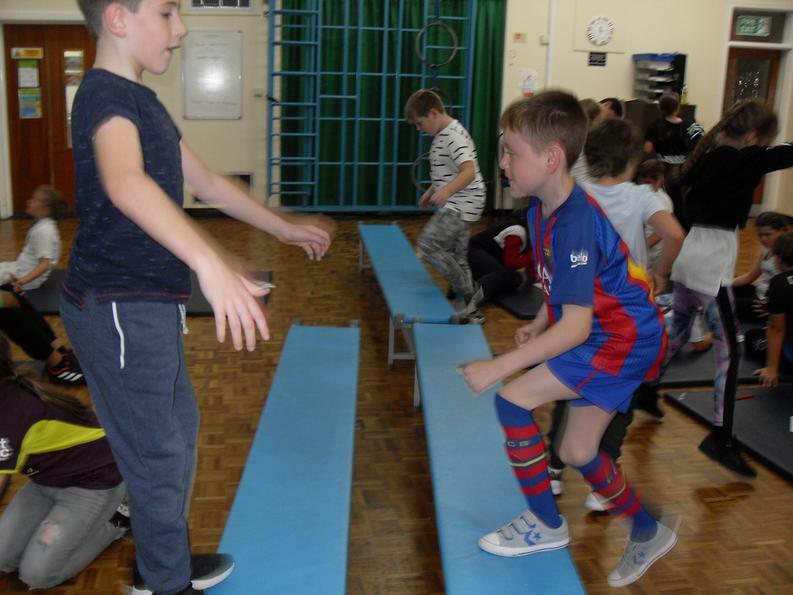 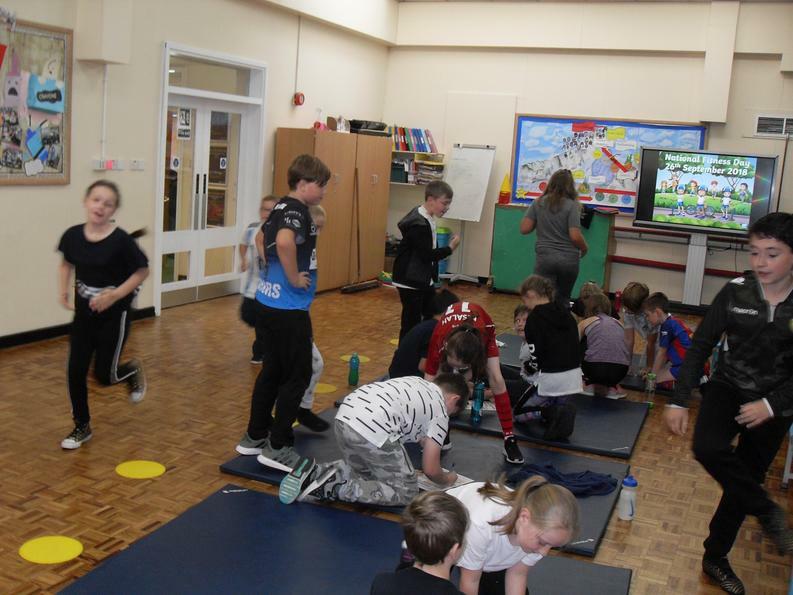 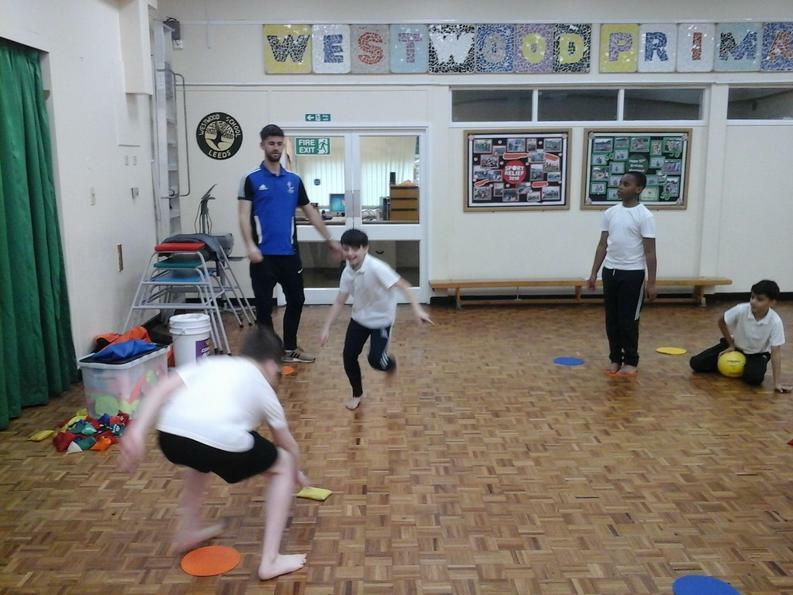 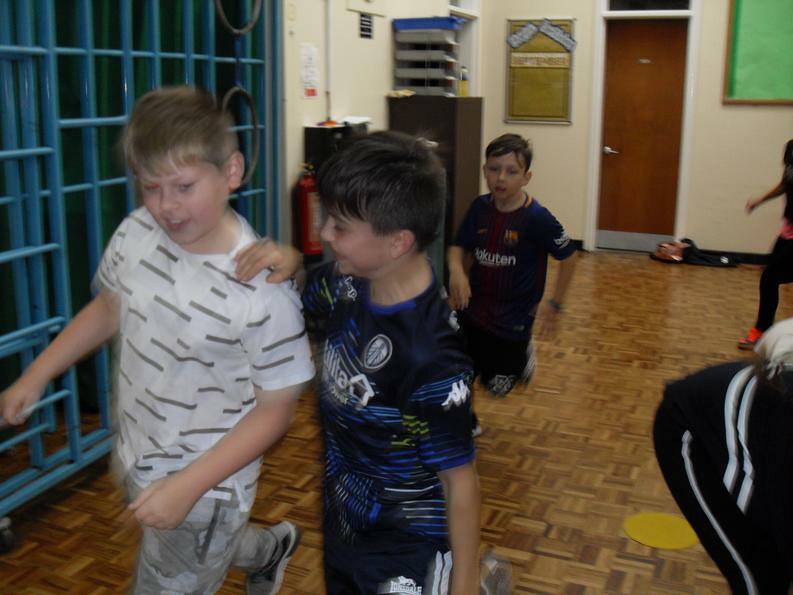 Both Willow and Sycamore classes joined in for some circuit training in which each group had to work together to complete as many exercises as possible during the session. 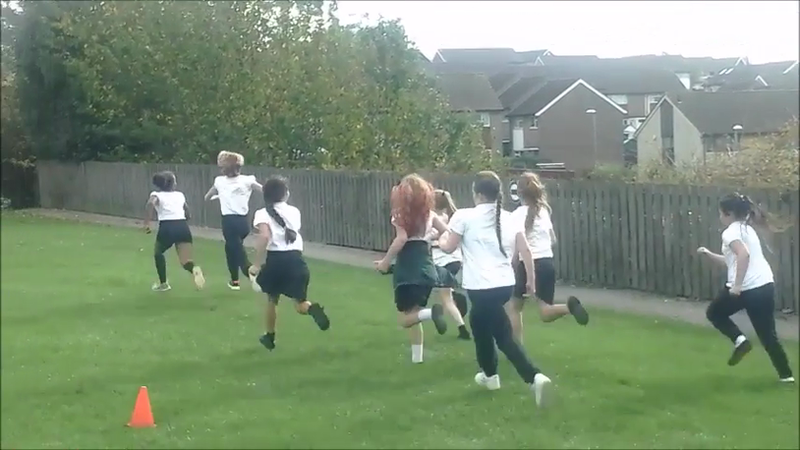 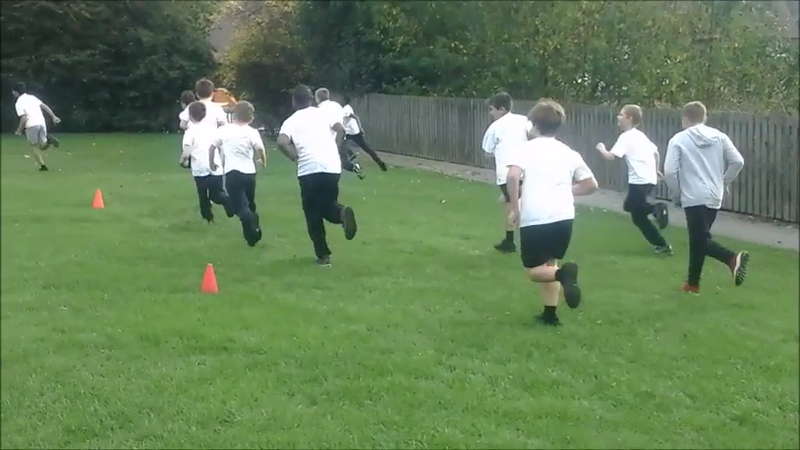 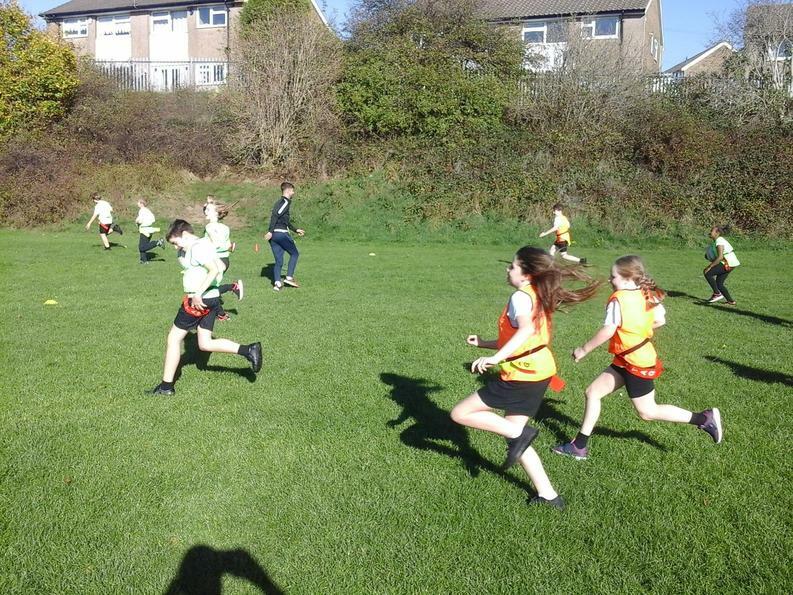 This week, in preparation for a competition, we tried our hand at Cross Country. 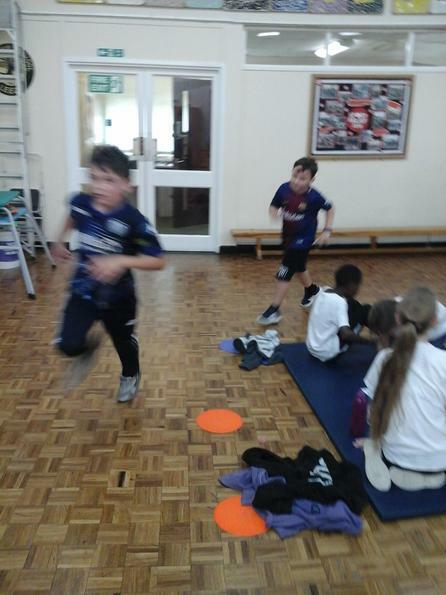 Some people managed to race past so fast the camera couldn't even catch them! 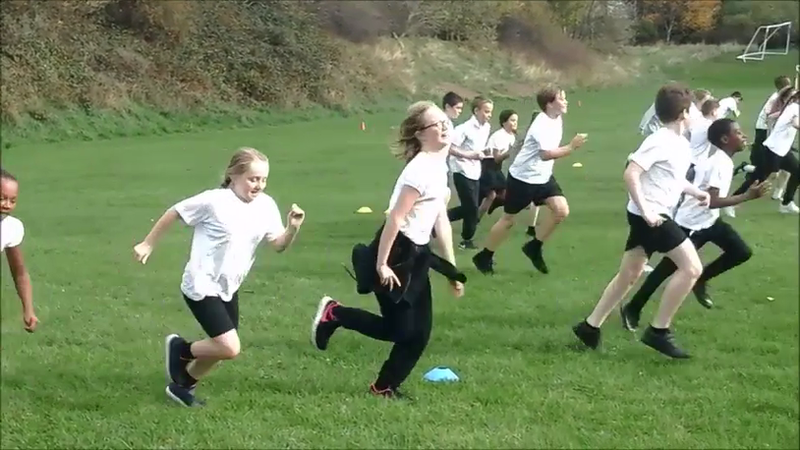 Before starting, we tried a few activities to practice keeping pace as cross country is not a sprint. 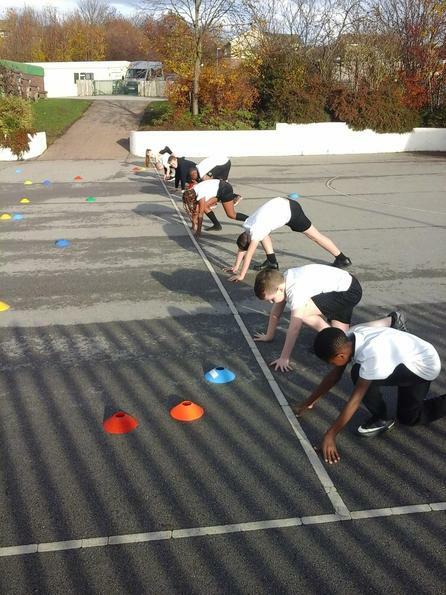 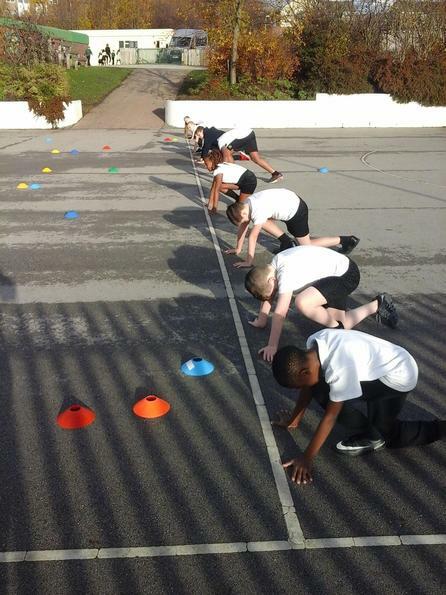 When Mr Frankland shouted a colour and a number, we had that many seconds to reach the coloured line and get back to the starting line. 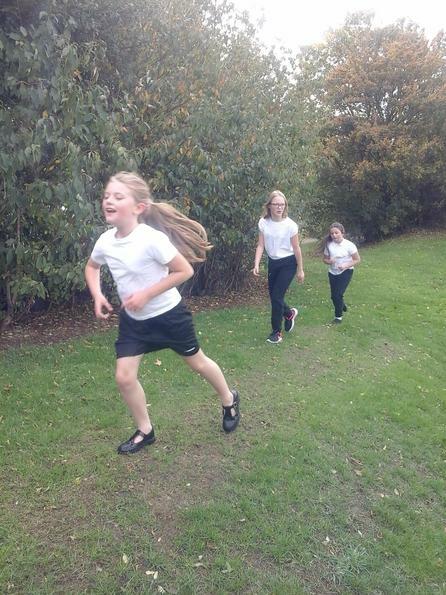 After our warm up, it was time for the cross country run. 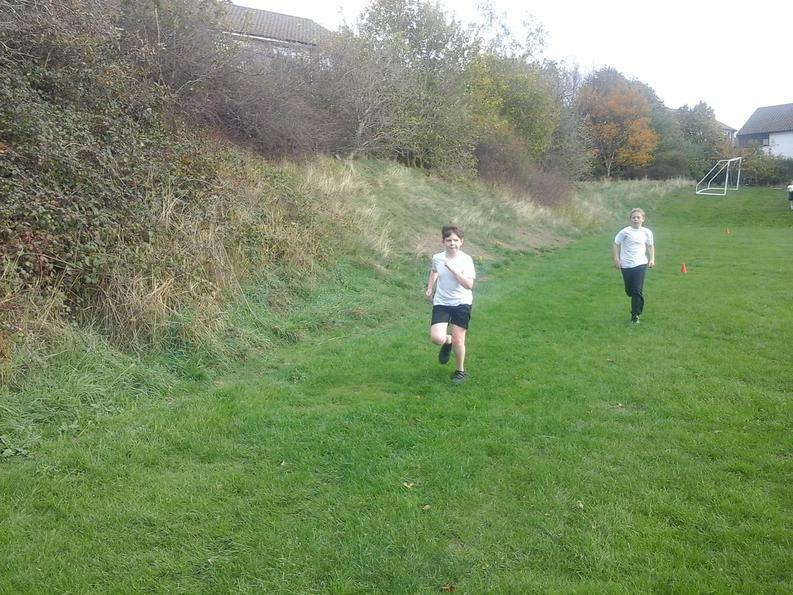 The girls ran first, followed by the boys. 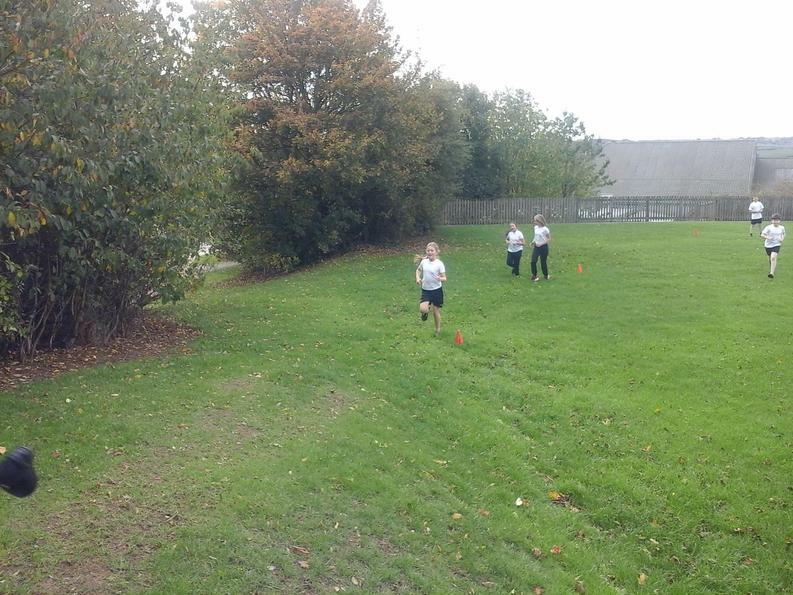 The course took us around the field and over the banking. 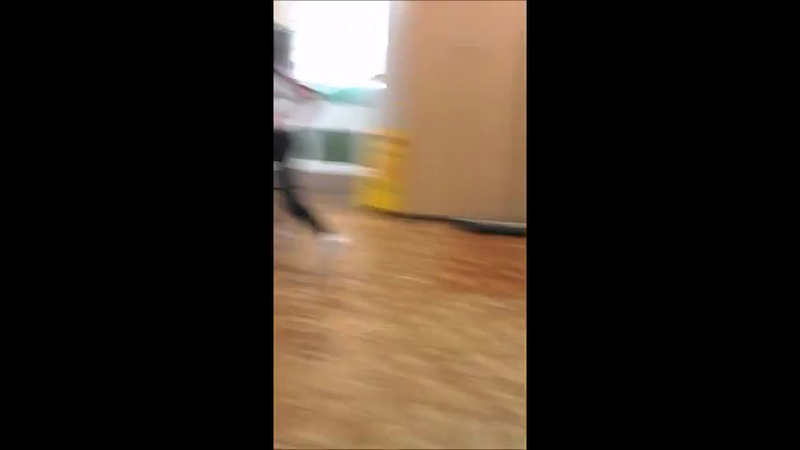 4 times! 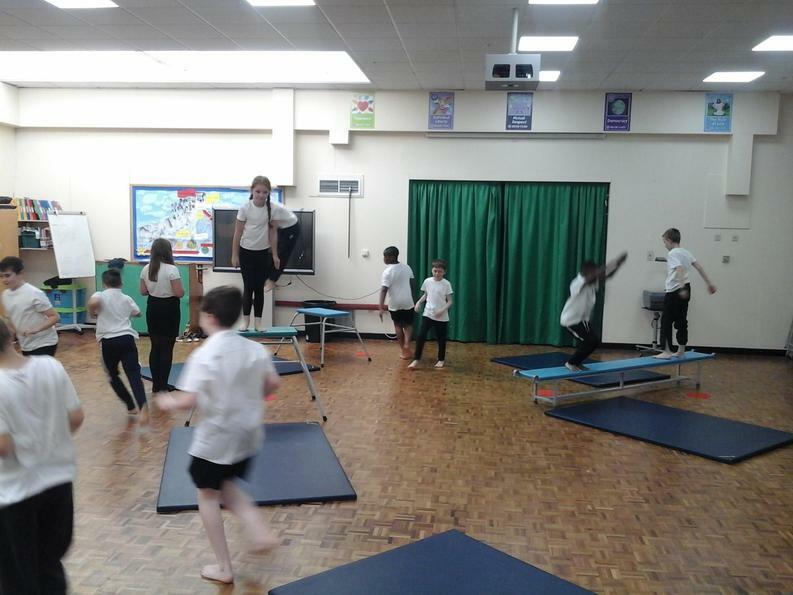 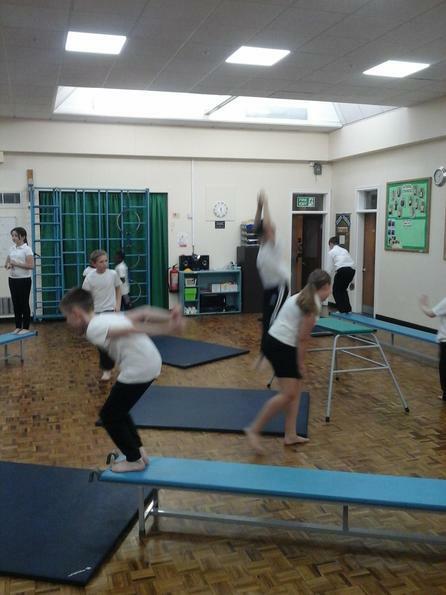 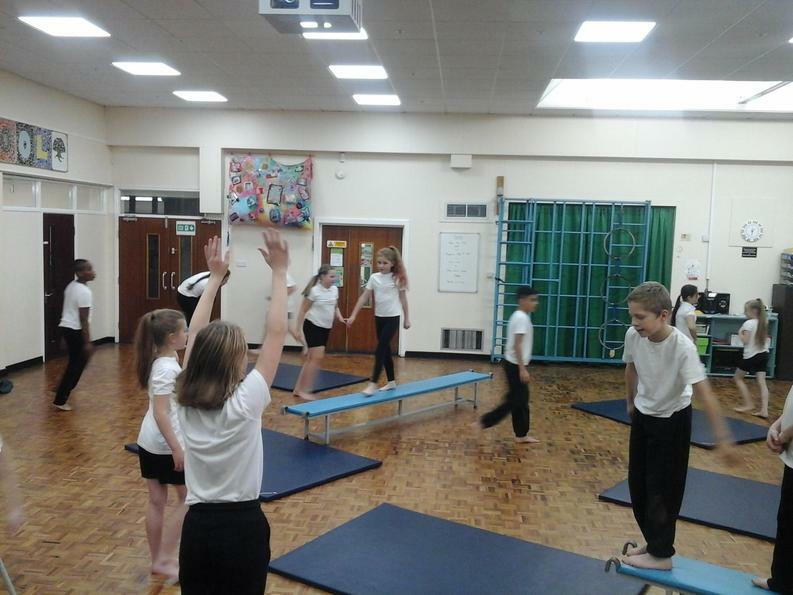 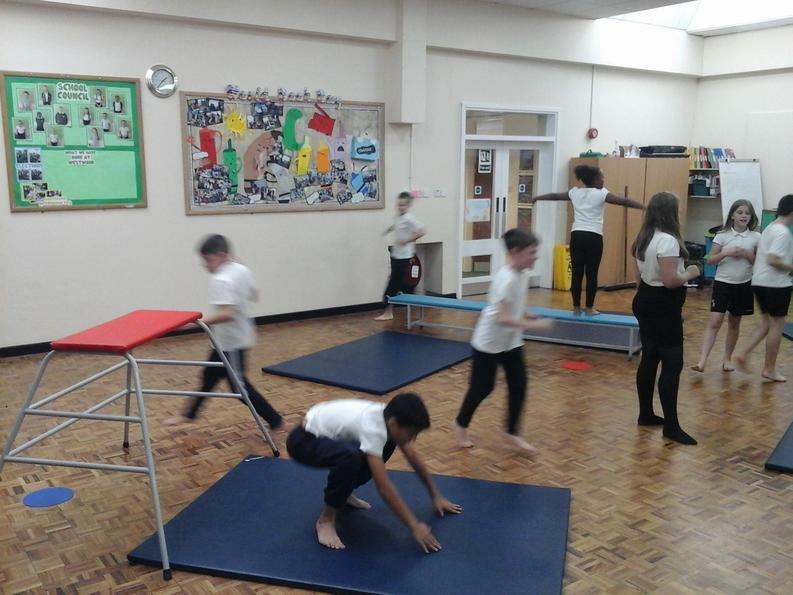 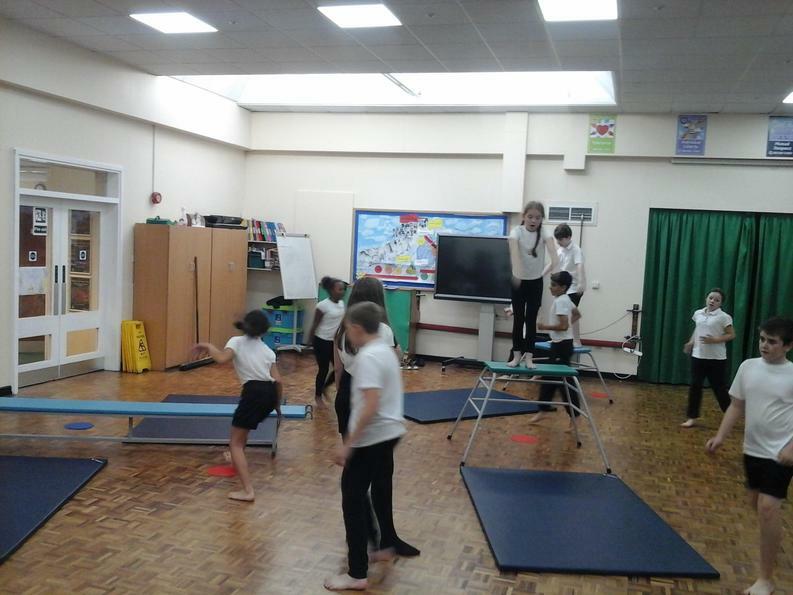 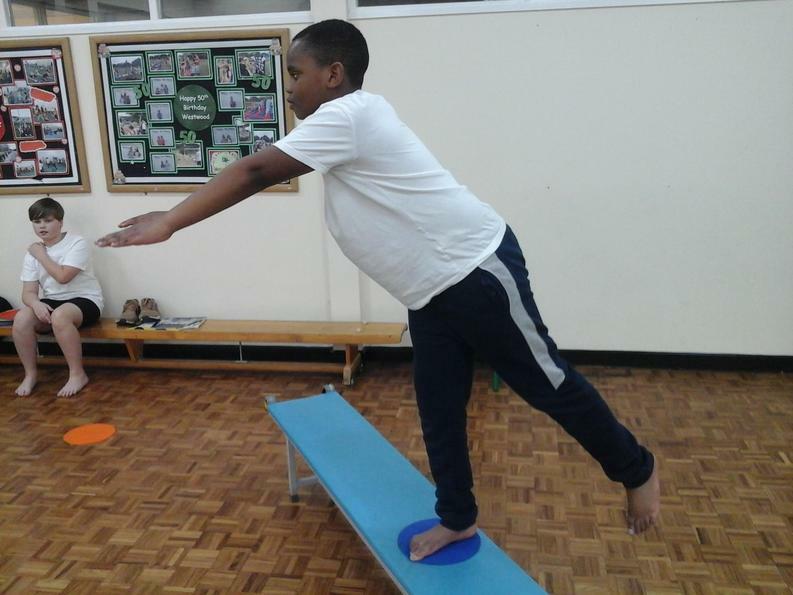 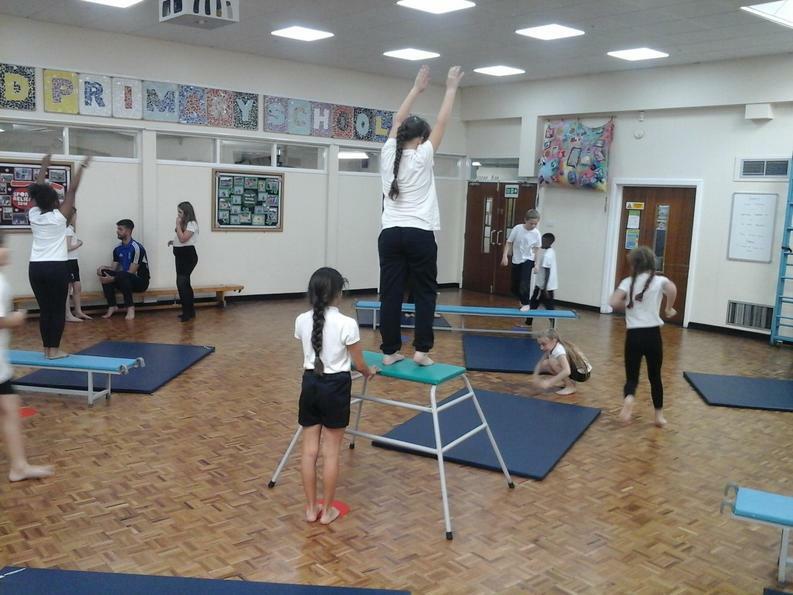 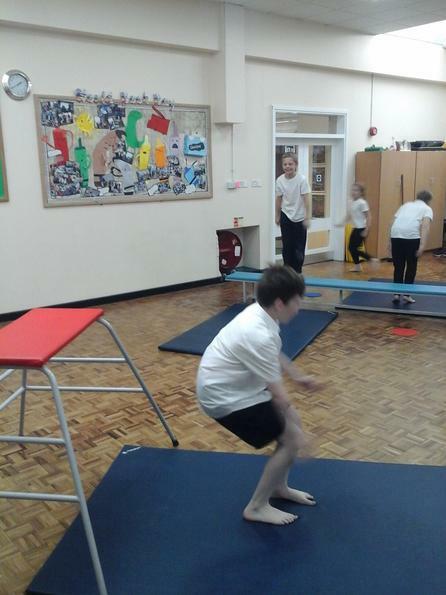 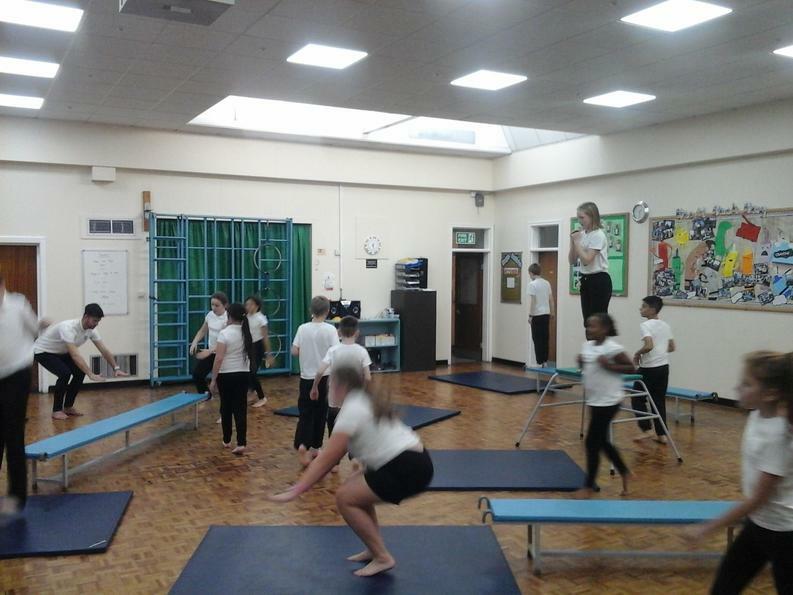 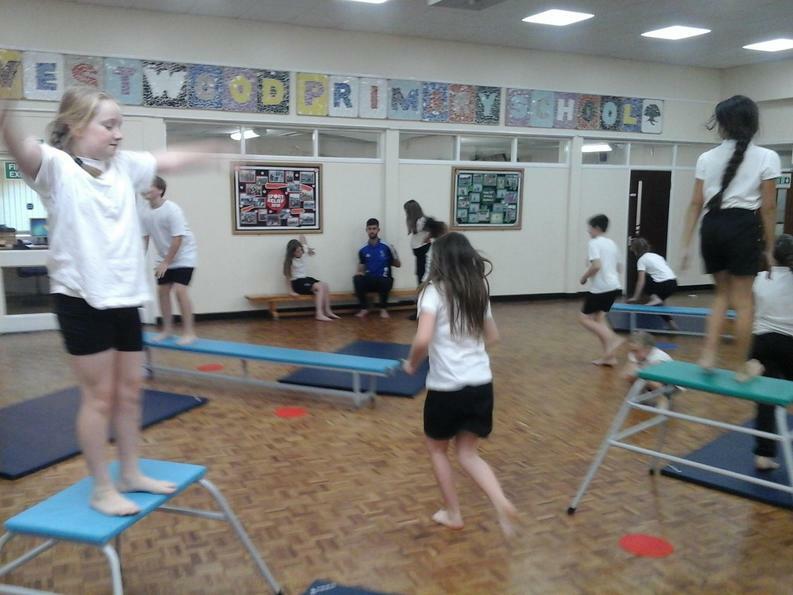 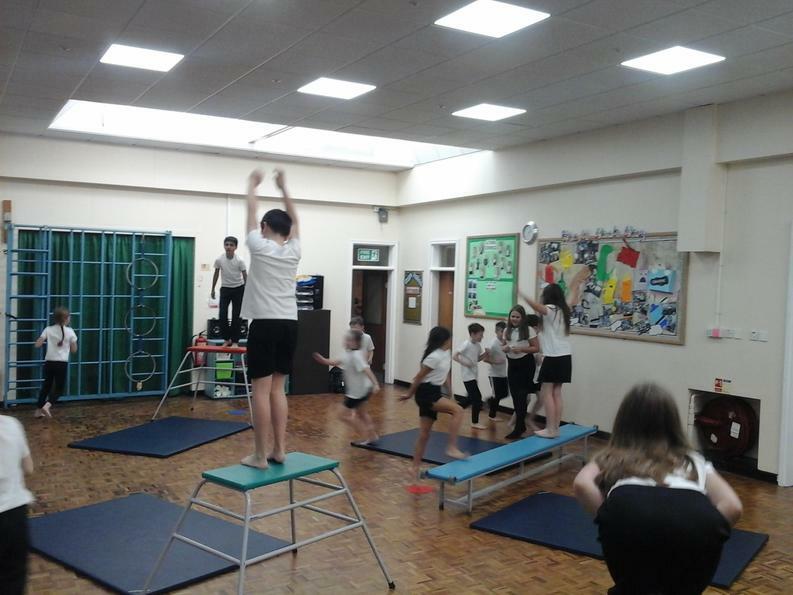 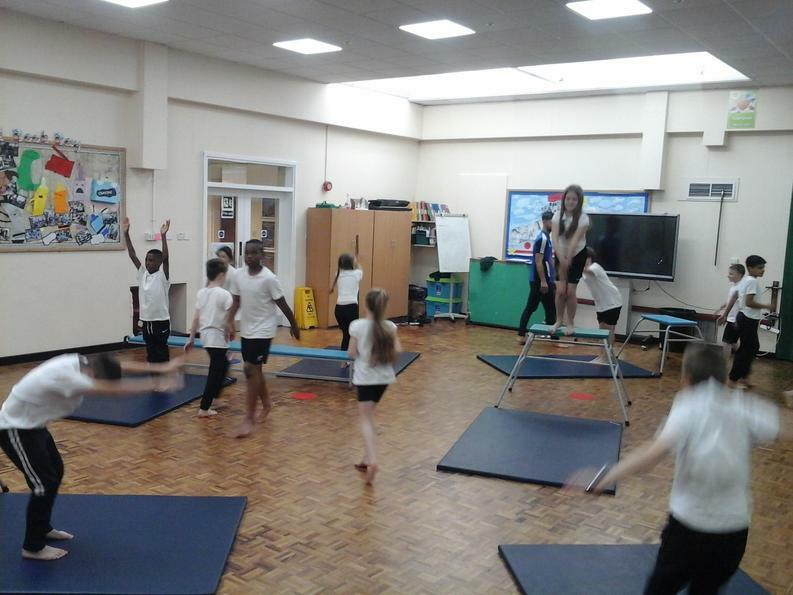 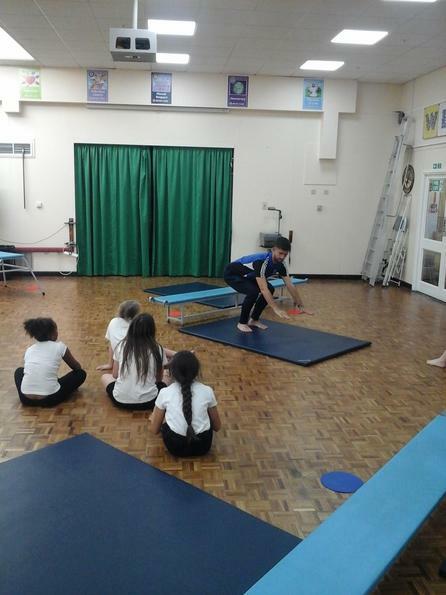 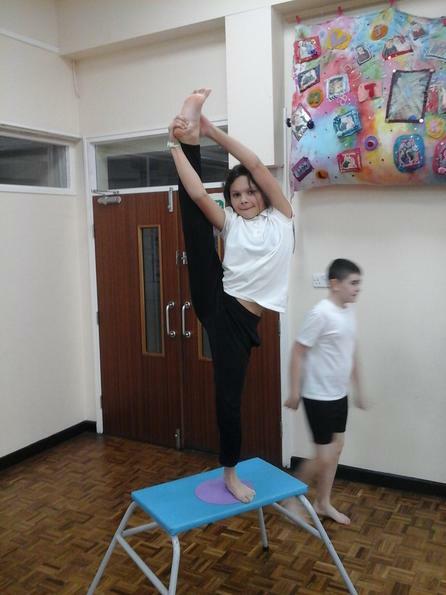 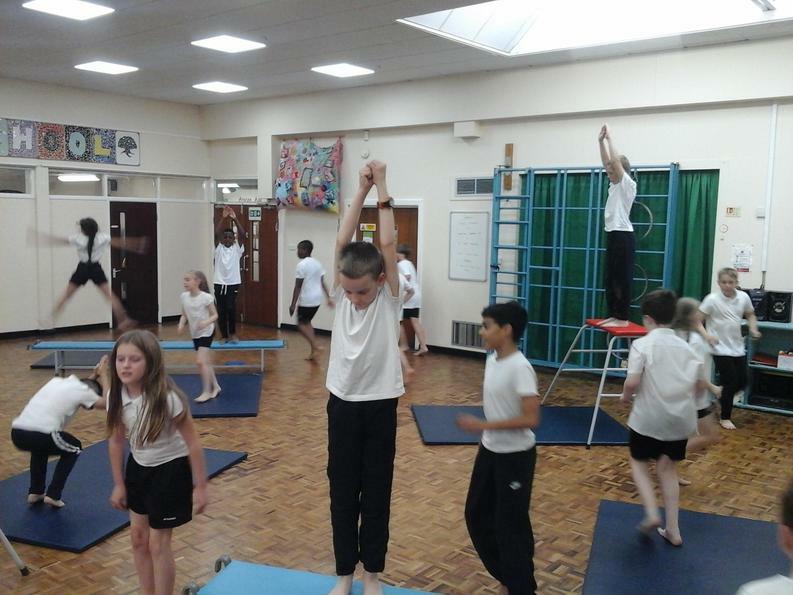 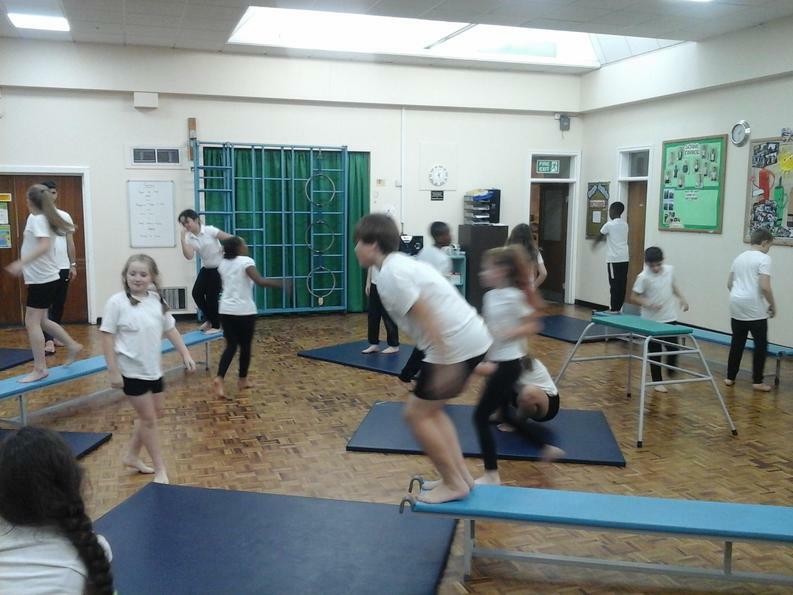 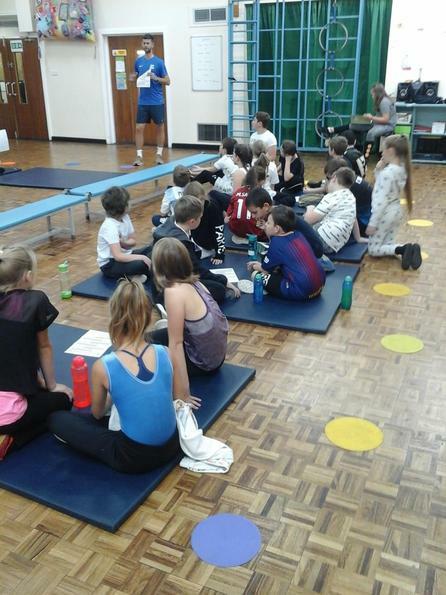 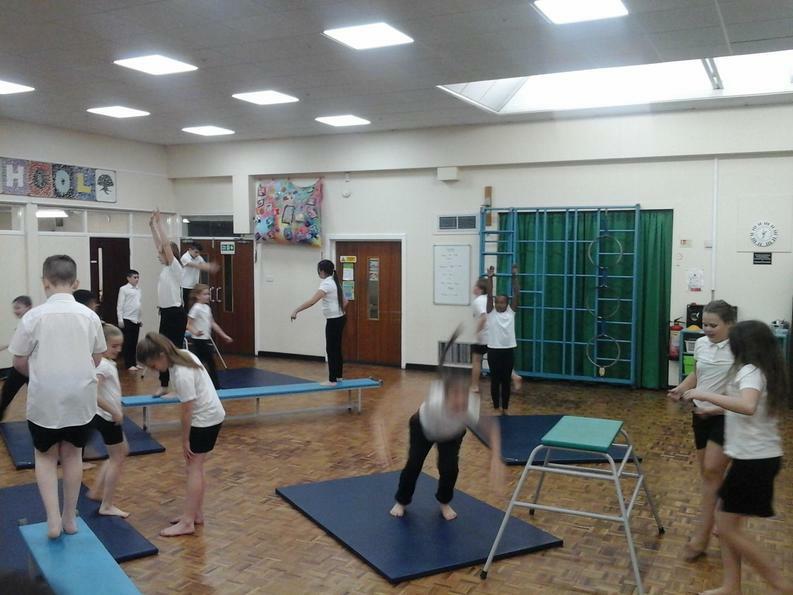 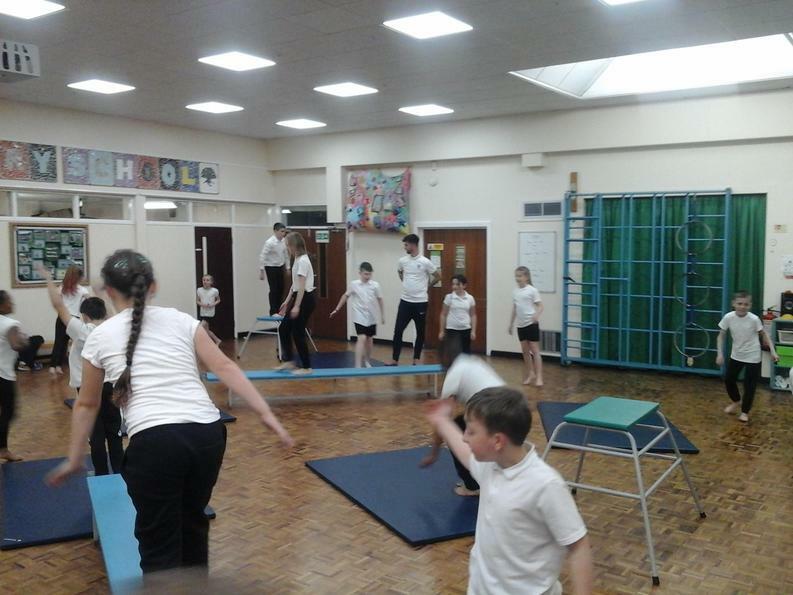 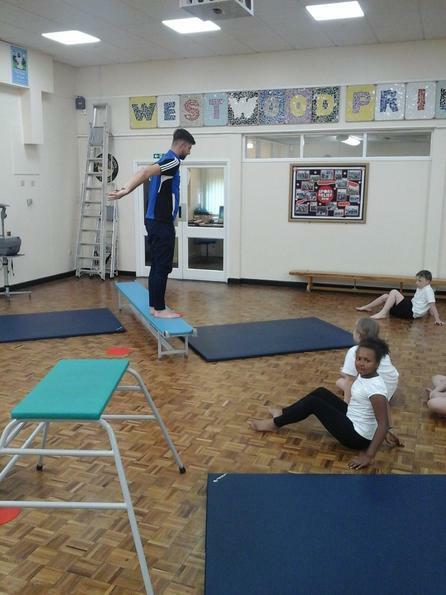 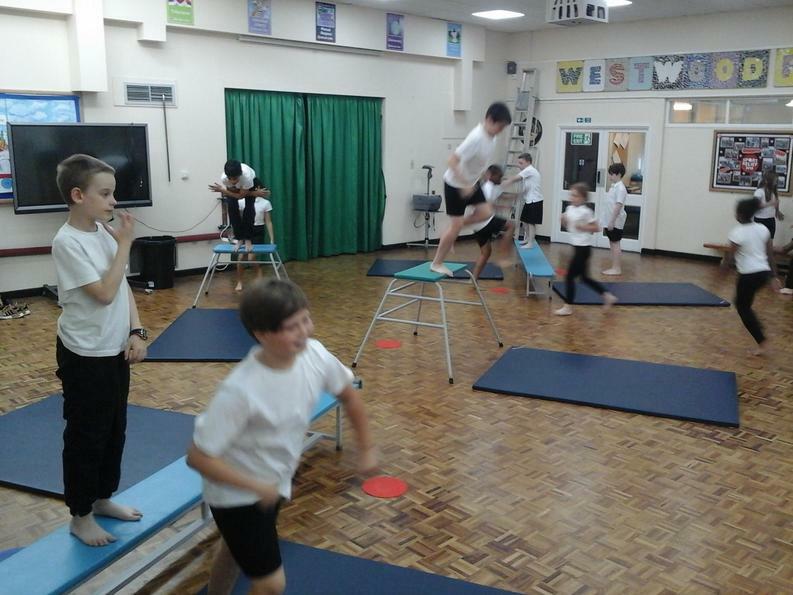 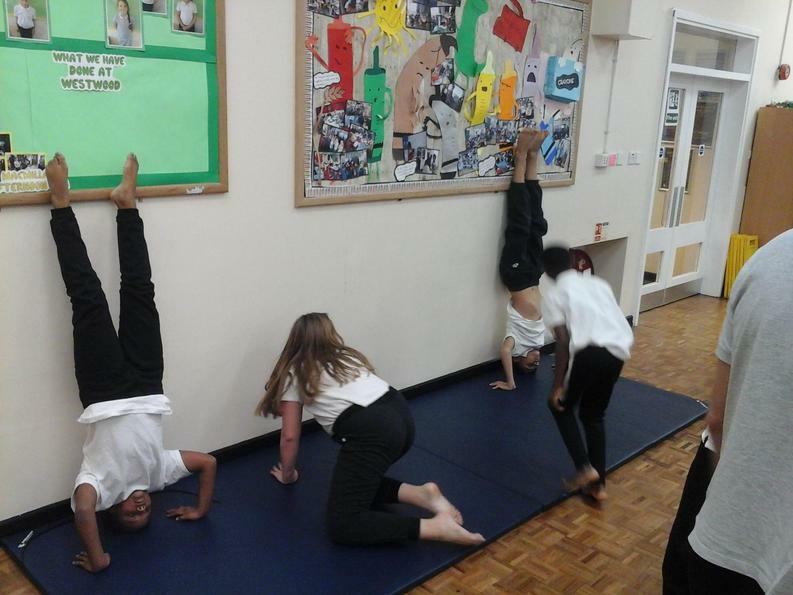 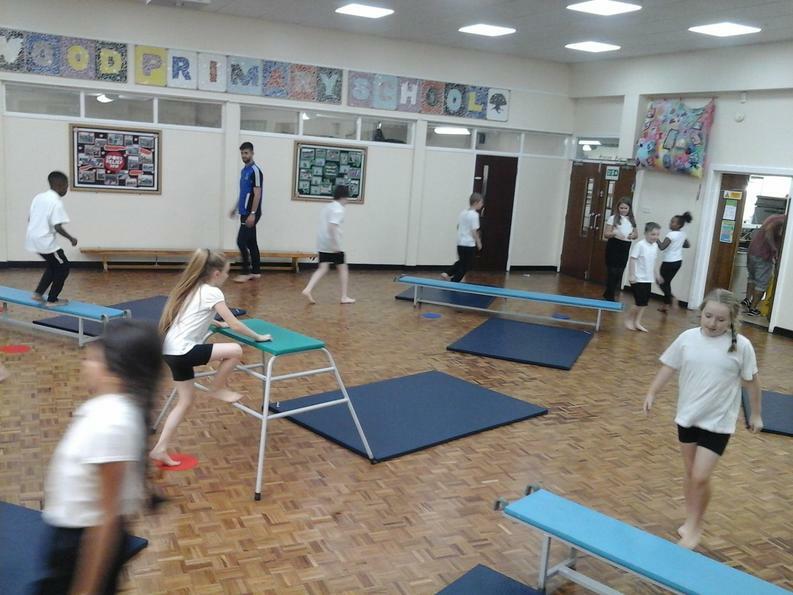 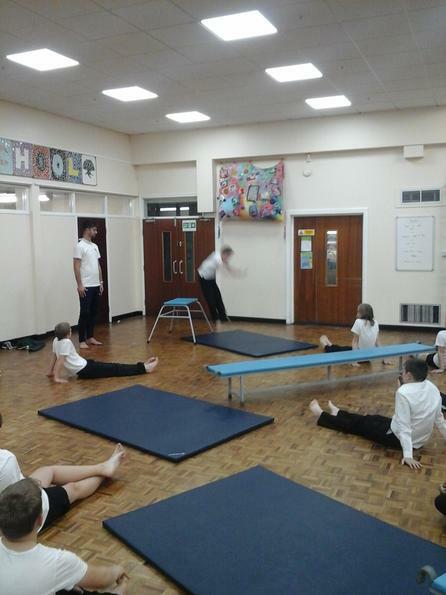 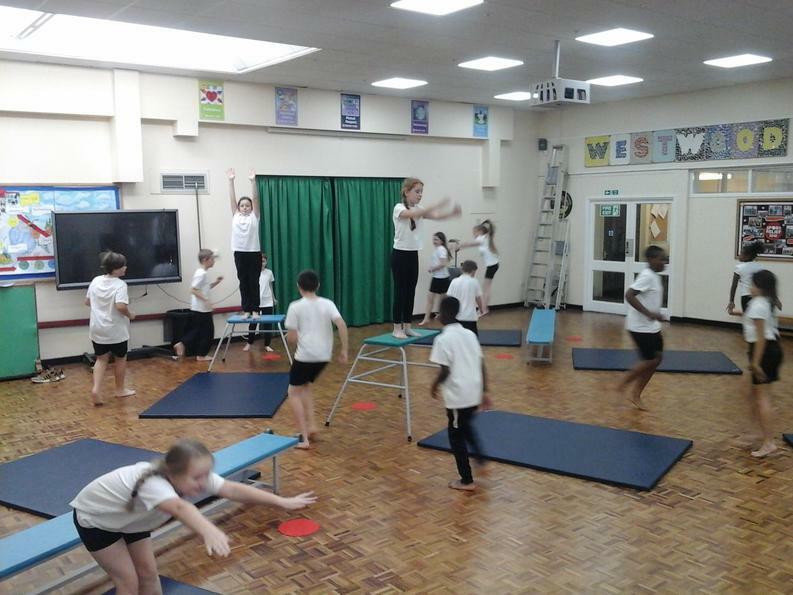 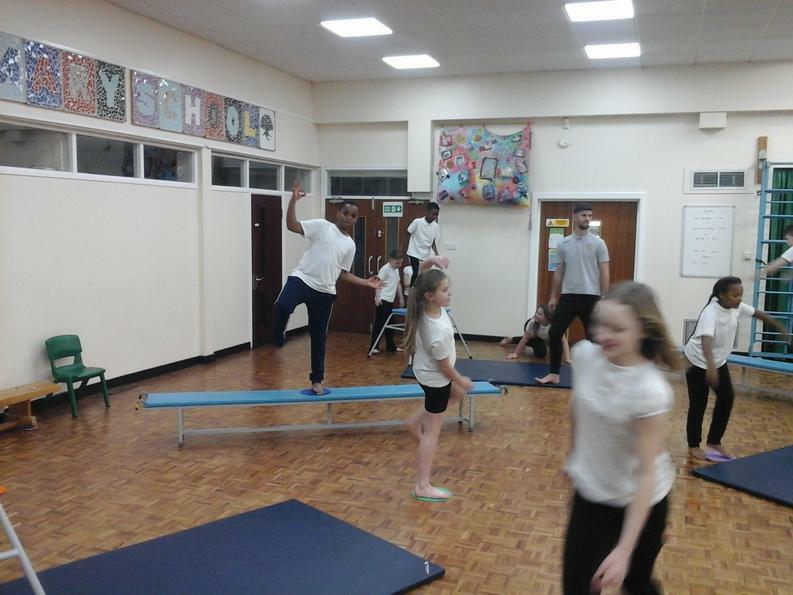 This term in PE we will be learning about Gymnastics. 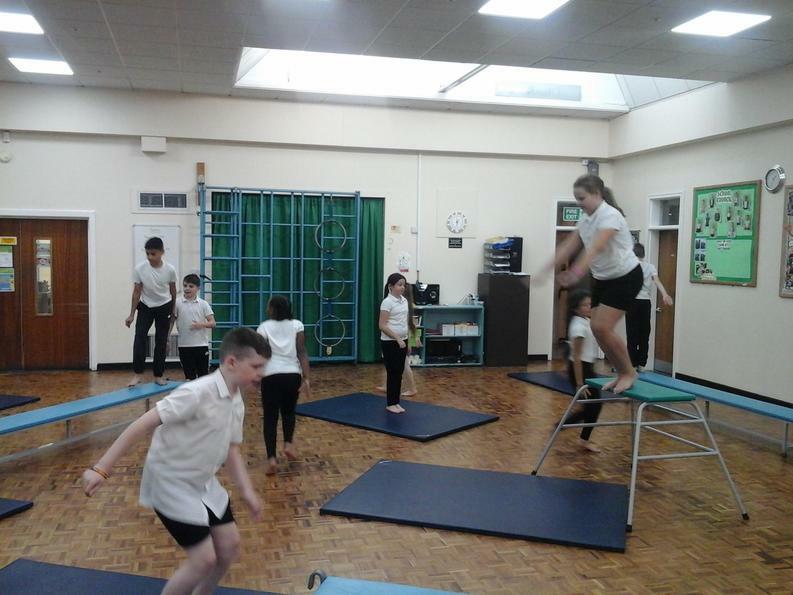 After a warm up (and a lesson on how to be safe on the apparatus), we began practicing our jumps and perfecting our landings. 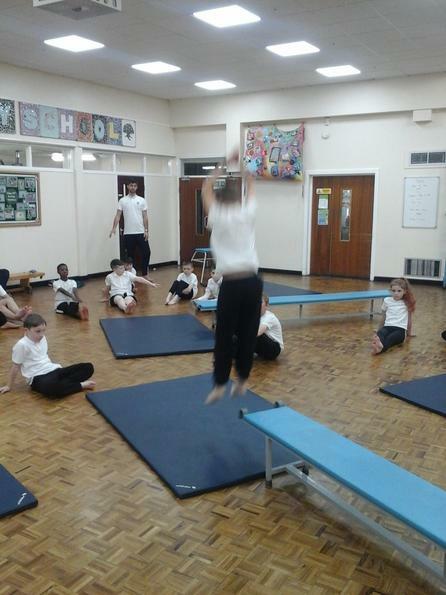 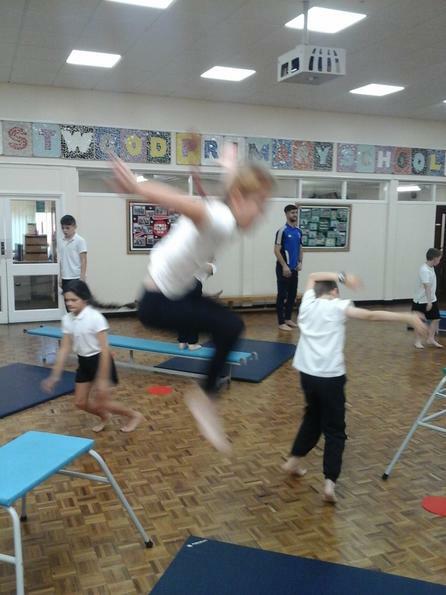 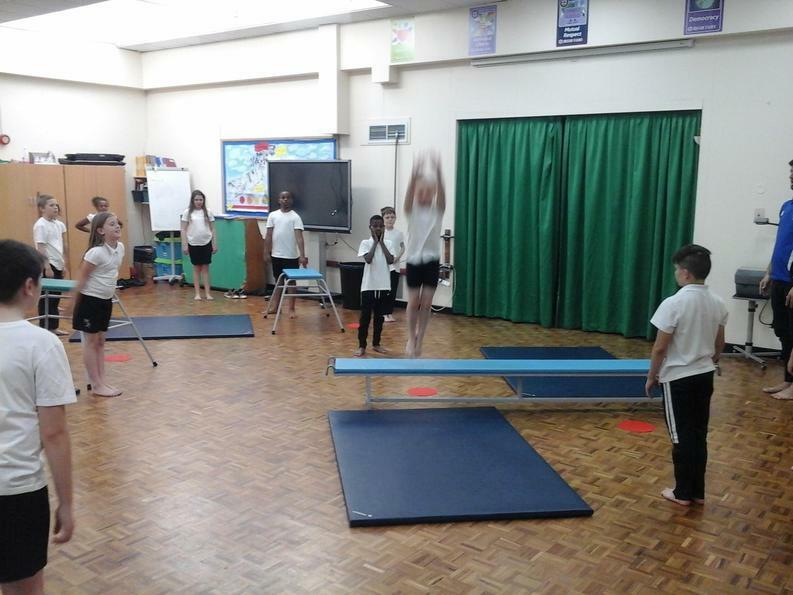 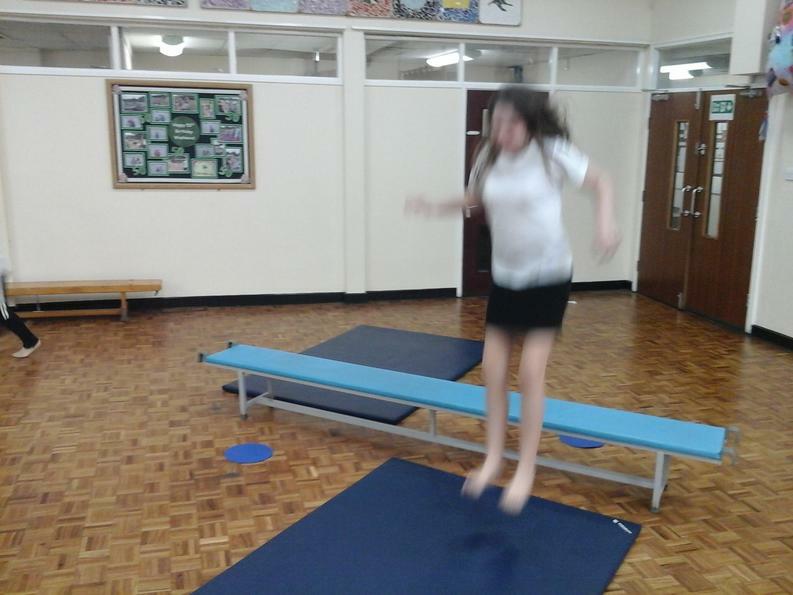 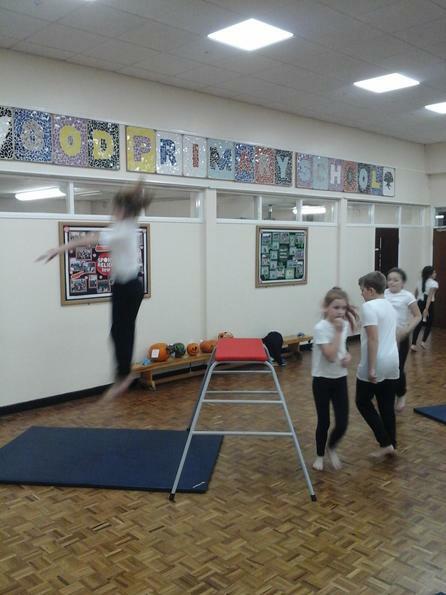 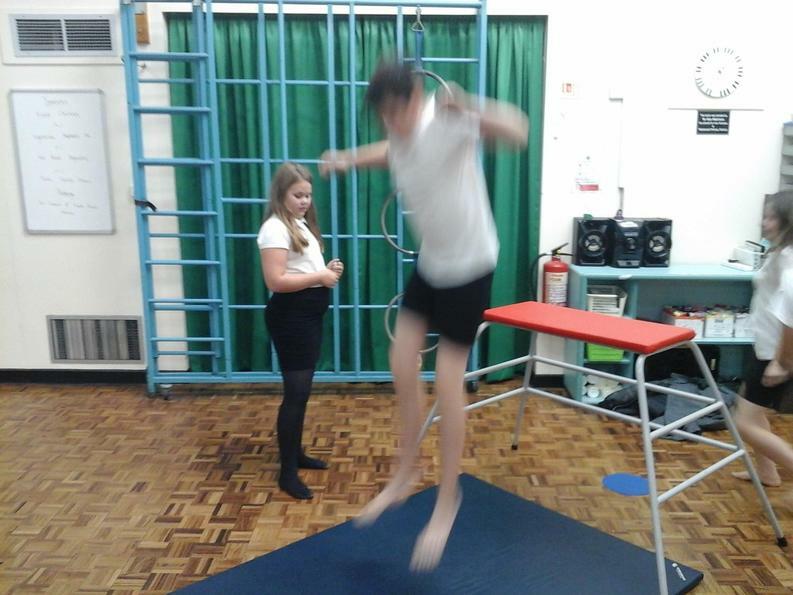 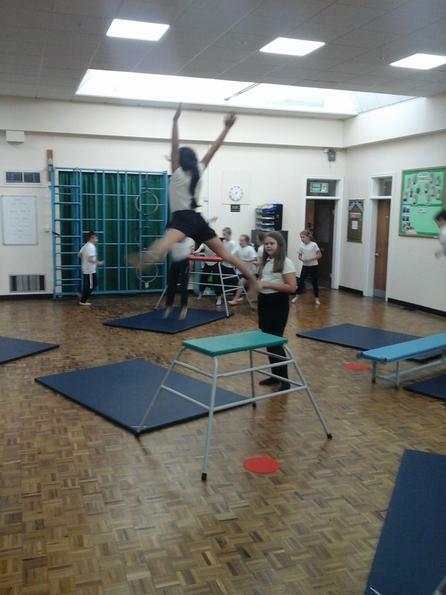 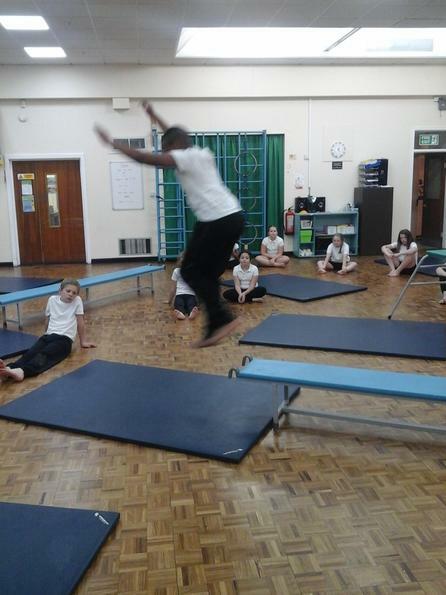 We learned 3 diffferent types of jumps: star jumps, tuck jumps and straight jumps. 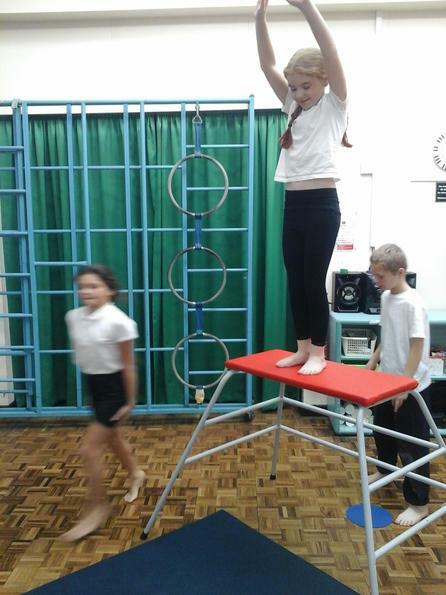 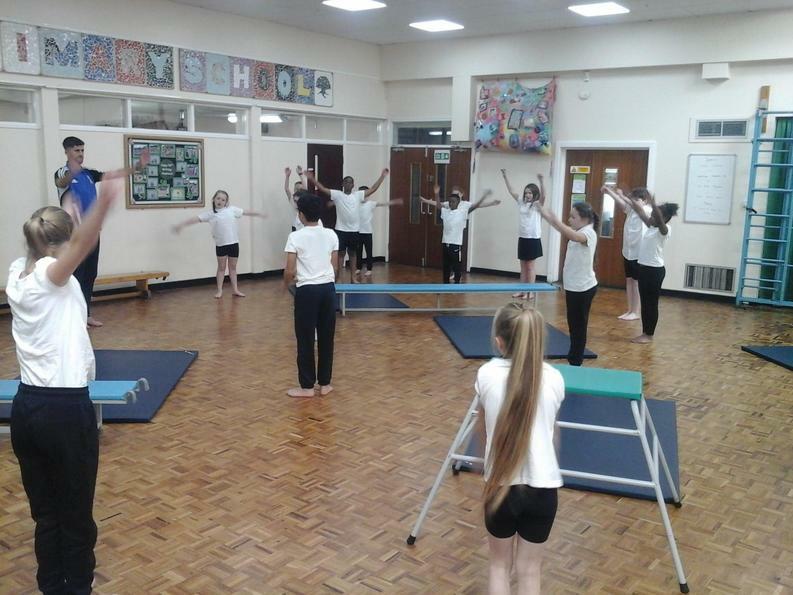 Toward the end of the lesson we were tasked with inventing a routine using 3 different pieces of the apparatus. 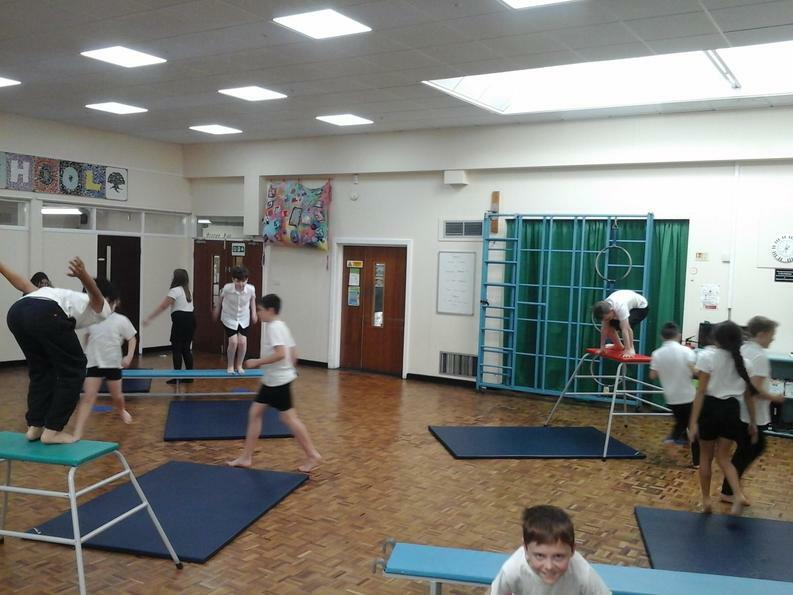 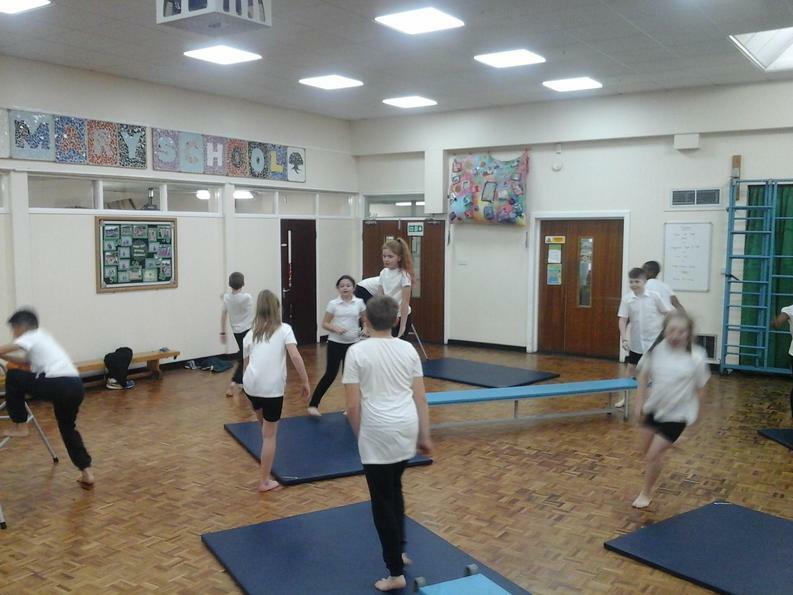 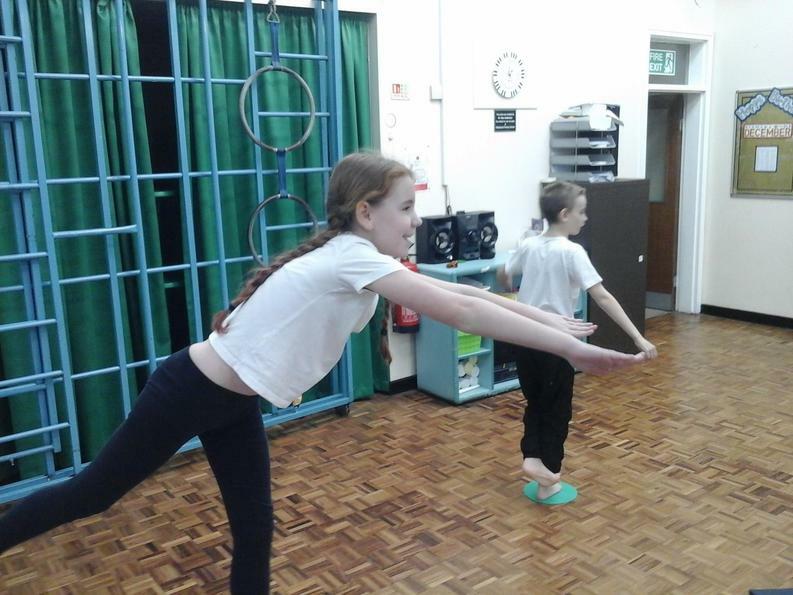 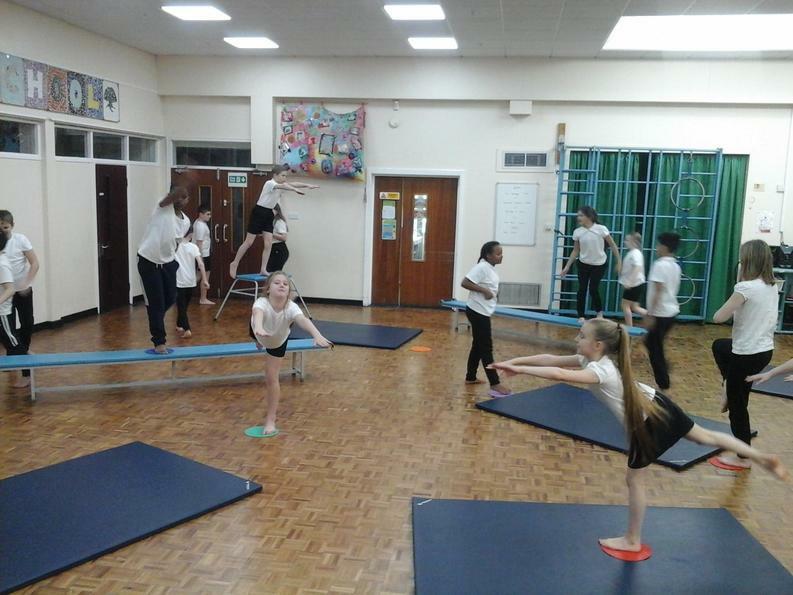 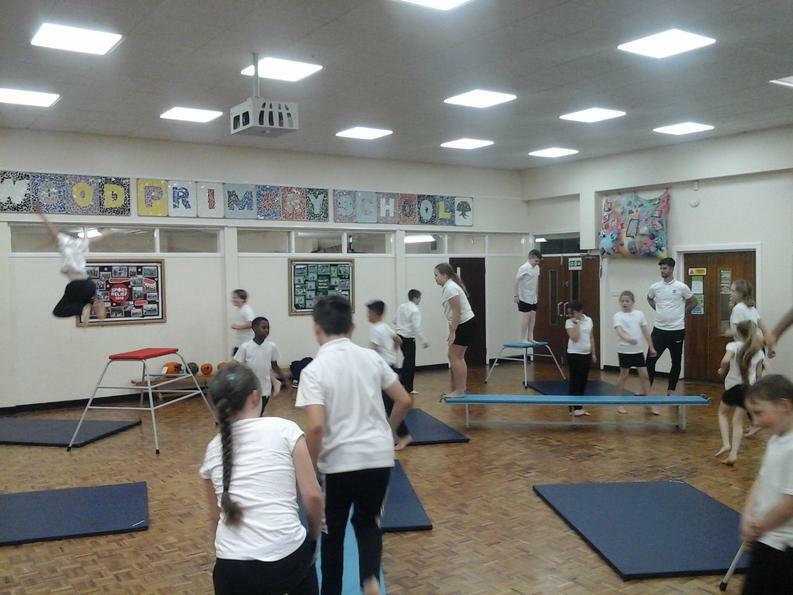 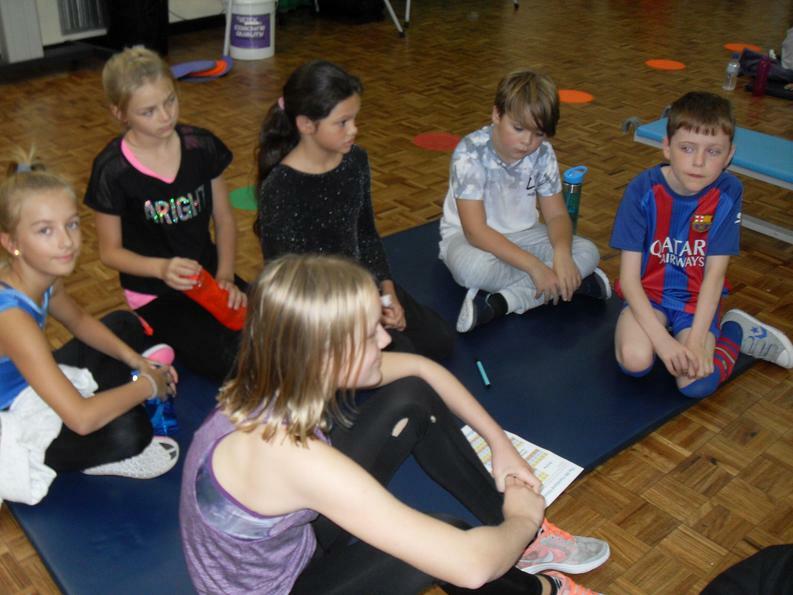 In the next gymnastics lesson, we started by recapping and practicing the three jumps from the previous week before moving on to new forms of gymnastics. 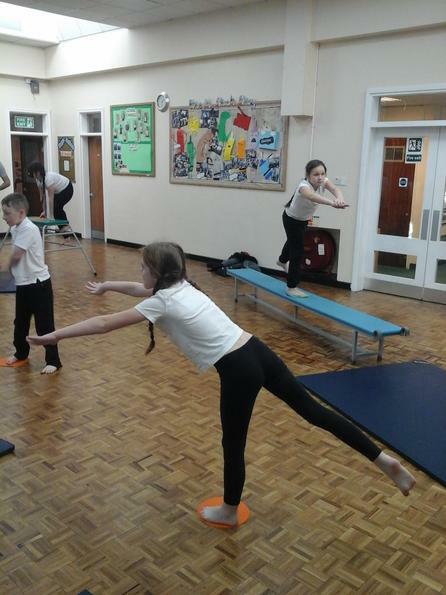 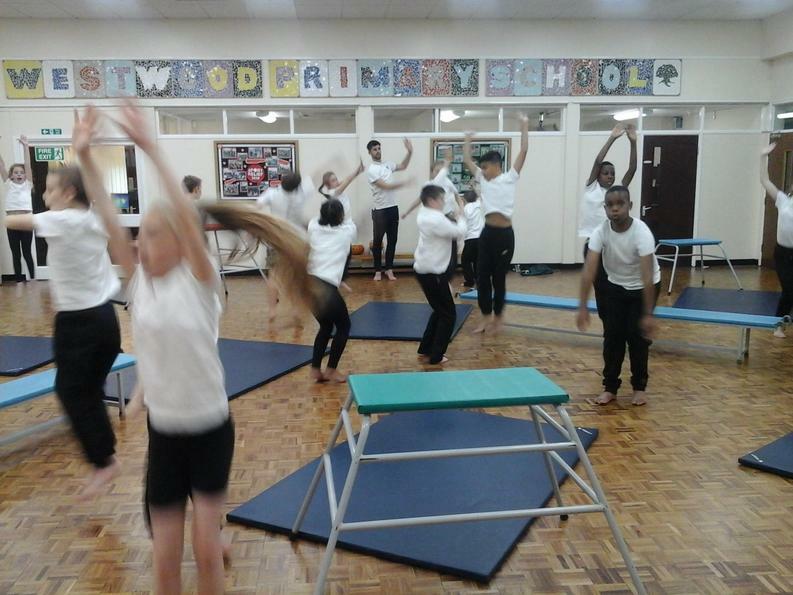 Following our warmup, we were shown two new gymnastic moves: half twist and full twist. 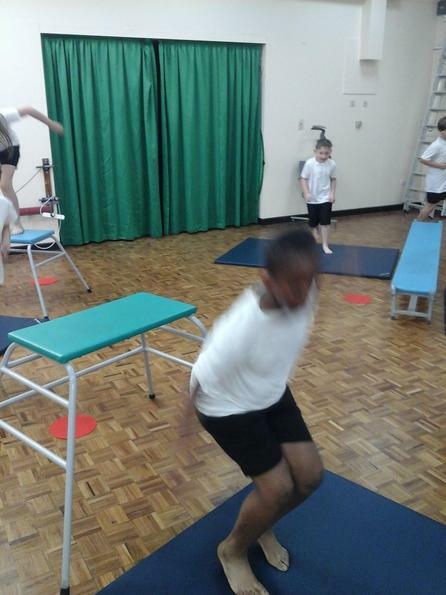 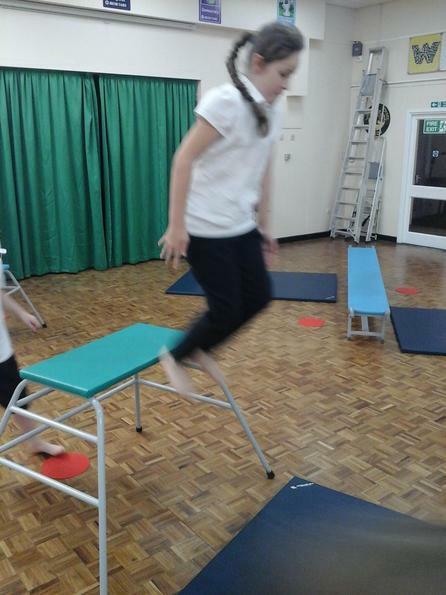 Next we learned and practiced another two new jumps: straddle jump and pike jump. 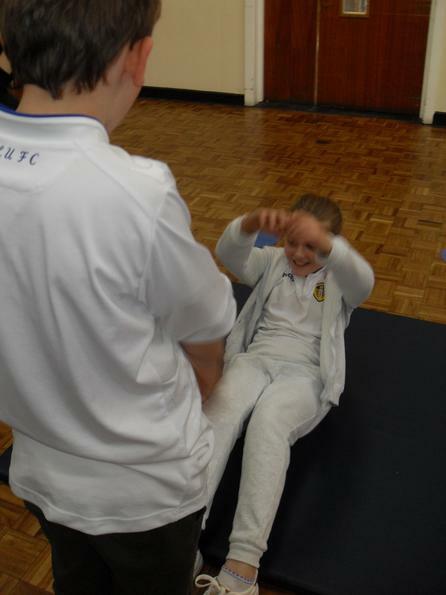 Finally, we looked at another method of movement: rolling. 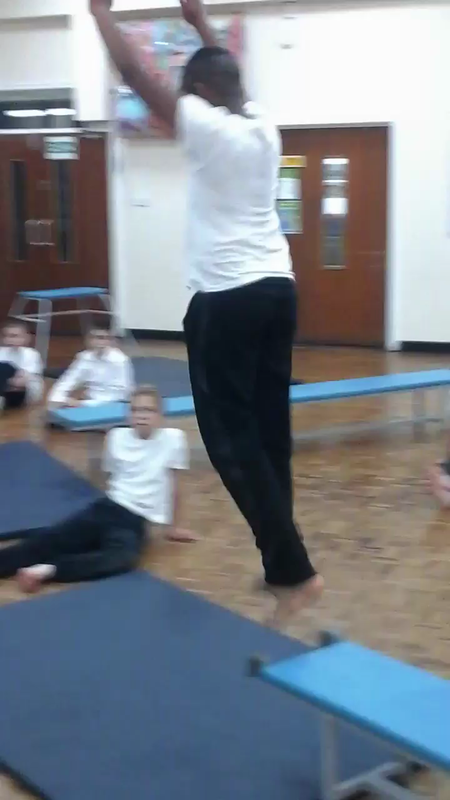 Mr Frankland showed us 3 different rolls: pencil roll, tuck roll and tuck rock. 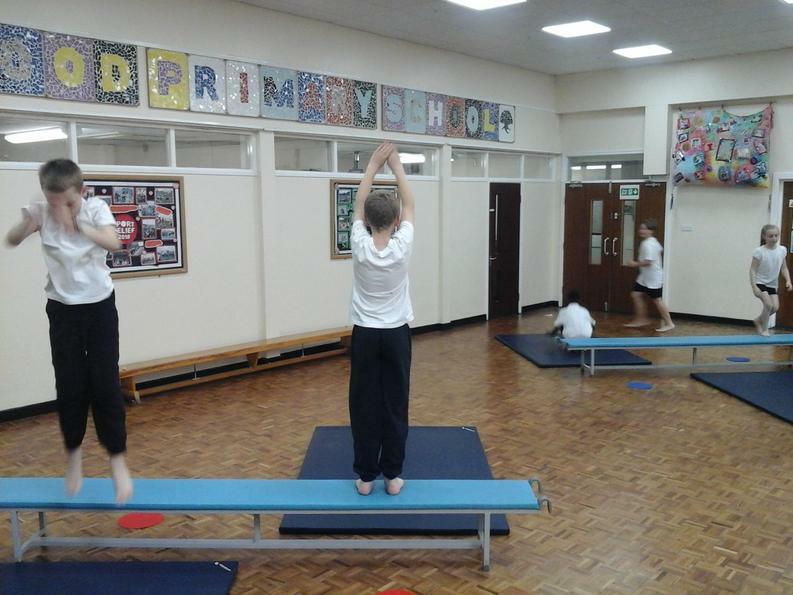 Next, we started adding some balances to our routine. 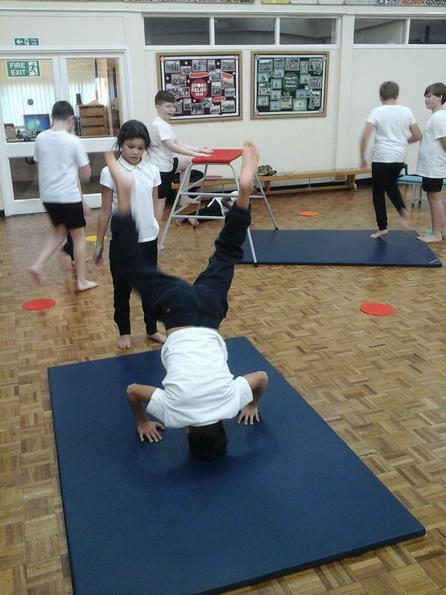 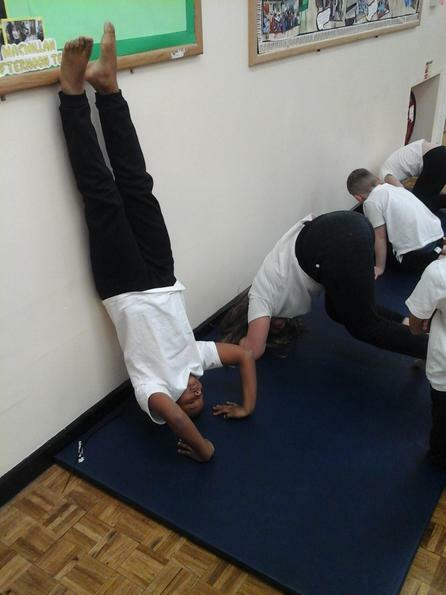 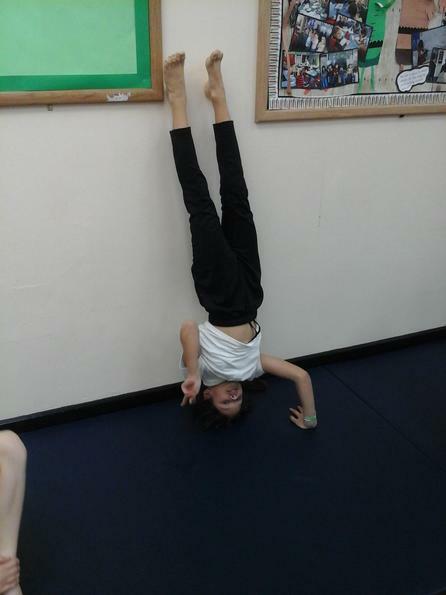 We practiced balancing on various parts of our bodies - even our heads! 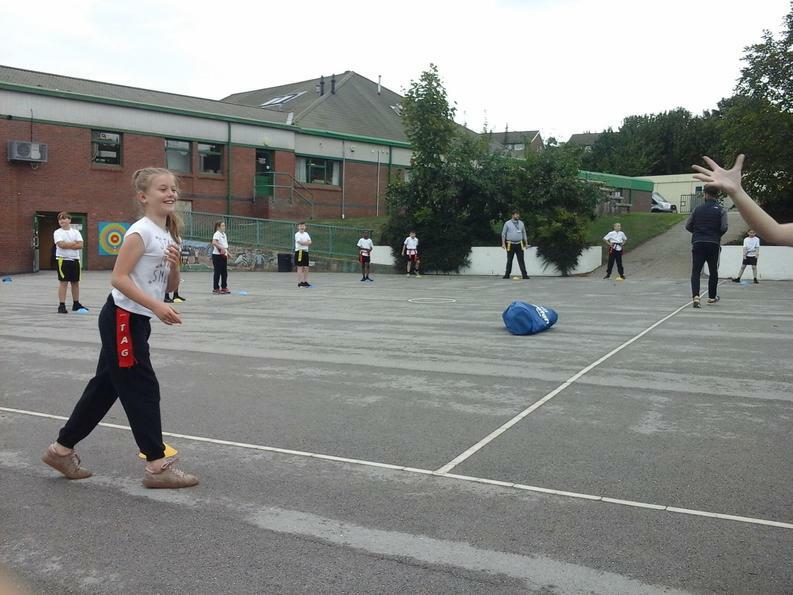 Which school photos taking up the hall, we took a break from gymnastics this week and did some athletics outside. 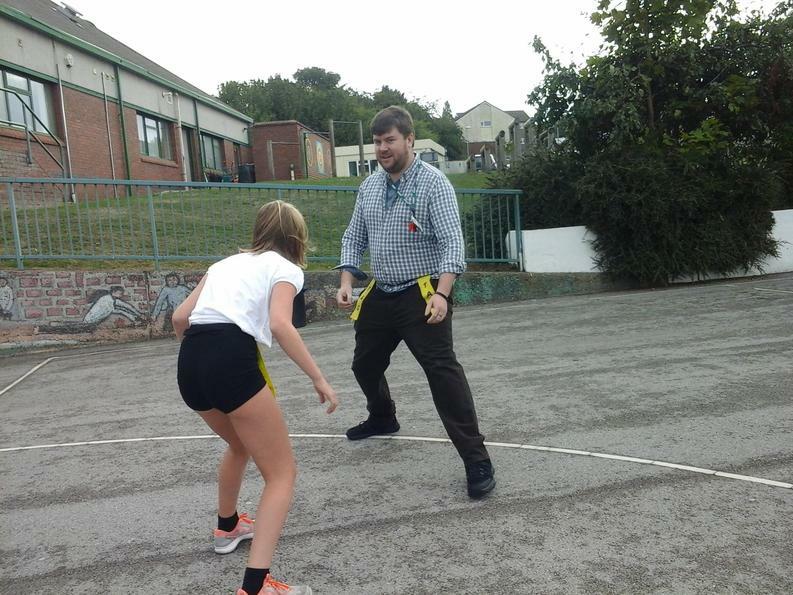 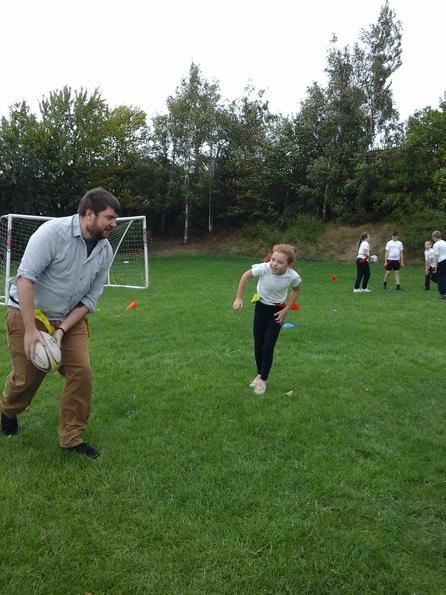 Mr Frankland thought this might be a good chance to improve our running form by teaching a few techniques. 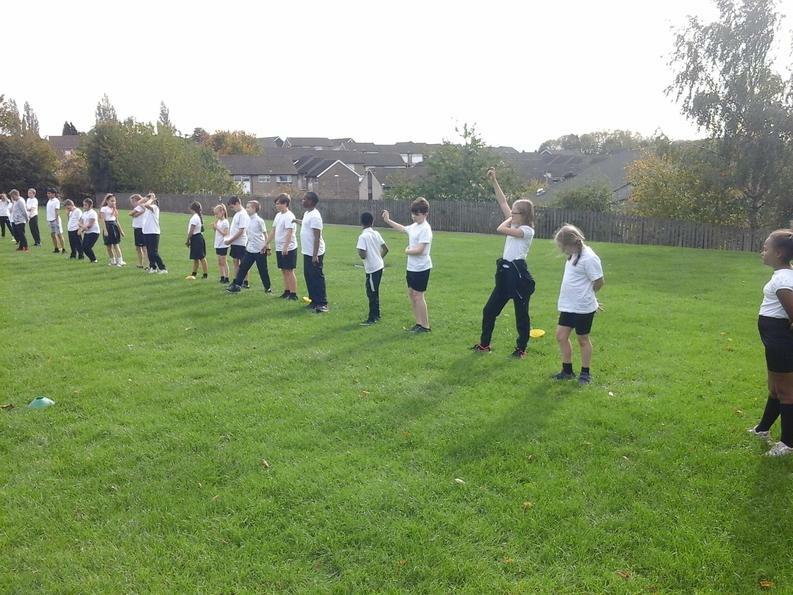 We practiced how to move our arms, our posture and our starting positions. 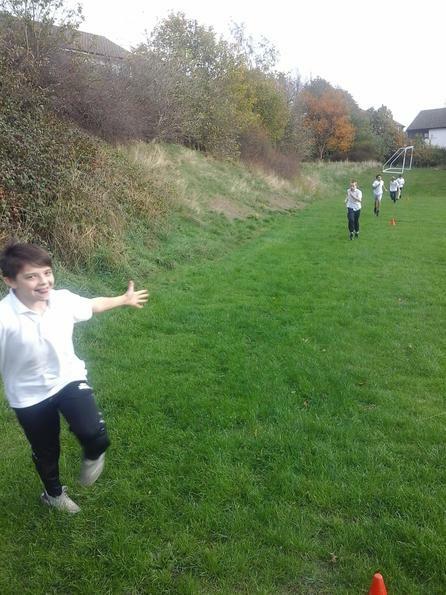 Then, using everything we had learned, we set out to find our personal best: how far we could sprint in just 3 seconds. 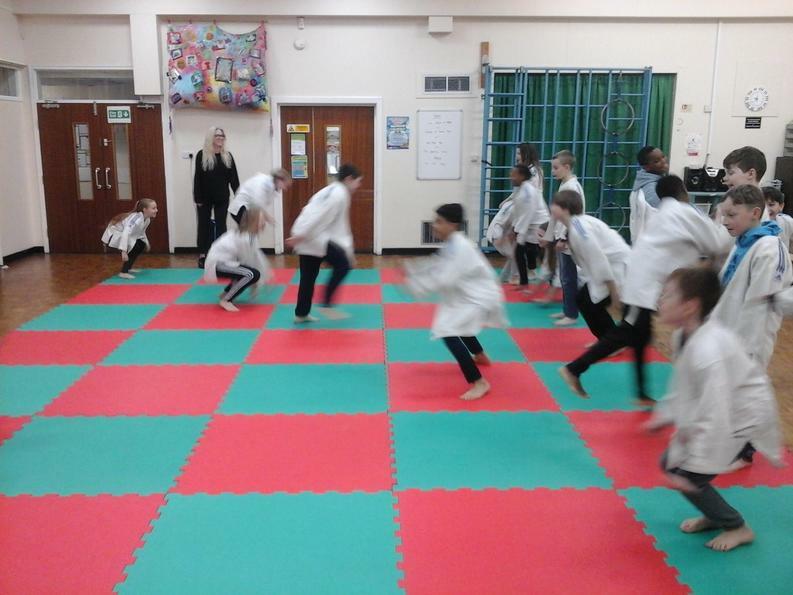 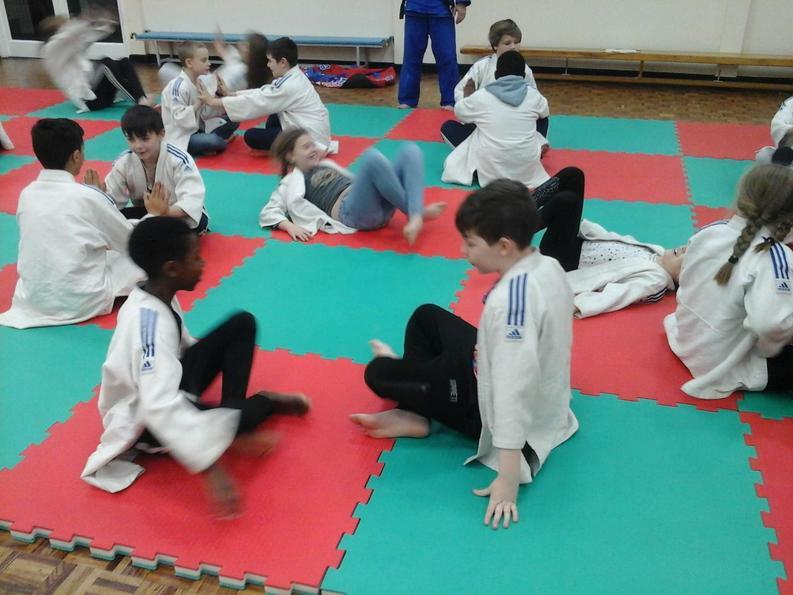 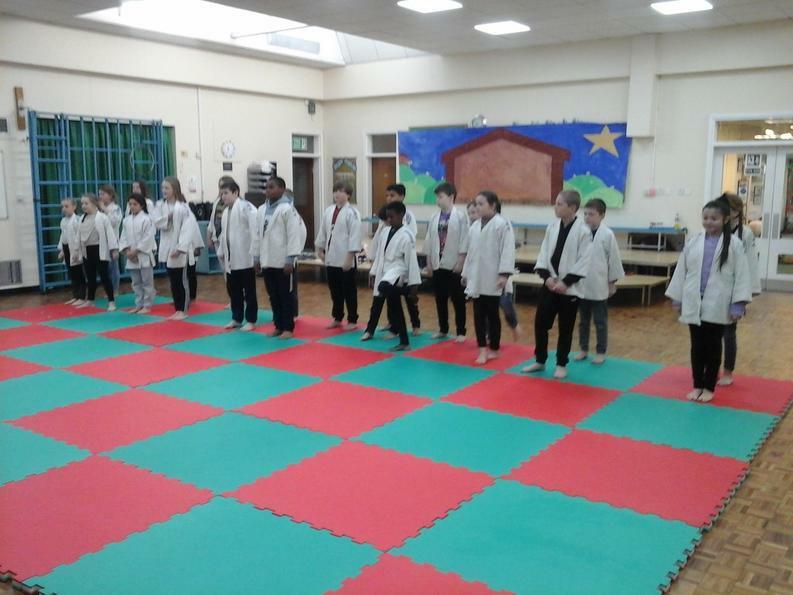 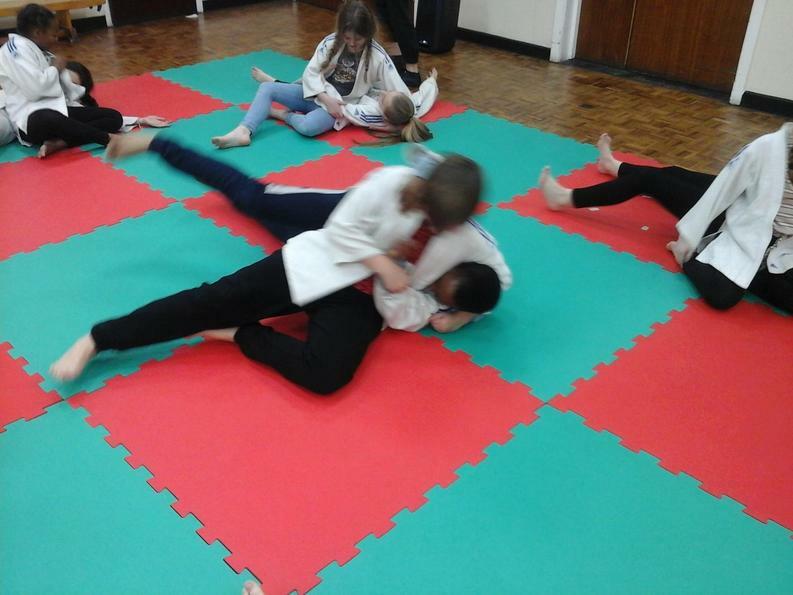 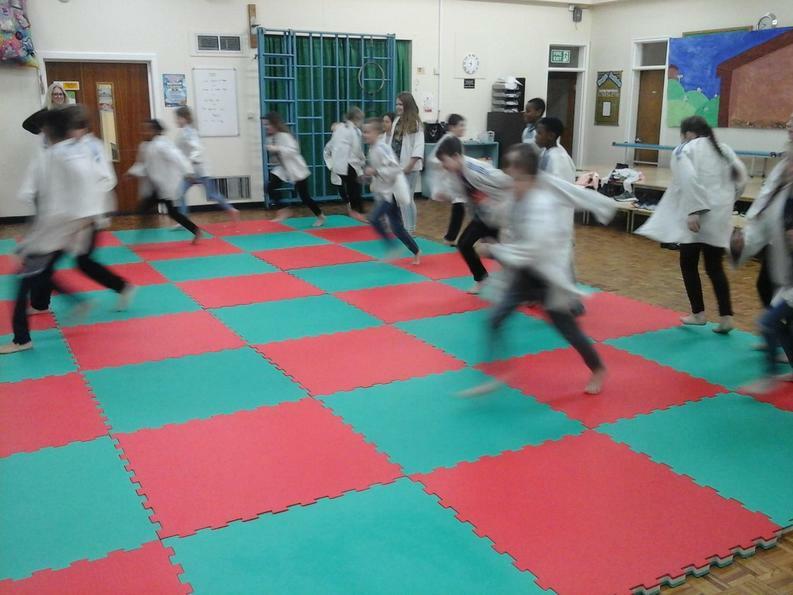 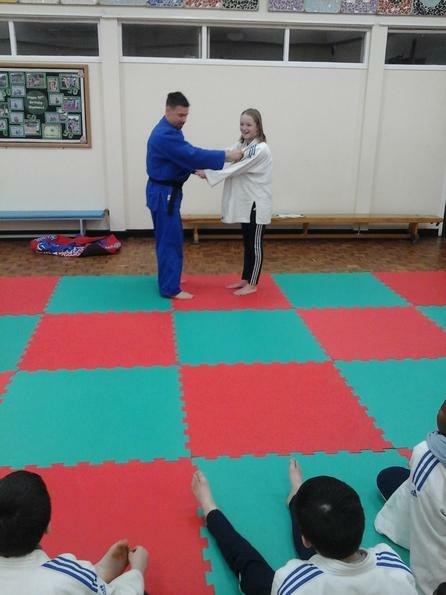 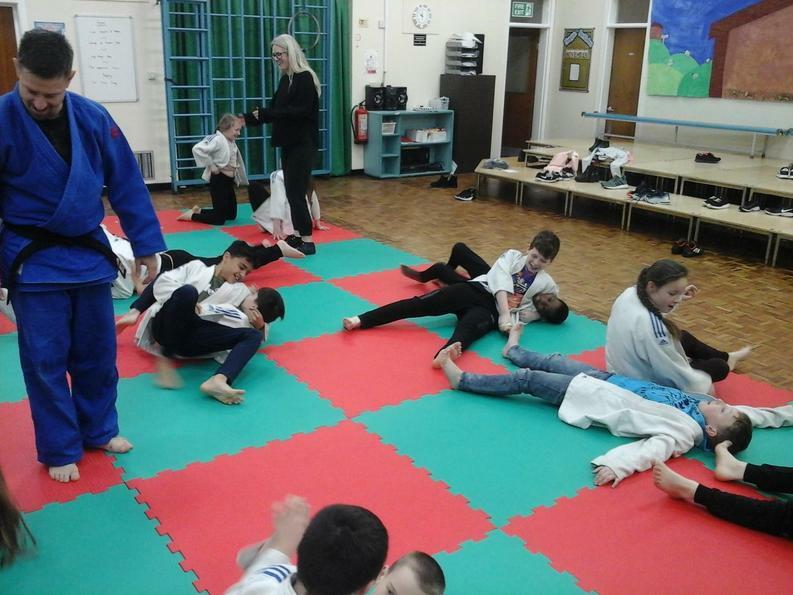 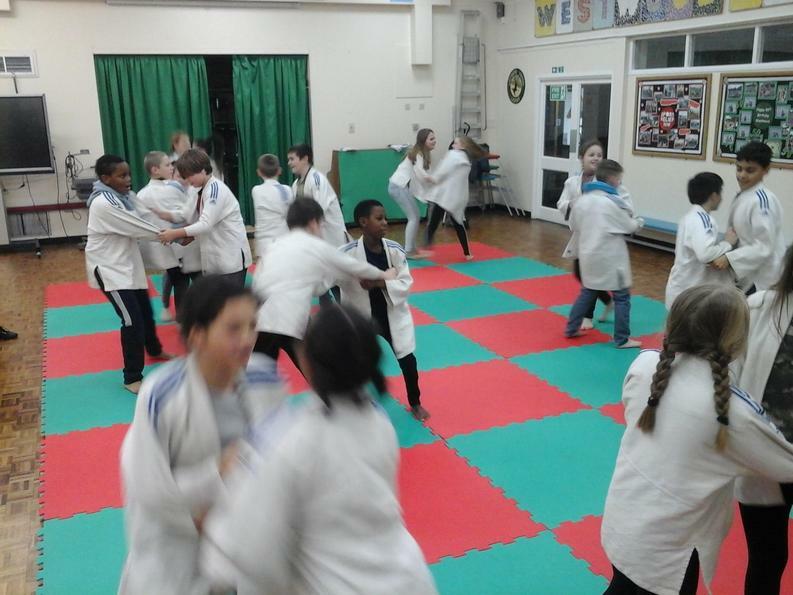 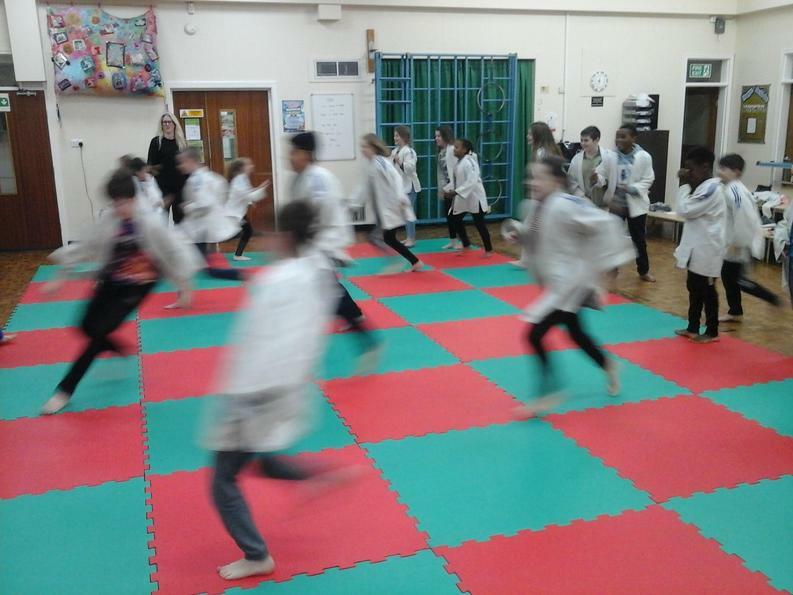 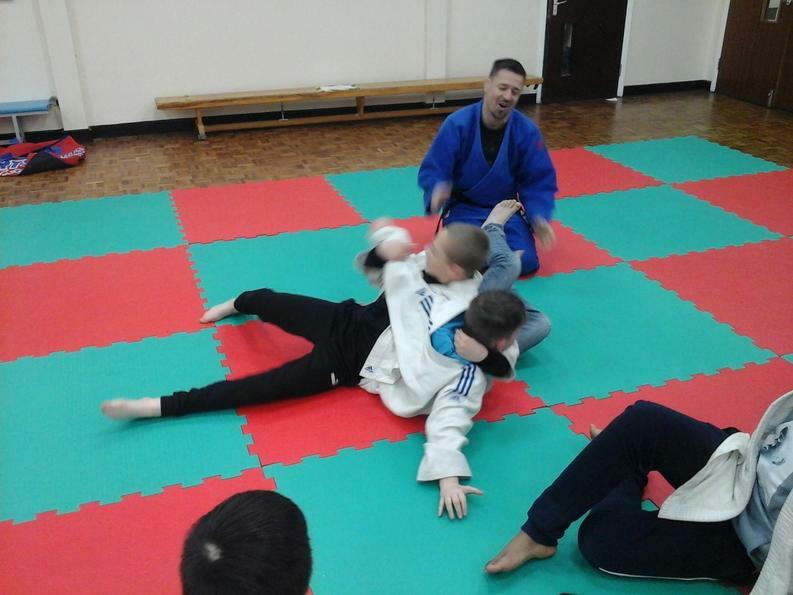 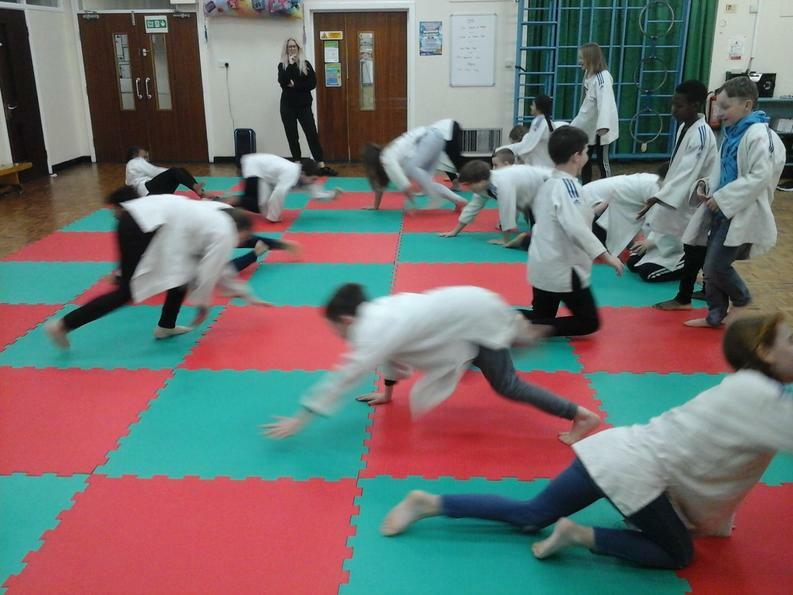 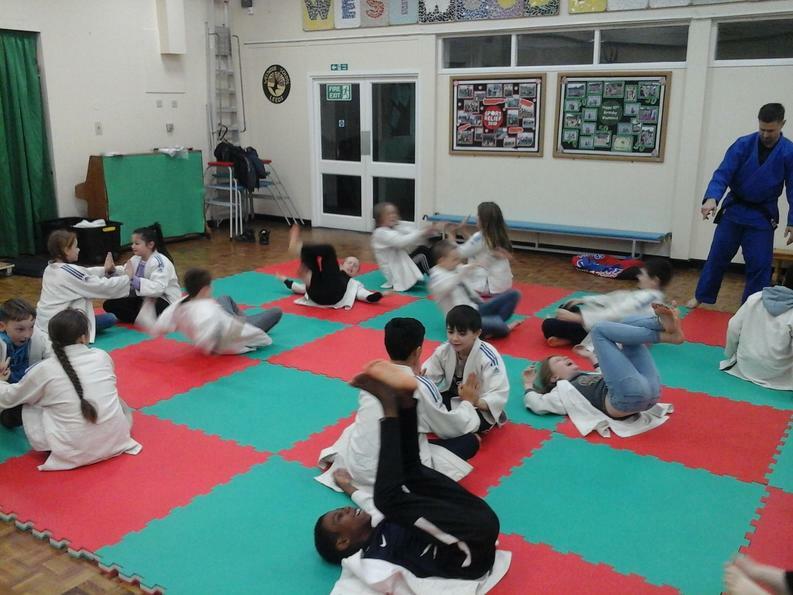 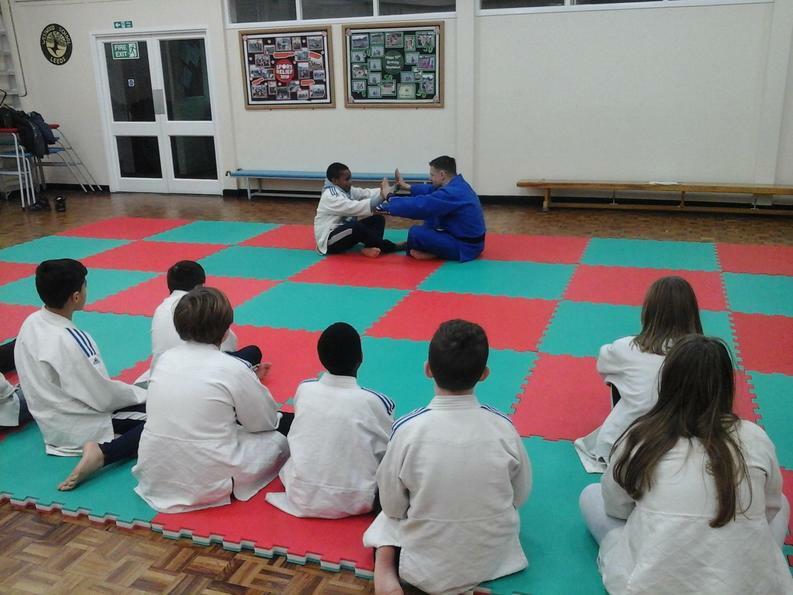 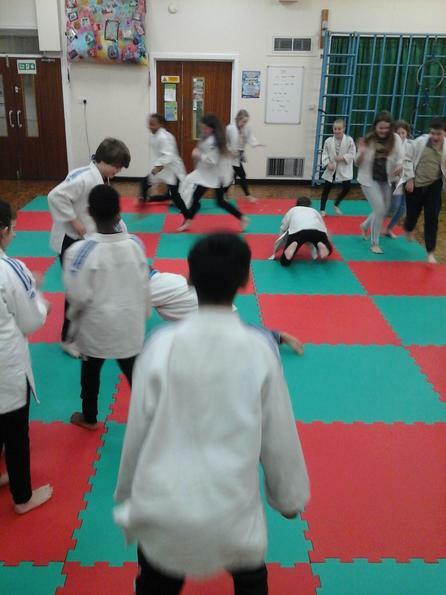 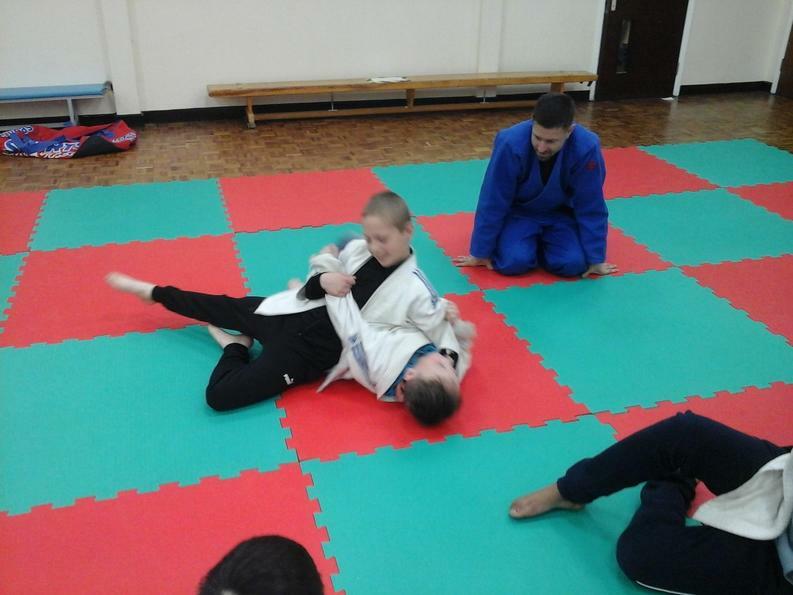 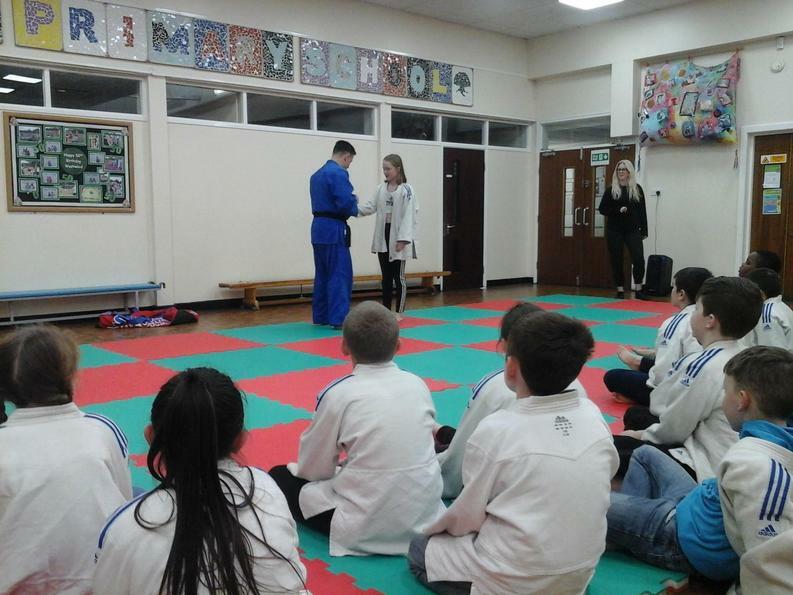 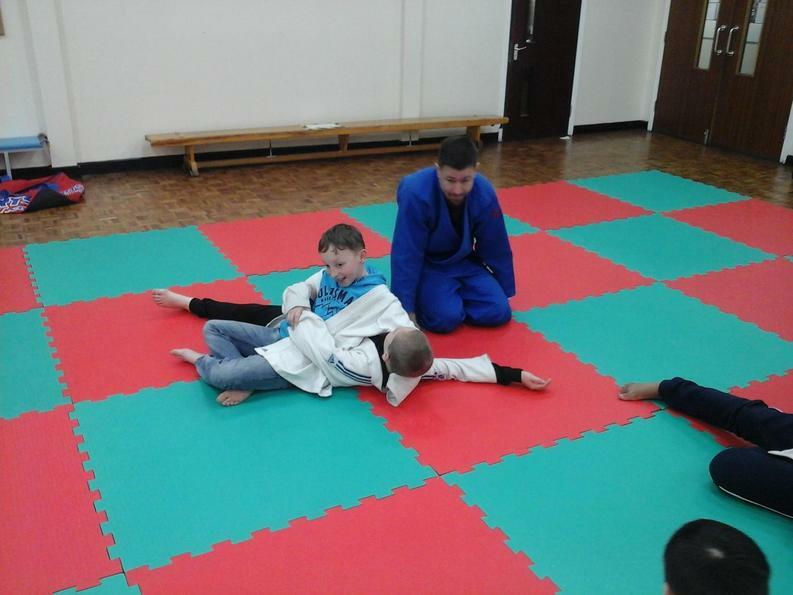 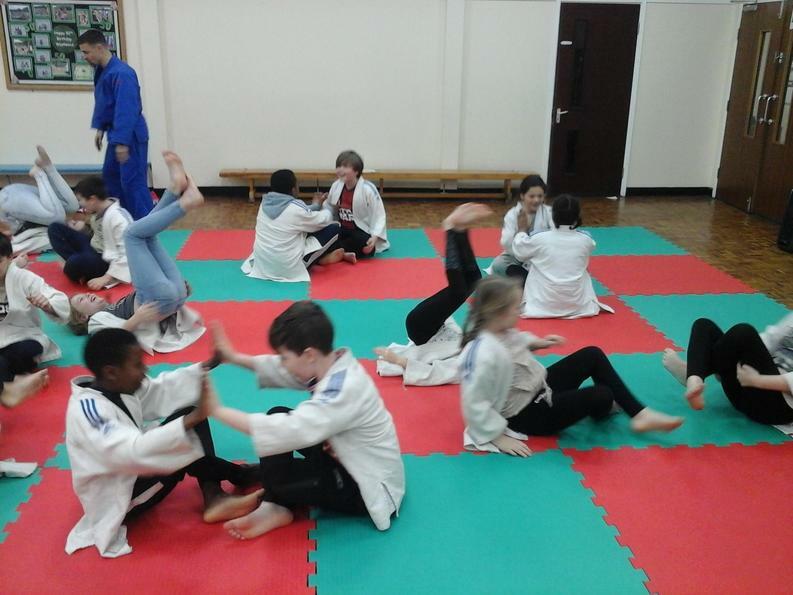 In December, we were lucky enough to have someone from the British Judo Association come in to teach us a lesson of judo. 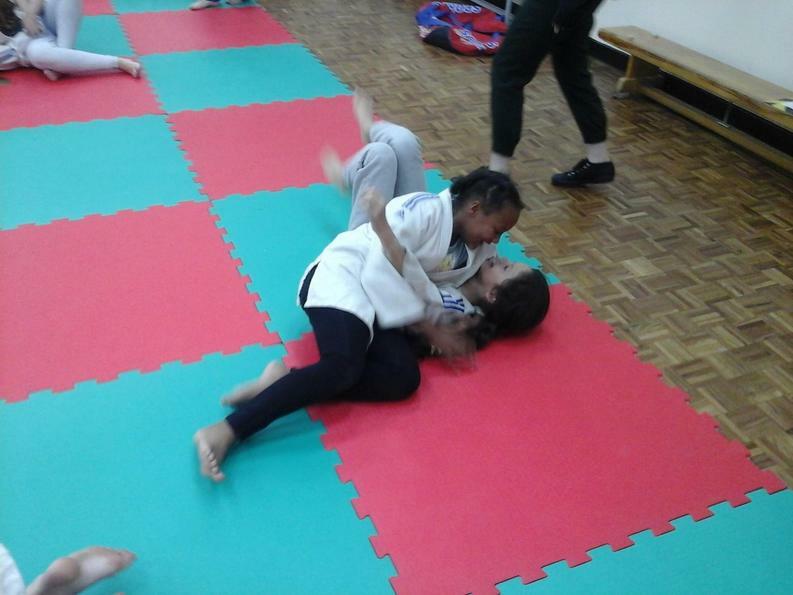 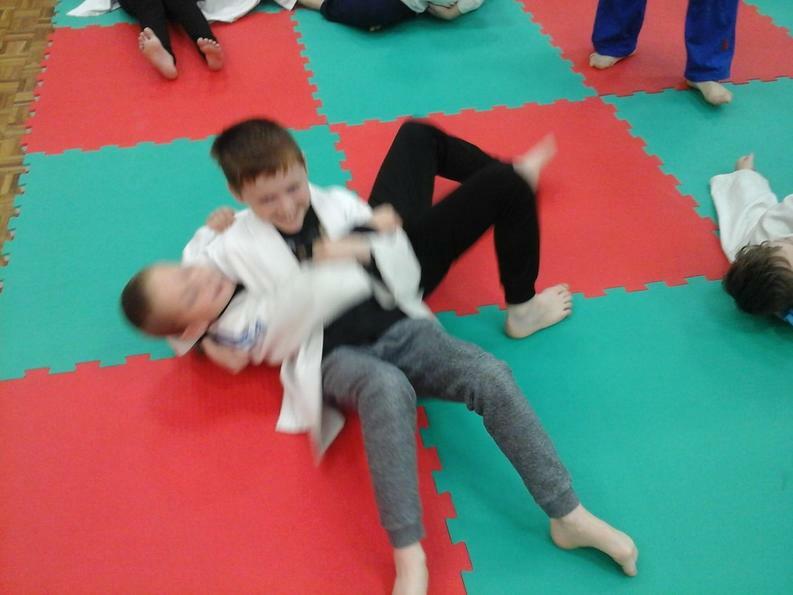 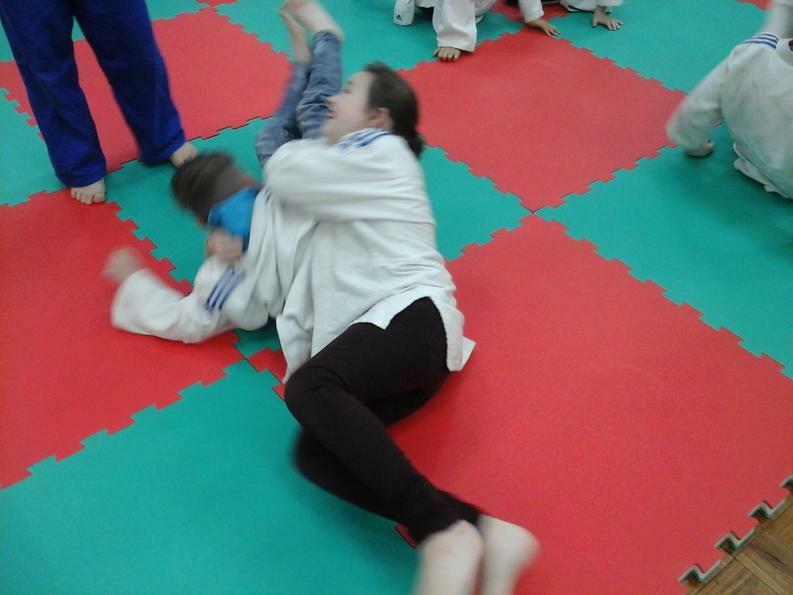 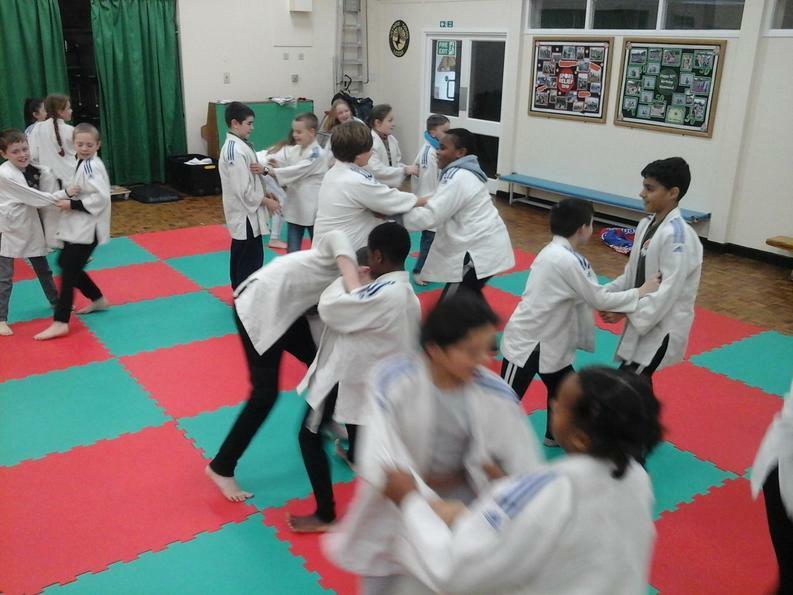 After donning our judo uniforms and warming up, it was time to practice how to hold on to an opponent and move around with them. 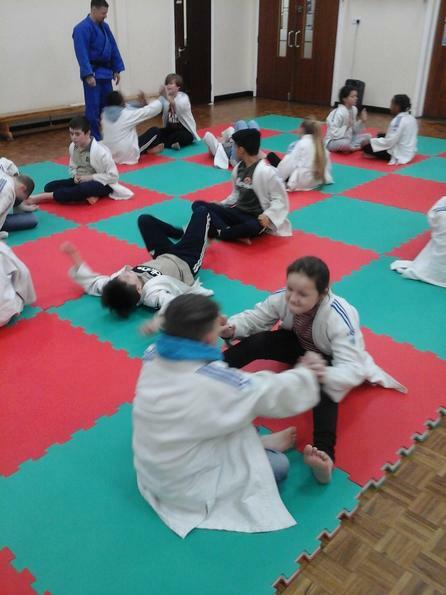 Next, from a seated position, we practiced a judo fall. 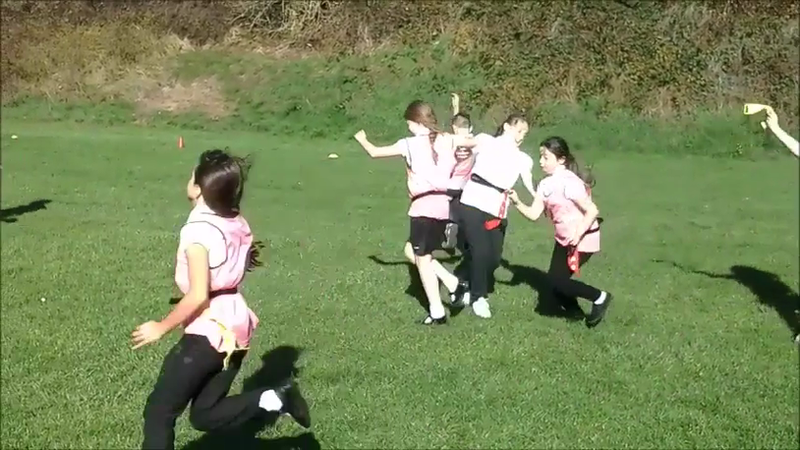 Finally, we learned how to grapple on the ground and took it in turns with our partners to try and hold them down while they tried to escape our hold. 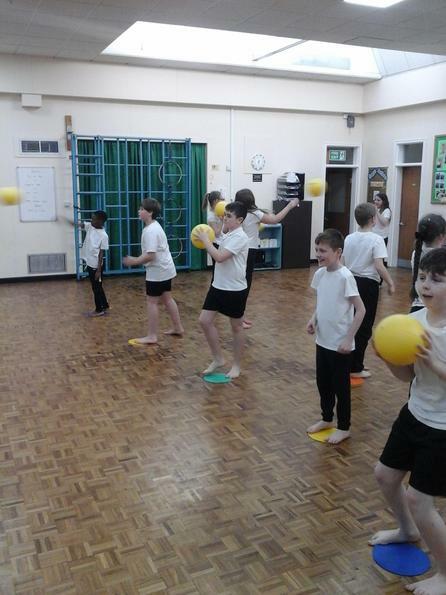 This term, in PE, we are starting to practice different ball skills for use in various games.We started by passing the ball to each other, first by throwing then by bouncing. 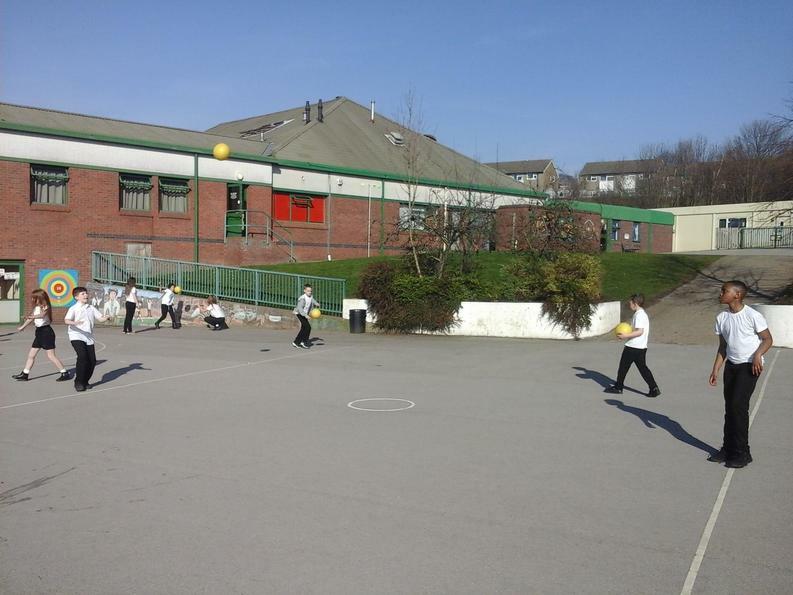 Finally we used our ball skills to play a game of piggy in the middle. 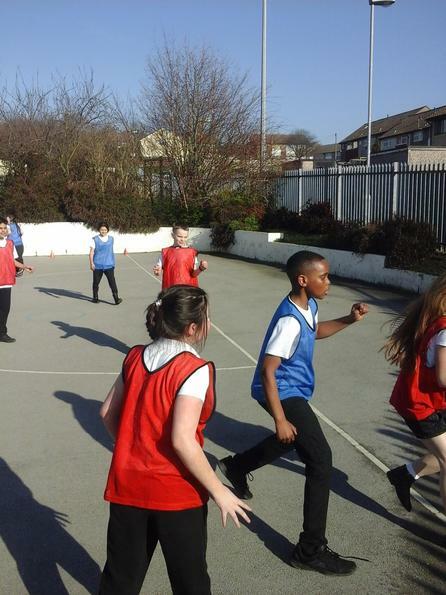 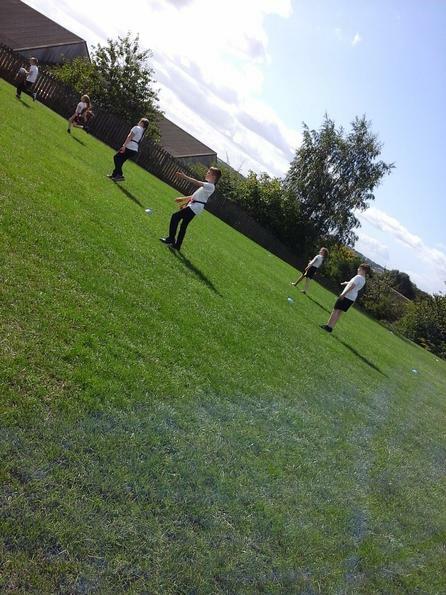 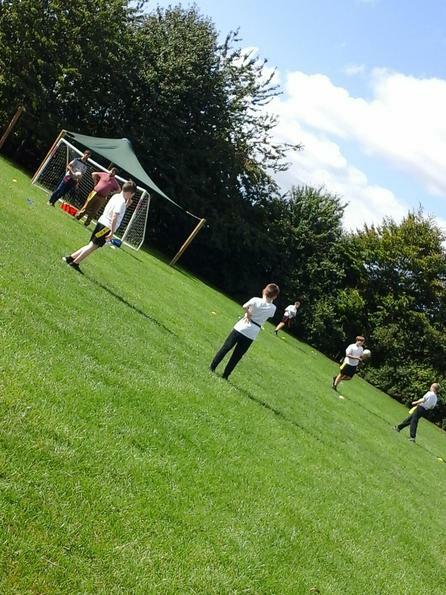 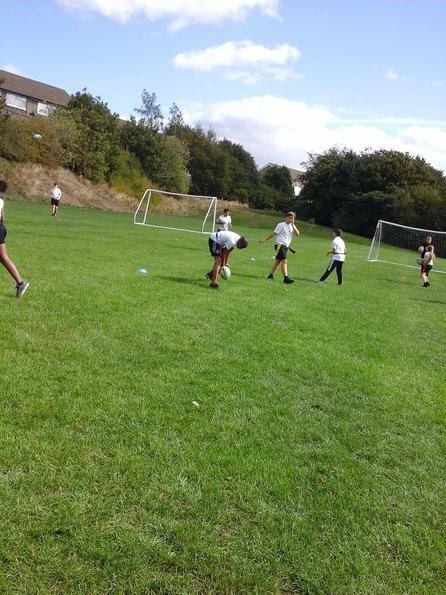 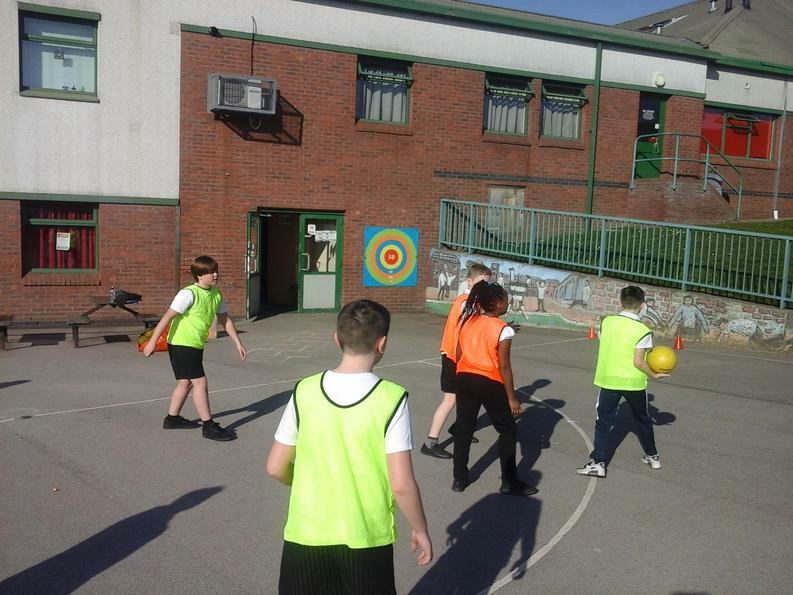 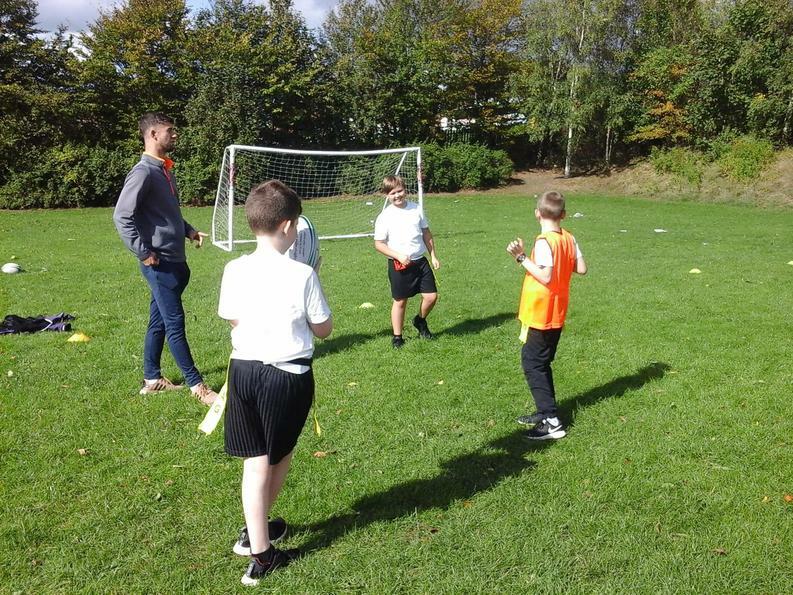 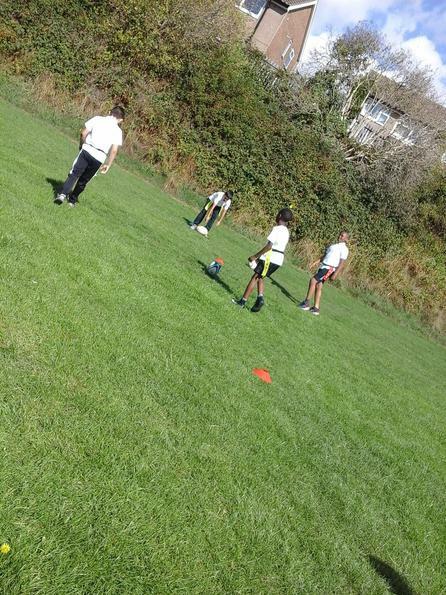 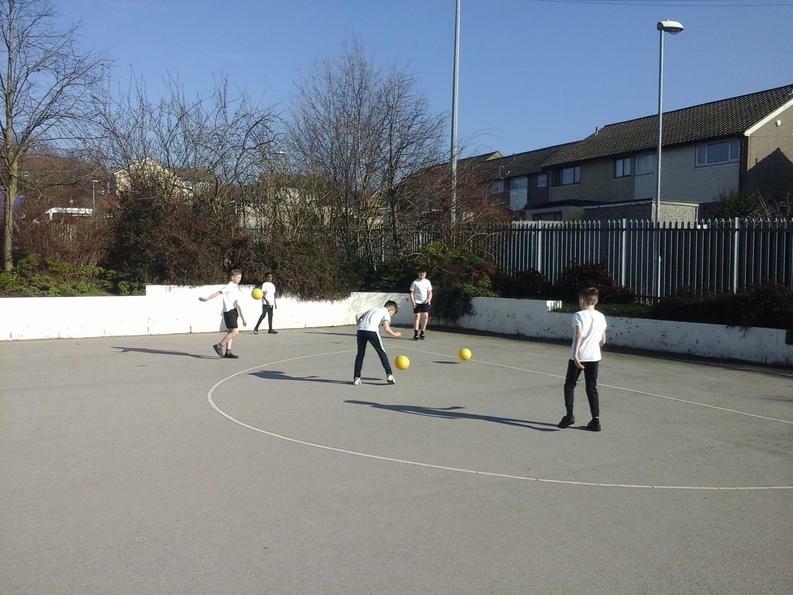 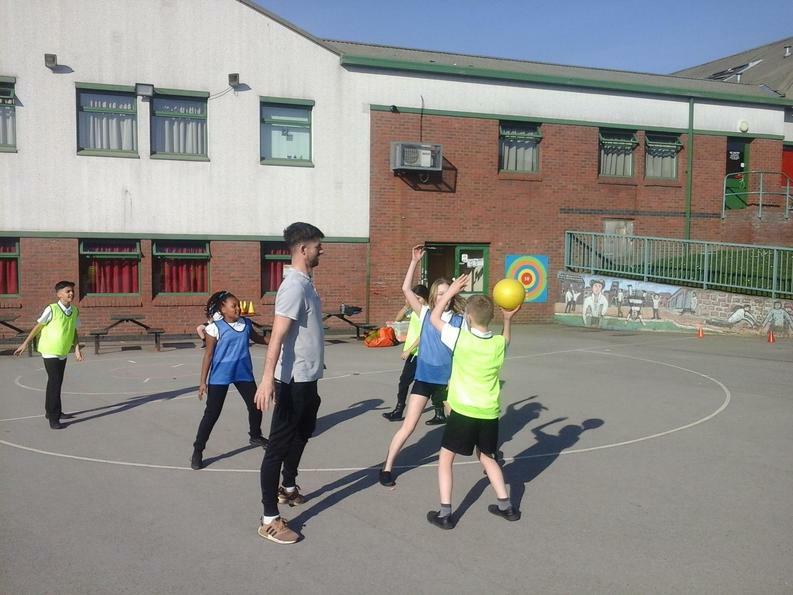 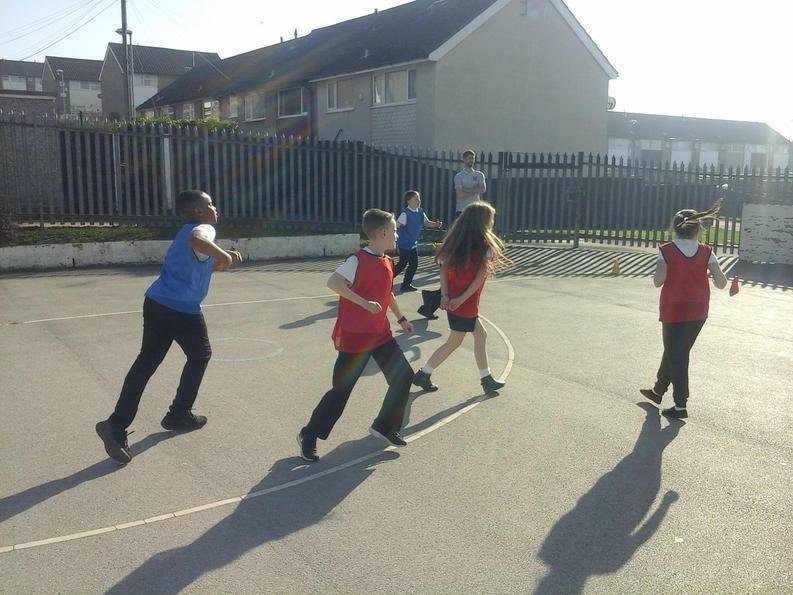 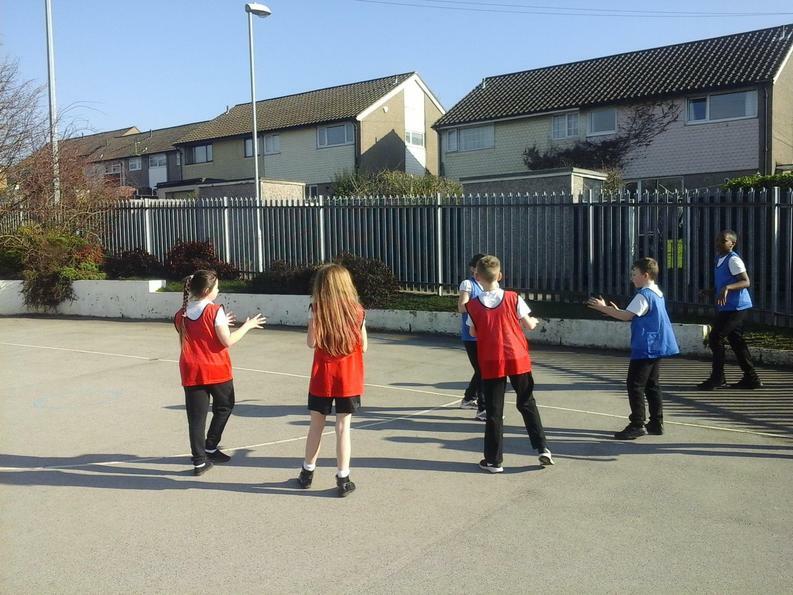 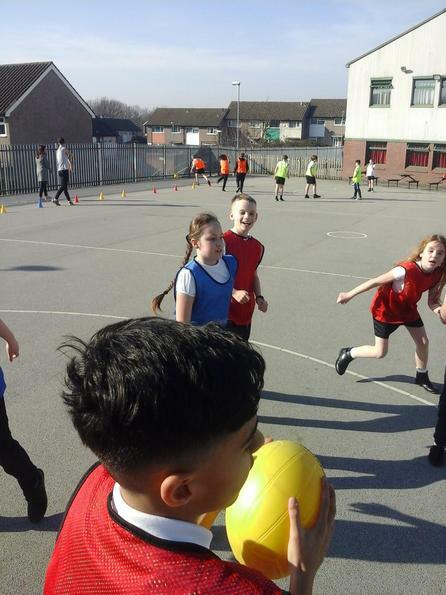 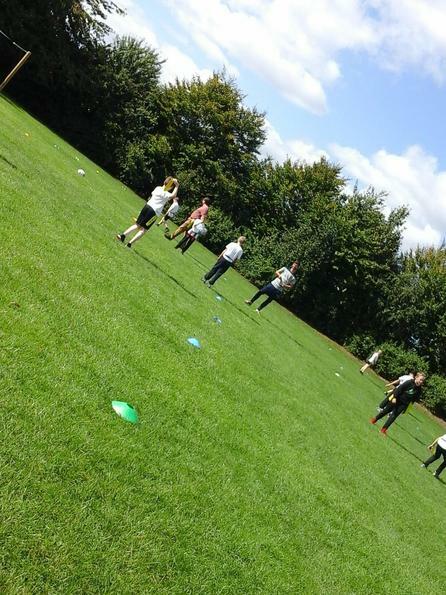 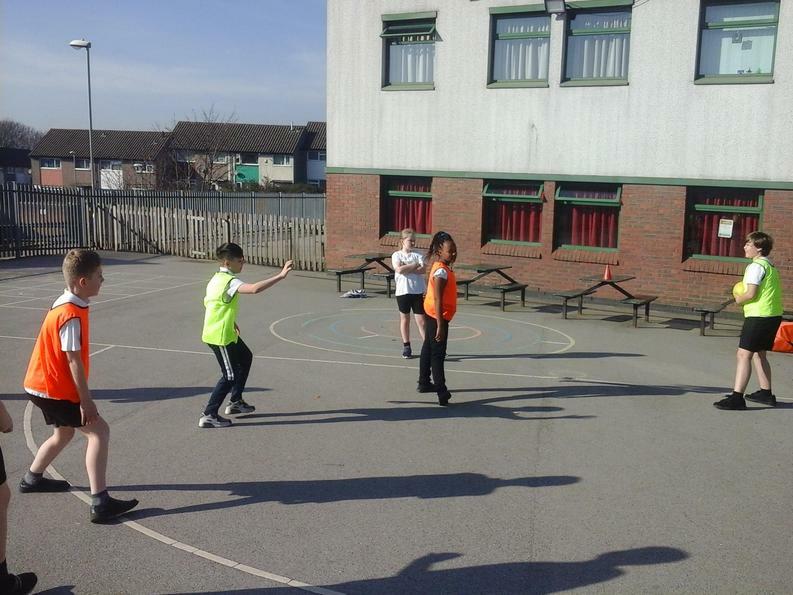 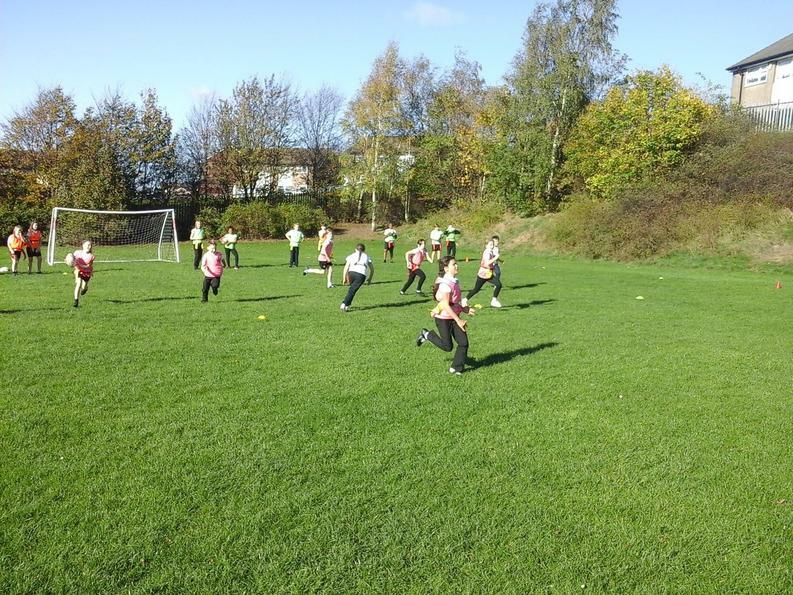 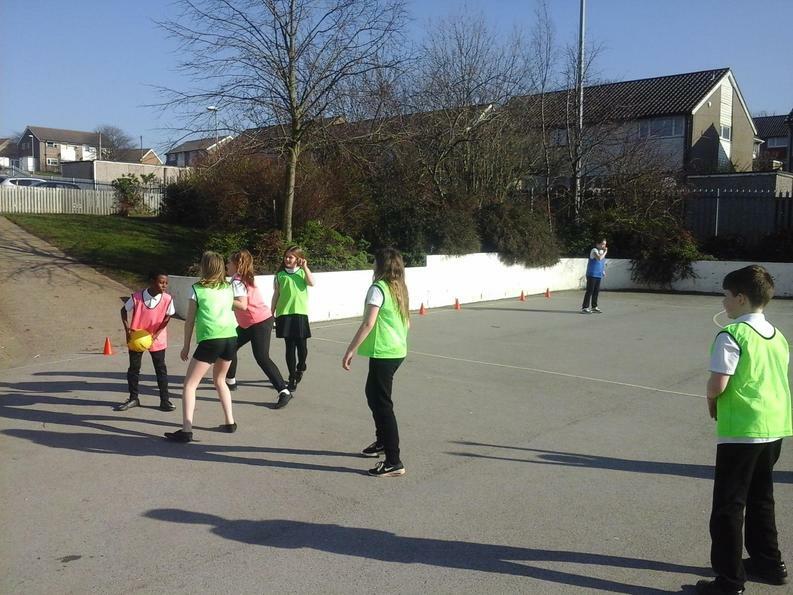 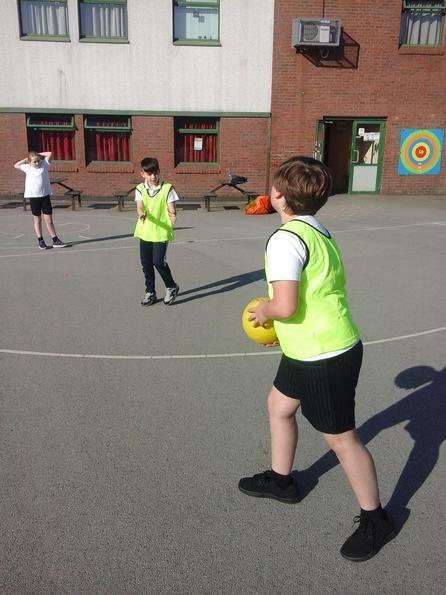 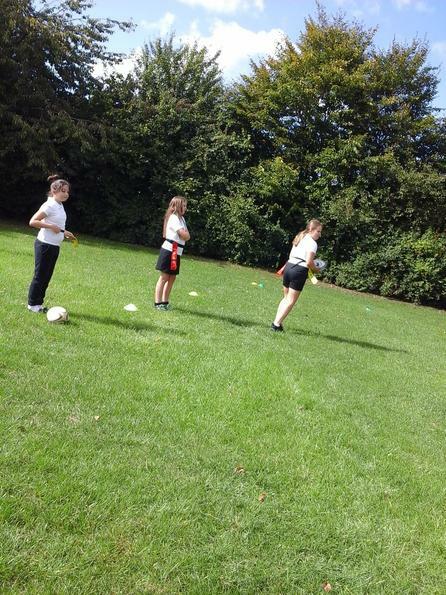 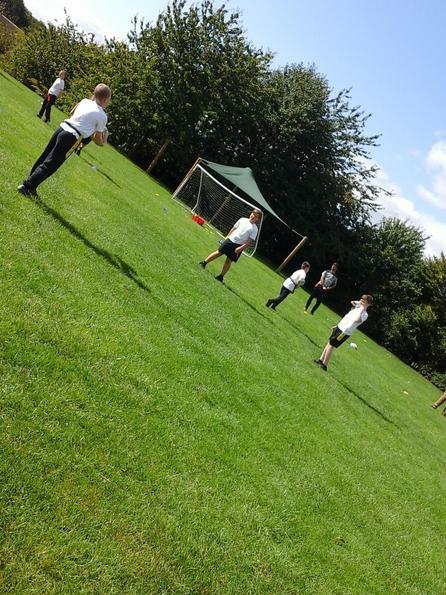 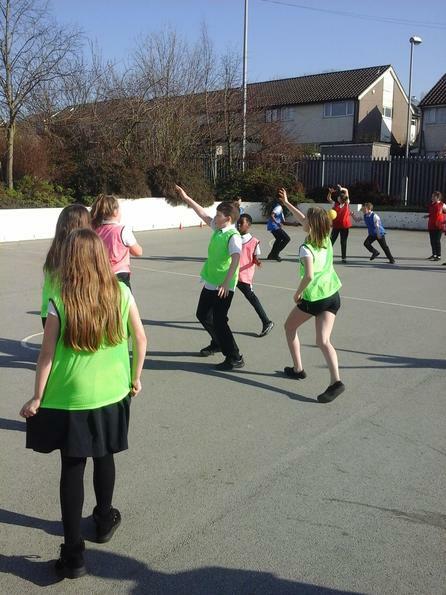 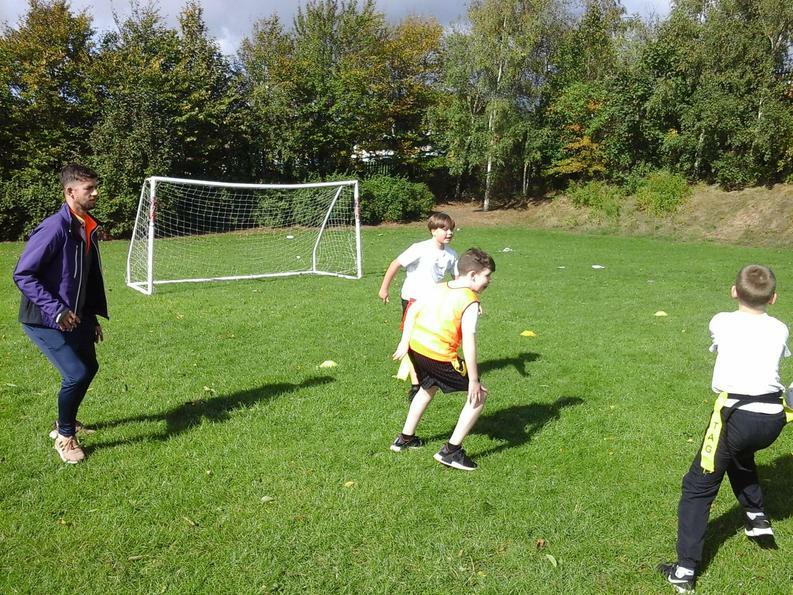 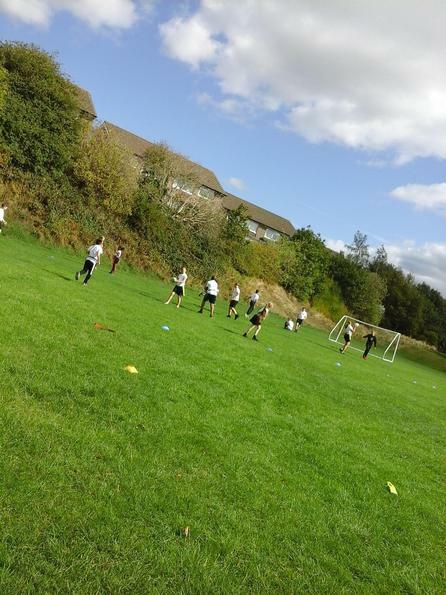 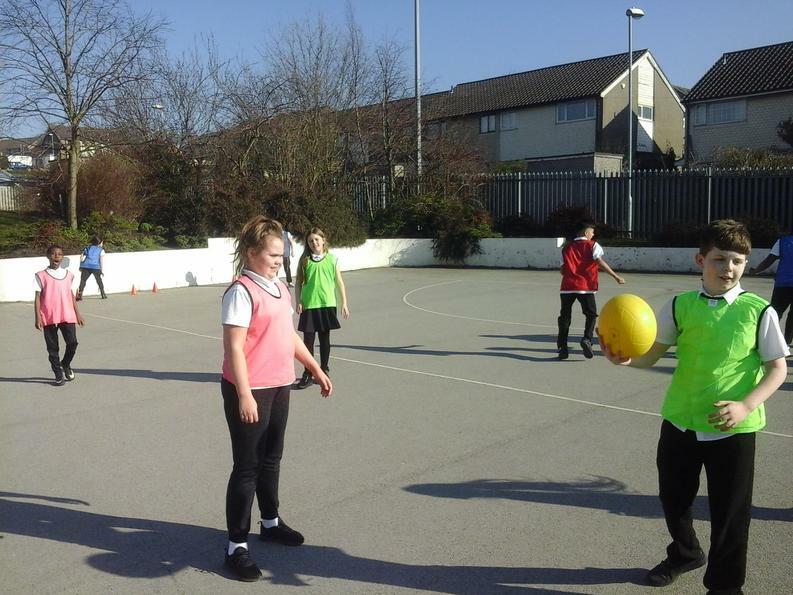 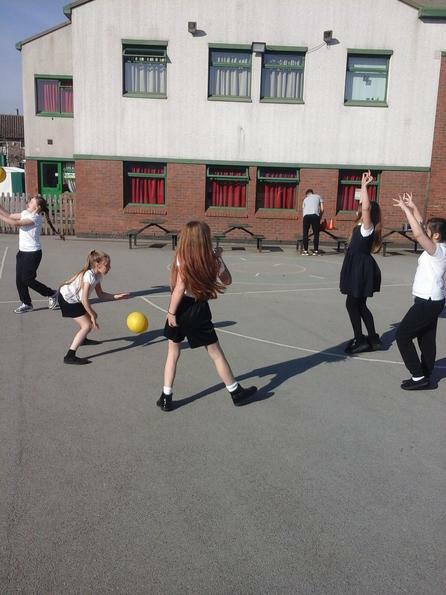 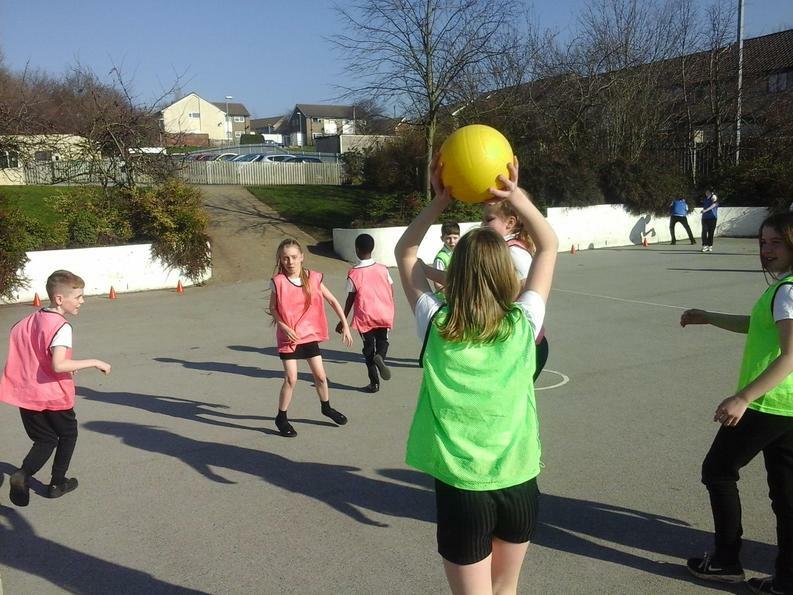 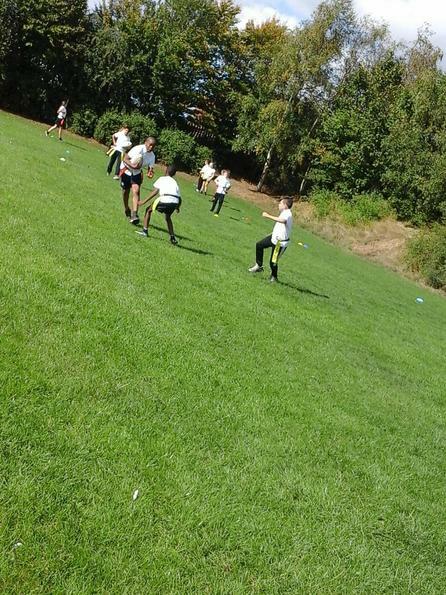 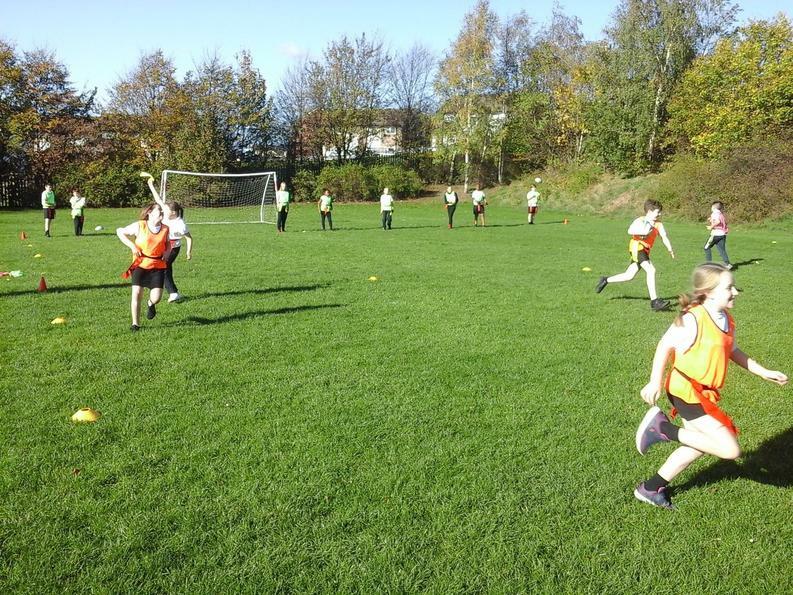 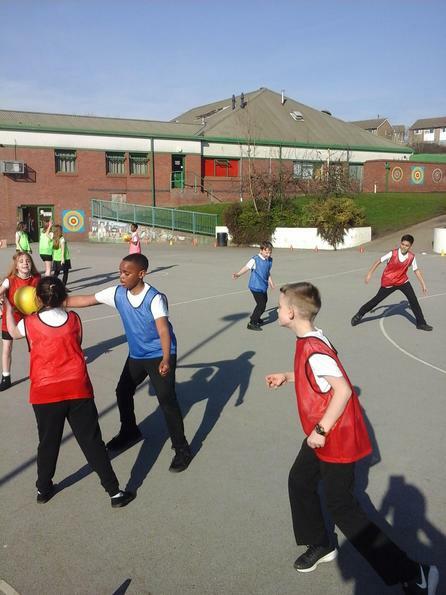 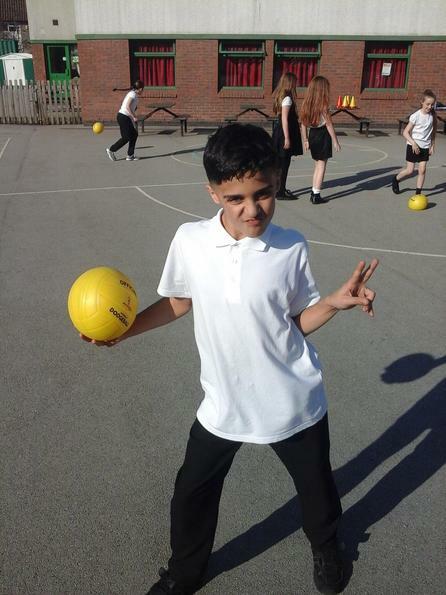 Outside, in the beautiful sunshine, we practiced more ball skills in a series of games which involved passing and shooting the ball while keeping it away from the other team who had to try and intercept the ball when it was thrown. 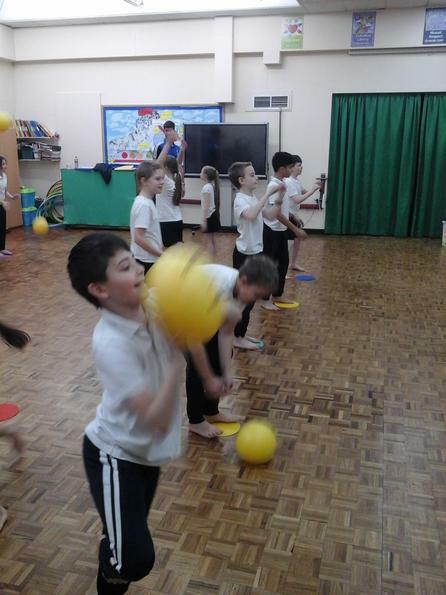 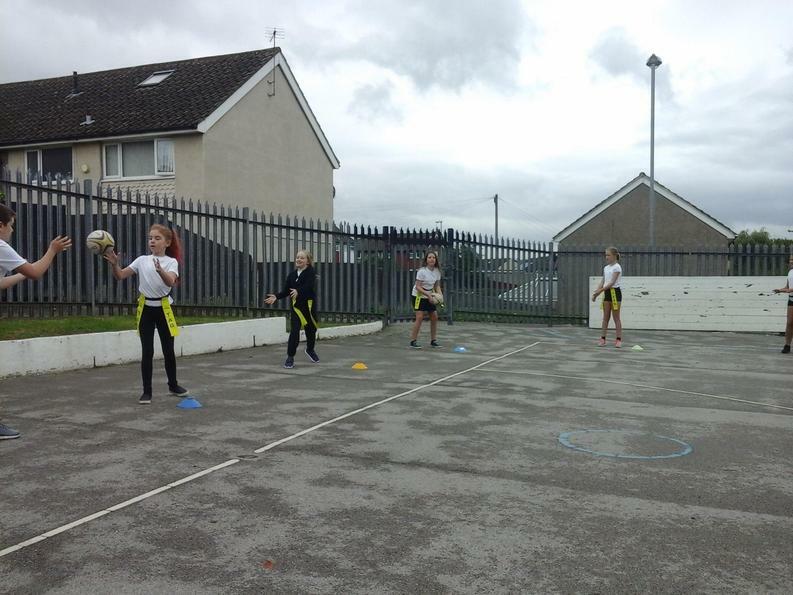 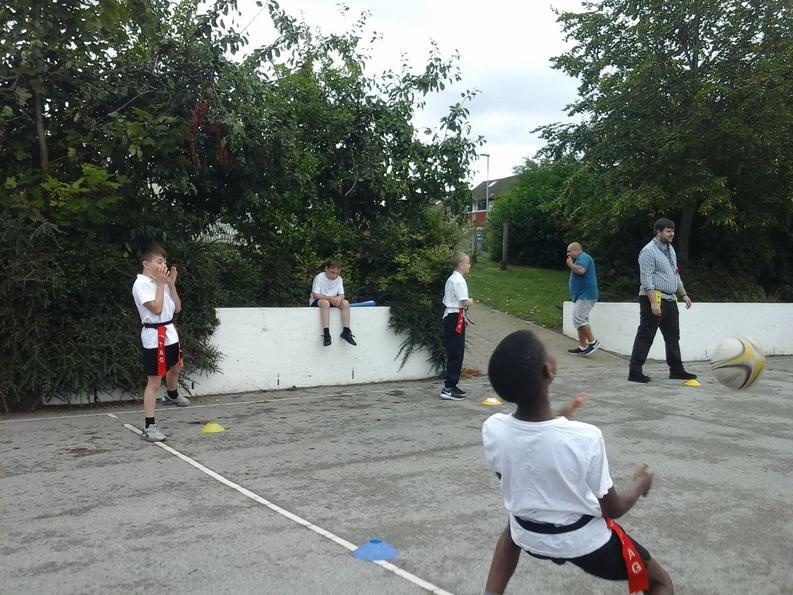 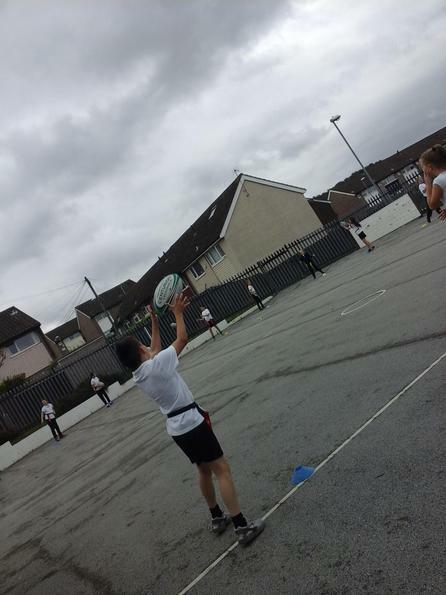 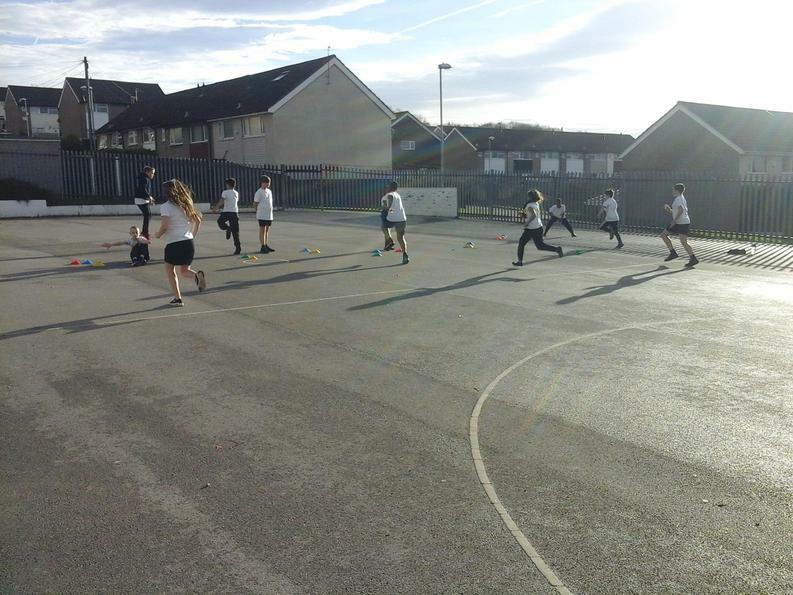 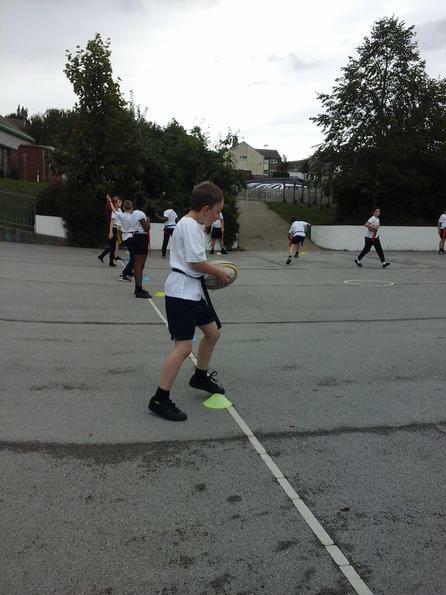 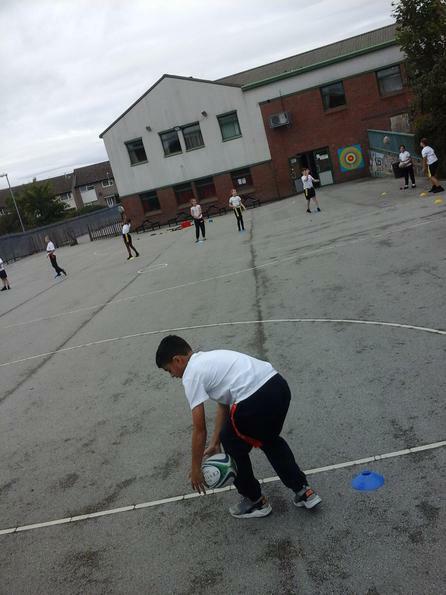 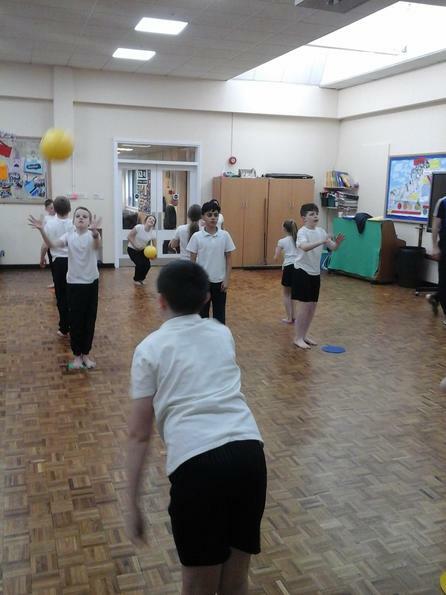 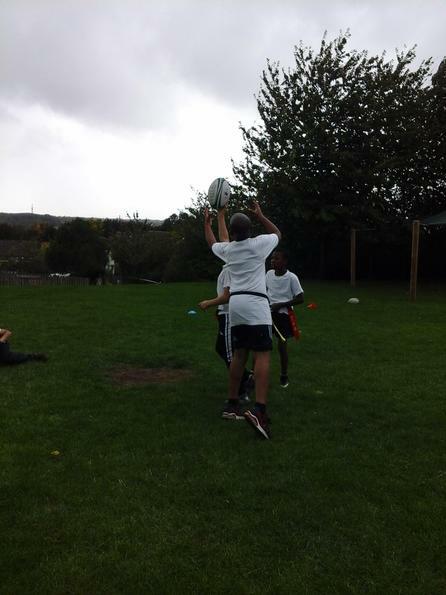 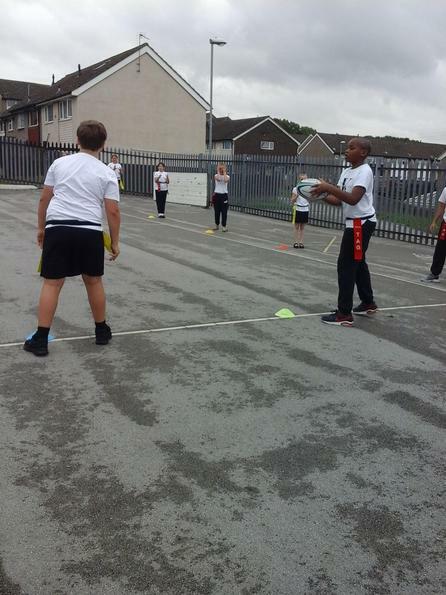 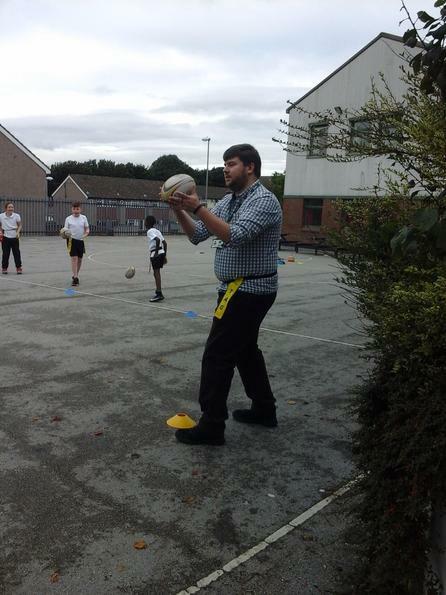 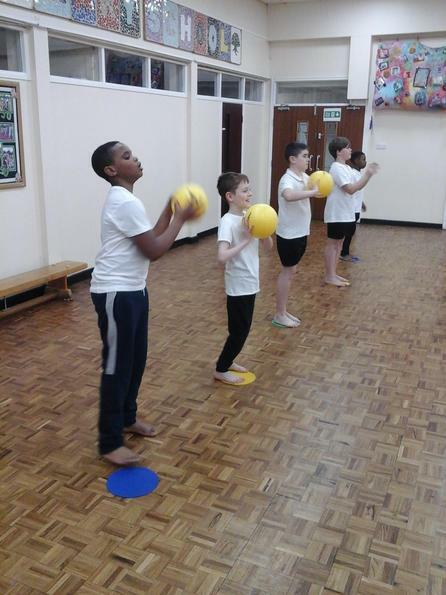 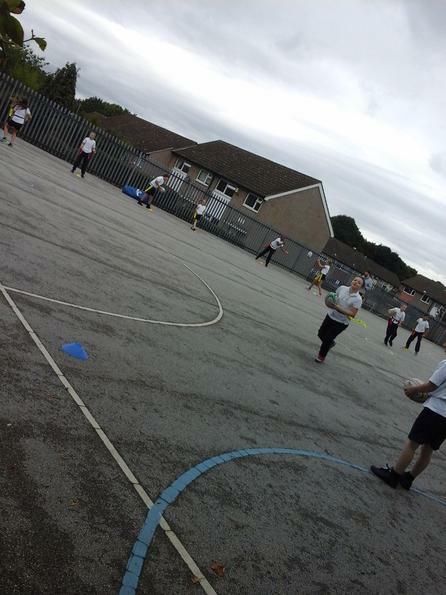 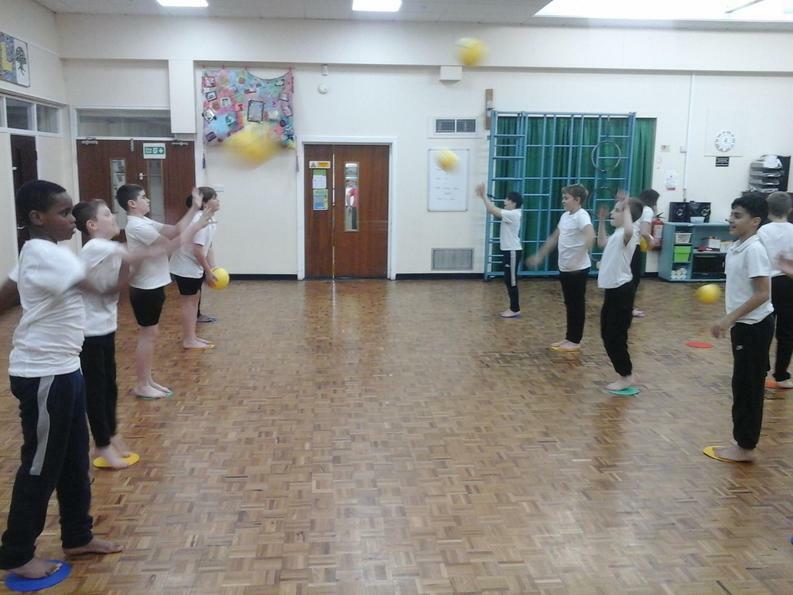 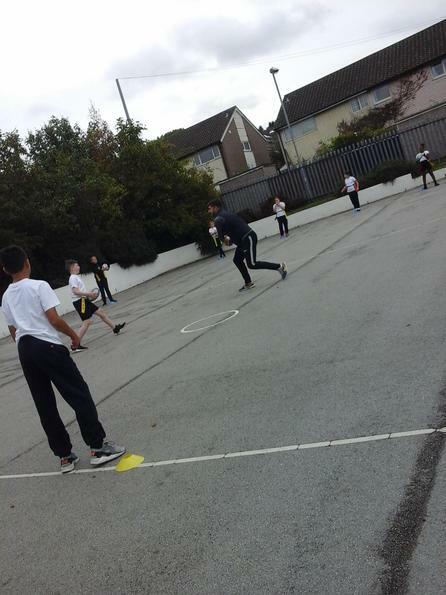 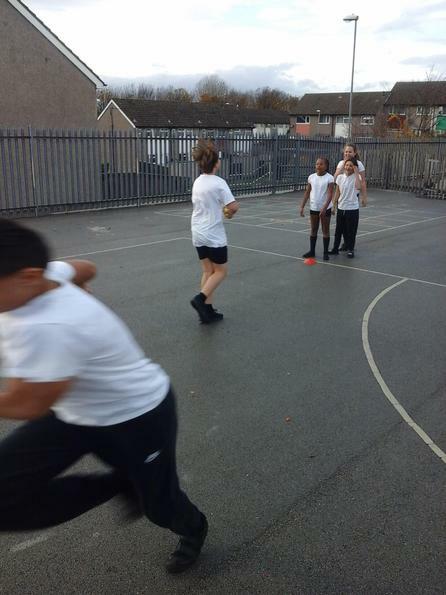 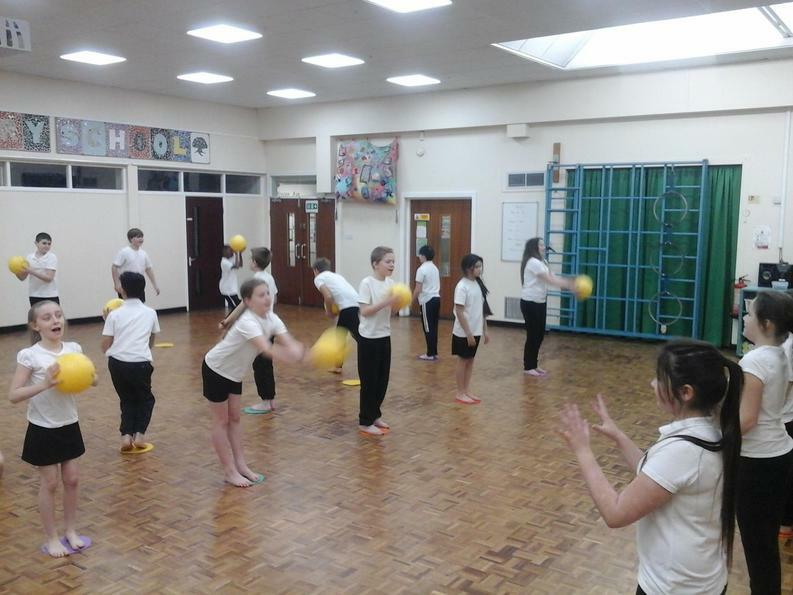 Our next PE lesson was forced inside by the weather, We played a variety of games utilising our ball skills. 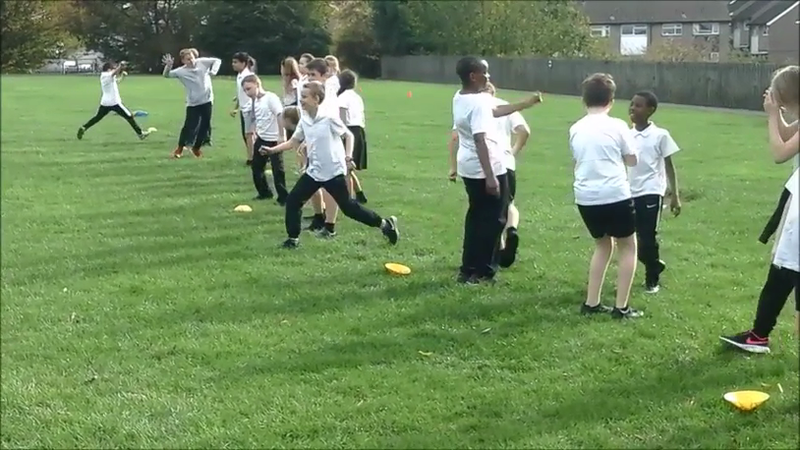 The first involved throwing balls at a rugby ball and trying to knock it over the opposing teams line. 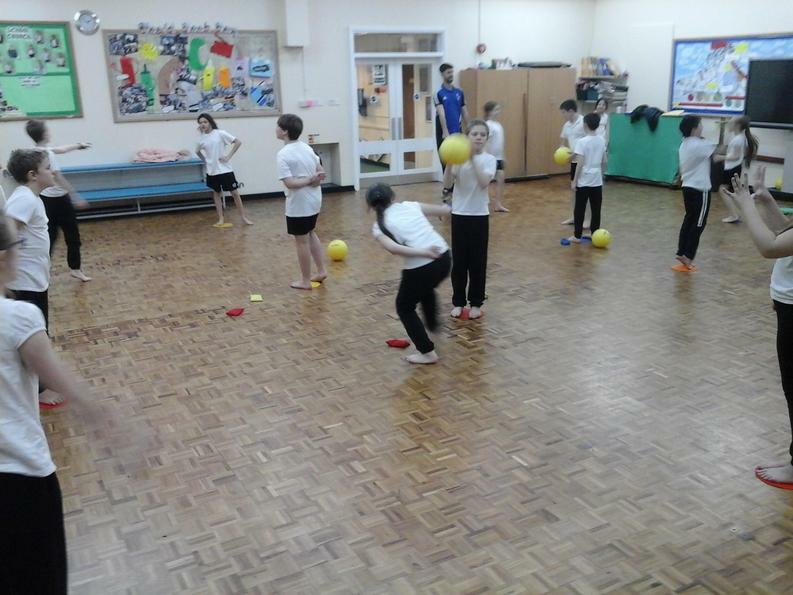 Another game we played was dodgeball - trying to hit the other team while catching the ball to avoid being hit ourselves. 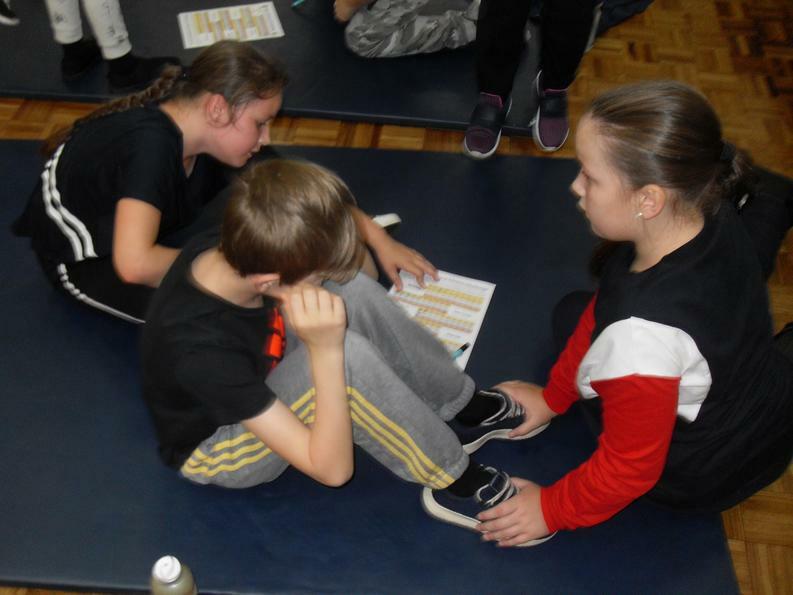 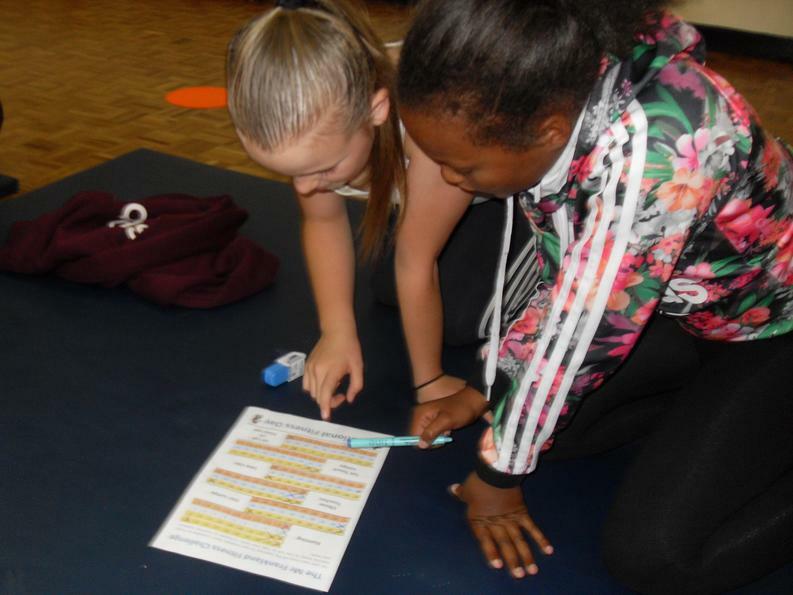 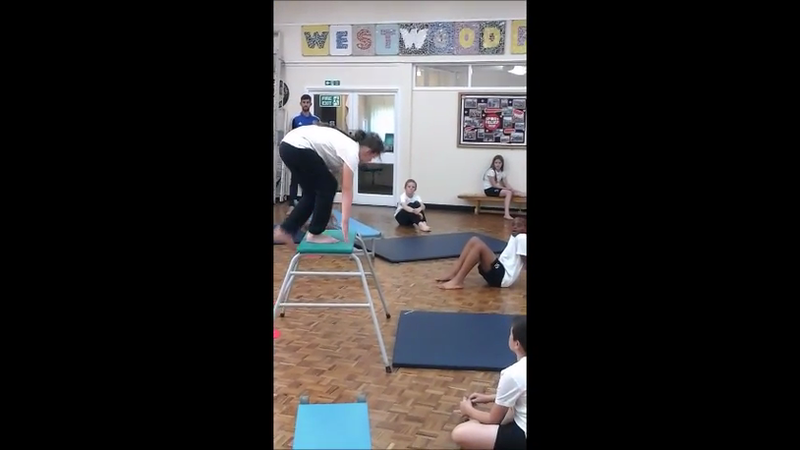 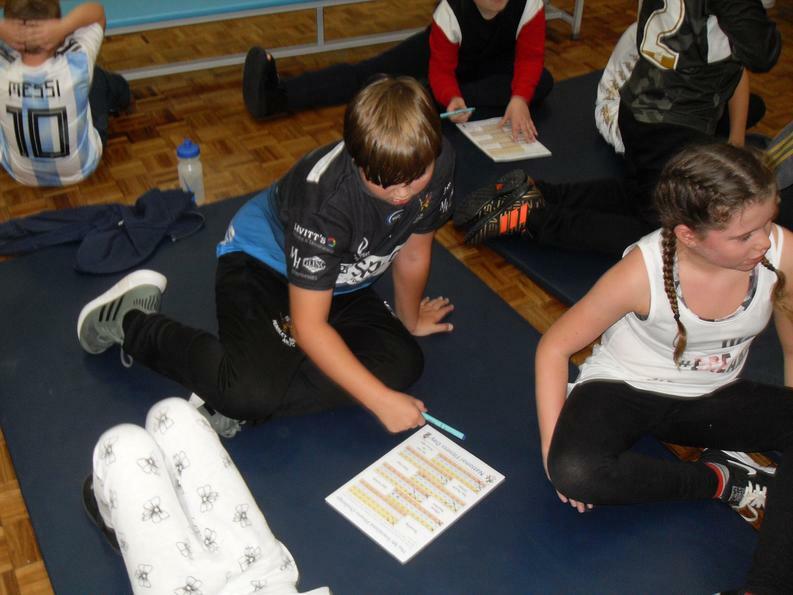 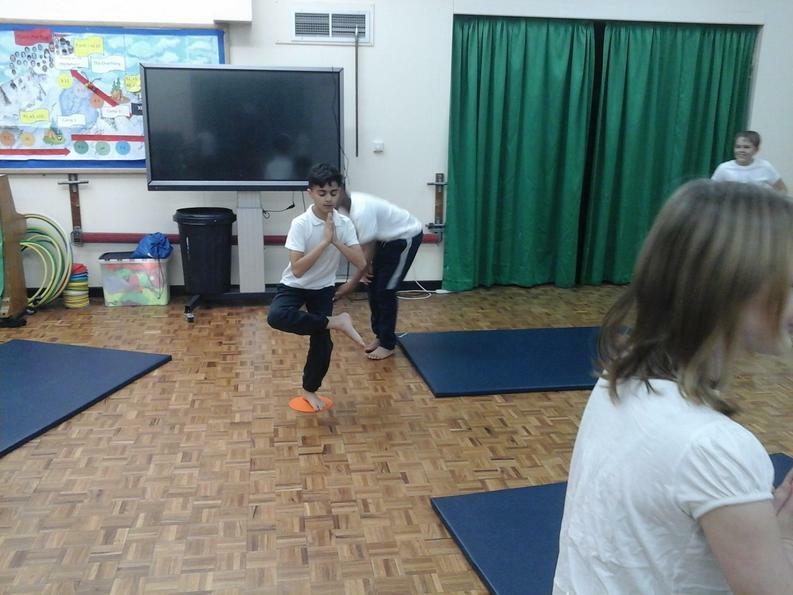 As part of our fitness module, we evaluated our fitness so we could test it again later in the term and see if we had improved. 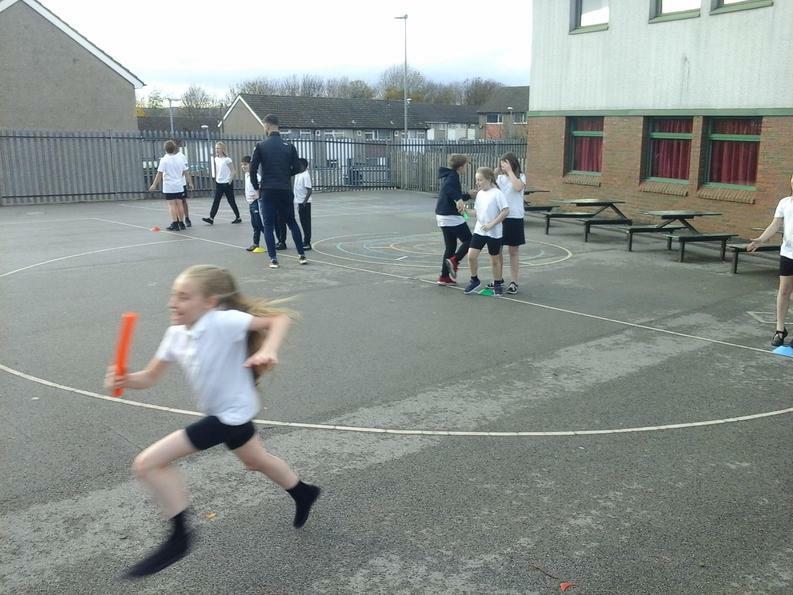 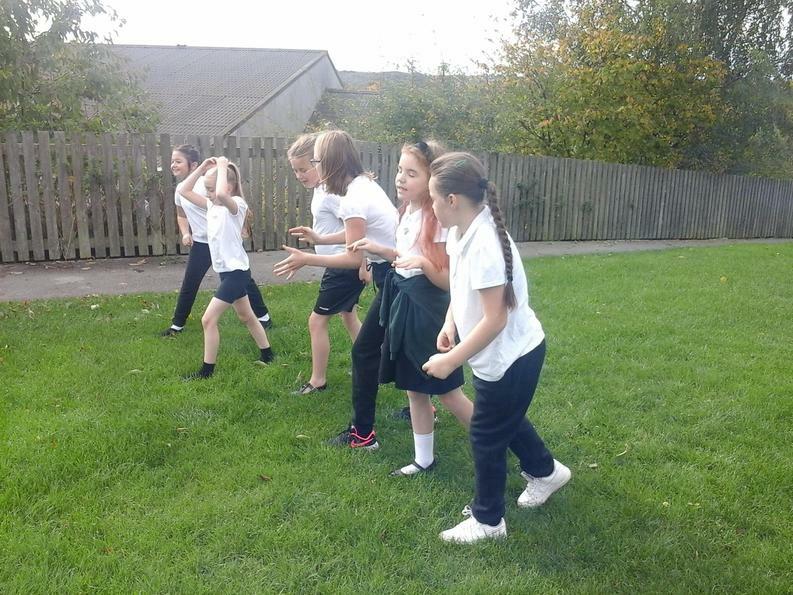 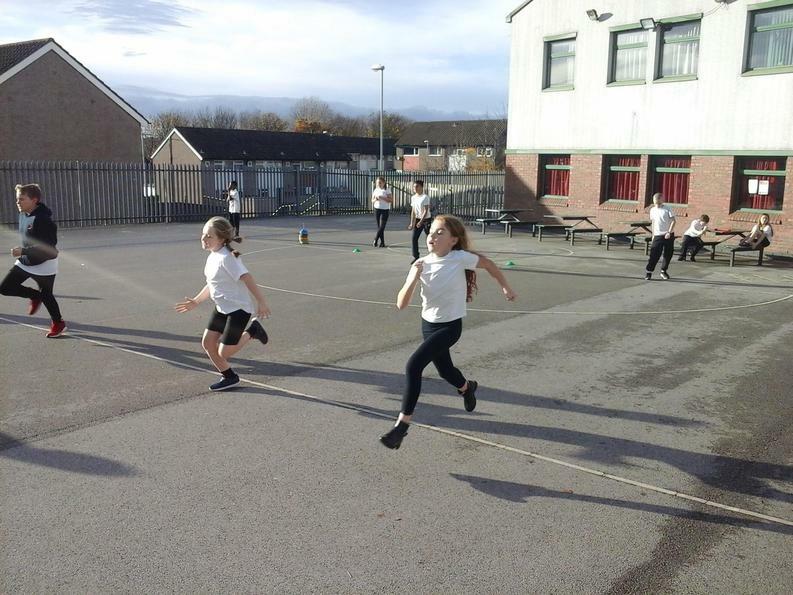 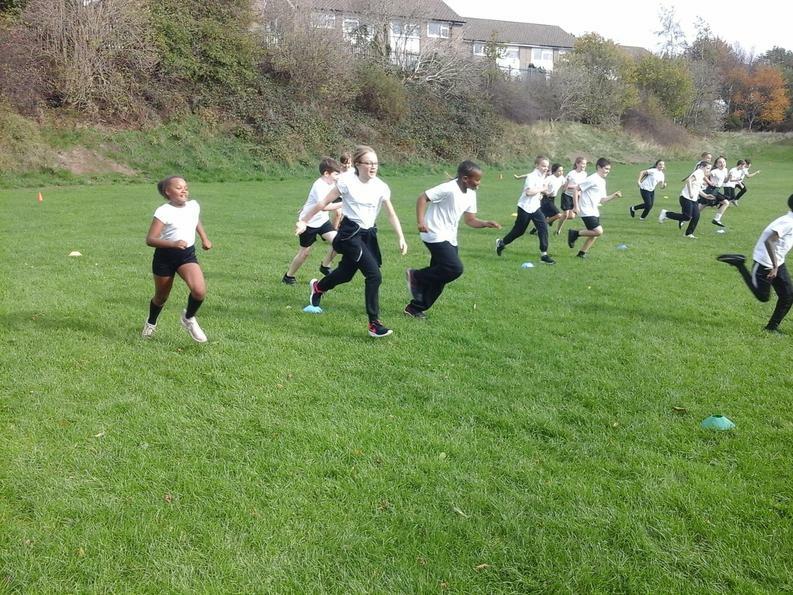 We tested our muscular fitness by seeing how many sit-ups we could do in 30 seconds, our coordination by seeing how many one handed throw and catches we could do in 30seconds and finally tested our cardio-vascular fitness by doing the Bleep test outside on the playground.